Friday 29th. 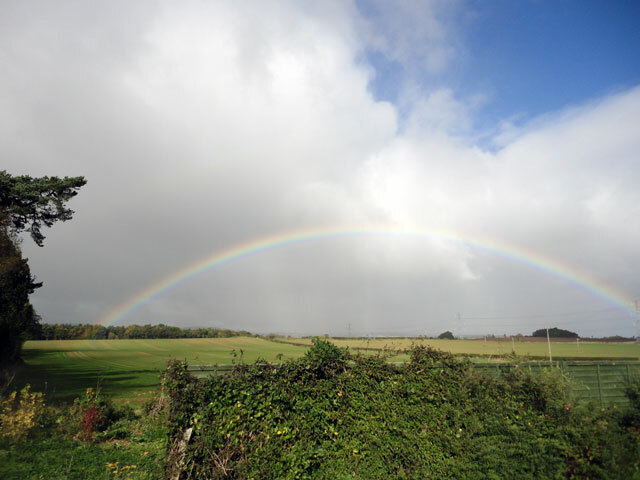 November, 2013 – A Wonderful Day! Sunday 17th. November, 2013 – Sundays are Good! Friday 15th. November, 2013 – And another great day. Thursday 14th. November, 2014 – First Phase completed! Awoke, showered, walked the dog and breakfasted before loading Mum, Cathy, Rachel, Mix and Rowan into the car and driving to Holy Island. We arrived there just before eleven and discovered that we had almost a four-hour window to cross the causeway and enjoy the island. In fact we didn’t use all of that time partly because the island was incredibly windy (Mum was left clinging to a lamppost) and partly because most things were closed because the season had obviously ended at the 31st. October. However we walked into the village and saw the Church of St. Mary which is next to the remains of the old Saxon Church and the remains of the Priory which is now looked after by English Heritage. The parish church stands on the site of the wooden church built by St. Aiden in 635 AD and it was this church which during the Anglo-Saxon period was replaced by a small stone church. 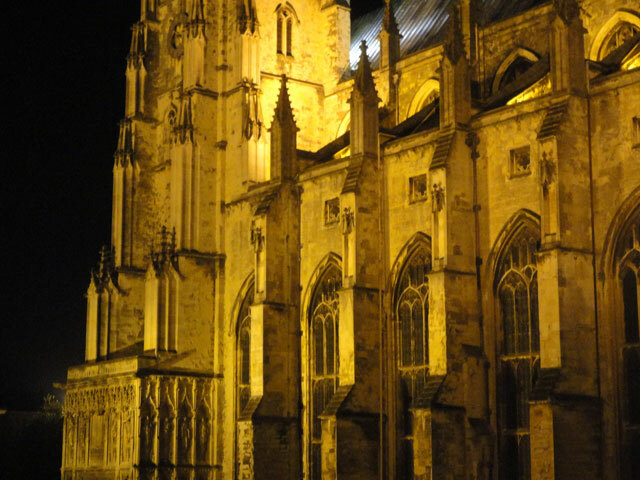 It was the Benedictine monks of Durham who established this as the parish church in the twelfth century. Since the Reformation the church has been an Anglican one. Outside the priory is a statue of St. Aiden – I had initially confused it with St. Cuthbert because of his association with this place. 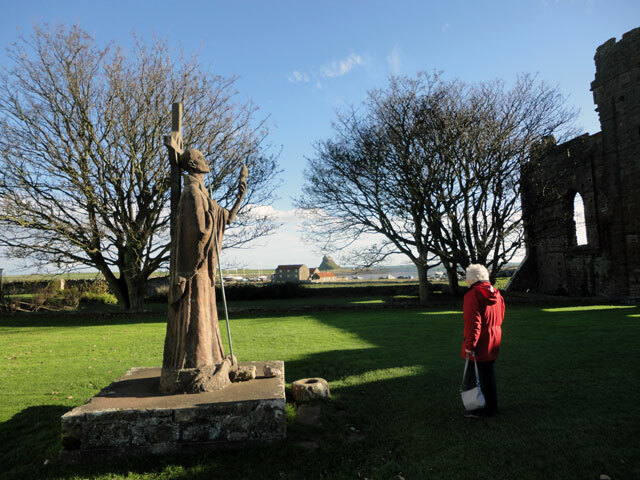 In fact, inside the church there is a sculpture in elm called ‘The Journey’ which shows six monks taking St. Cuthbert’s body from the island on a journey across the north during the time of the Viking raids. The leaflet in the church says that the famous saints associated with the island are Aiden, an Irish monk and remarkable missionary from Iona who founded the monastery and a school on Lindisfarne; and Cuthbert, a solitary leader and healer who struggled with the conflict between demands of the world and his calling – but there is also a bust of King Olaf of Norway who sent a letter apologising for the Viking raids which terrorised so much of this part of Britain. We also saw a facsimile of the Londisfarne Gospels and admired the Reredos with pictures of Columba, Oswald, Aidan, Wilfrid, Cuthbert and Bede. Outside the little church the wind was blowing and we all helped each other back to the car, noticing on the way the sign outside the National Trust Shop telling us that the castle was closed. We drove as near as we could so that we could get a look at the castle and then set off for Bamburgh again aiming for the castle. 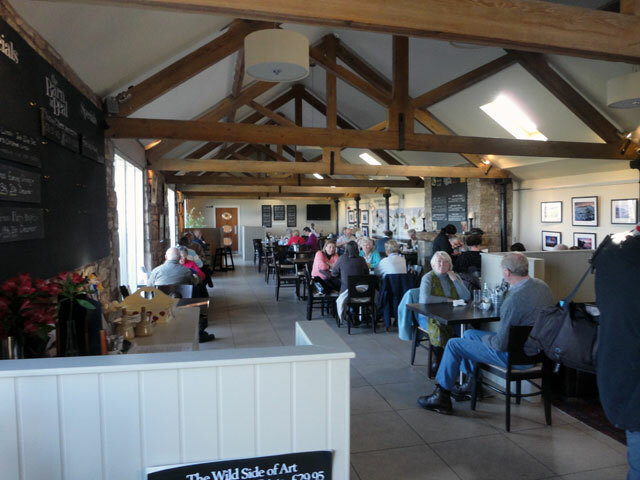 On the way we stopped at the Barn at Beal, a rather splendid restaurant for walkers and holiday makers. 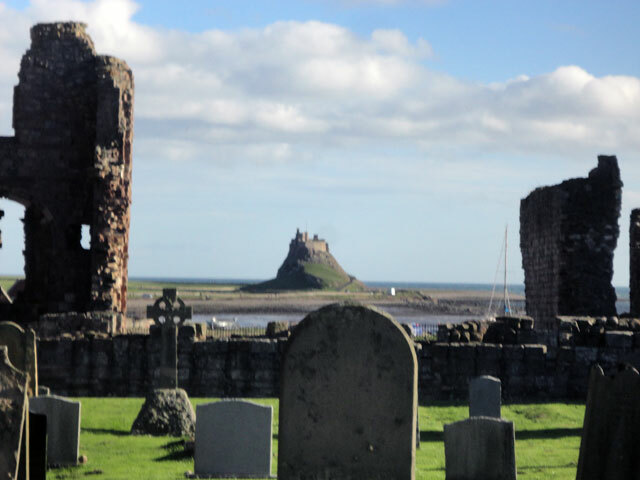 We were served an excellent meal (I had scampi and chips) and then we continued on our way to Bamburgh Castle. This castle too was closed – off season it is only open at the weekends – but we were able to walk around it and get a good look at it from the outside. It is so familiar not least from all of the many films in which it has appeared. (We passed the Lord Crewe Arms where Rachel and I stayed during our honeymoon.) 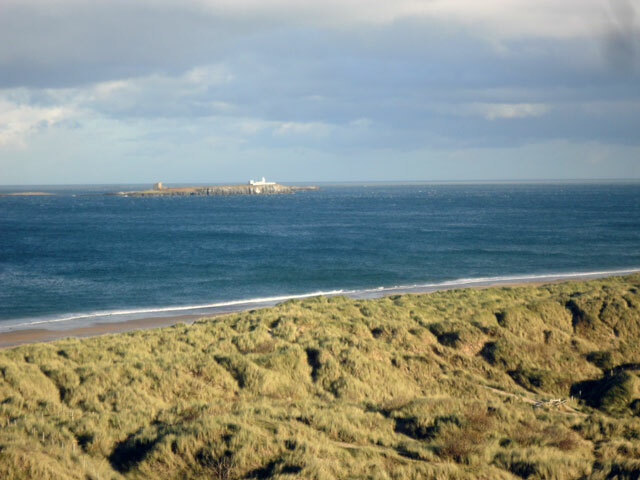 From here we drove to Seahouses, seven miles south of Bamburgh. Mum had stayed here for a week with Dad when they were at Galashiels and came to visit their Boy’s Brigade camp. 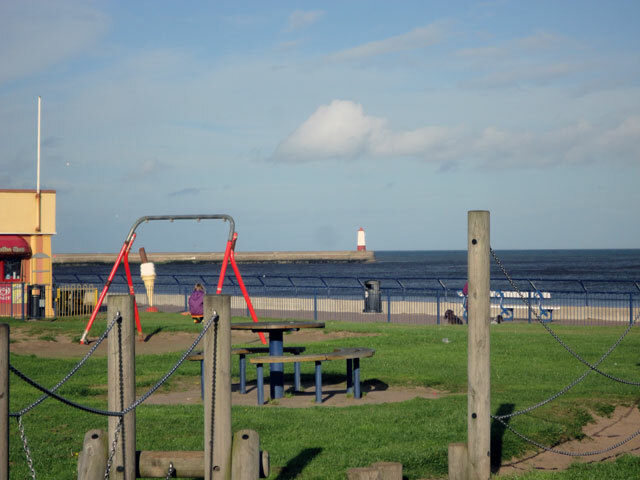 Having toured Seahouses – it seemed larger and more prosperous than I remembered – we drove back to Mount Pleasant. It is really good having so many places so near to where we now live. Olive had returned from her teaching at Dundee and we all dined together in the evening. Then, Cathy and Mum came over to the Granary and we watched ‘Yes, Prime Minister’ and an episode of ‘Only Fools and Horses’ (one of my father’s favourites) while we had tea, coffee, snowballs and wagon wheels for supper. It had been a really good day. Awoke and walked mix before breakfasting on bacon and egg made by Cathy in the Farmhouse. Dealt with some emails and got my blog up to date as well as preparing the music files for Arrochar’s Remembrance Service this Sunday before taking Mum into Duns to attend the reading group at the local library. Collected her an hour and a half later and noticed that outside the library there is a point to enable electric cars to be charged while their owners visit the library – that’s pretty good! Back home we decided to go for a short outing to Coldstream which is about nine miles south of here on the banks of the river Tweed and therefore right on the boundary between England and Scotland. 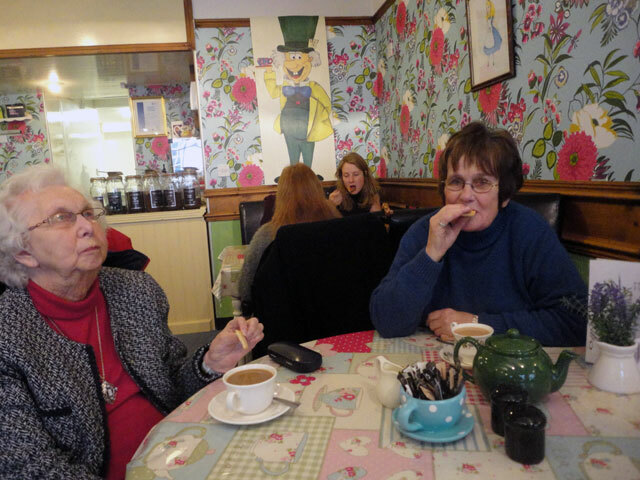 Cathy, Rachel, Mum and I went into a little cafe themed on the Mad Hatter’s Tea Party and enjoyed cream of onion soup and a sandwich (in my case cheese and pickle). We visited an Army surplus shop on the main street. In addition to selling ex-army equipment and clothes it had a splendid little museum of the second world war. We wandered around it and even sat inside an Anderson Shelter. 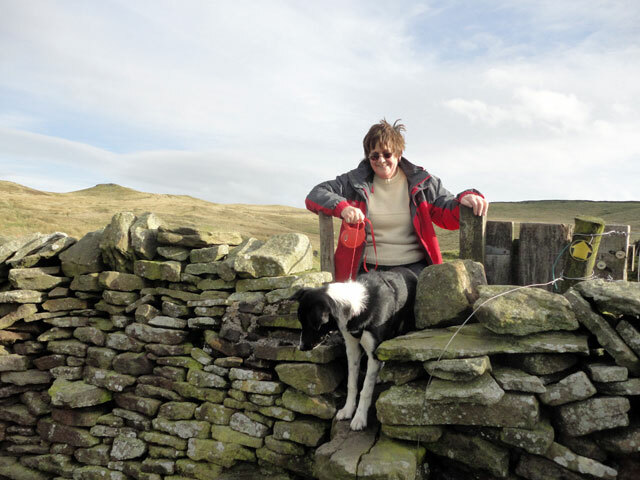 Cathy bought a breathable and waterproof army fleece so that she is set up for the winter! We explored the streets of Coldstream and, as the light began to fade, we returned to the car and made our way back to Mount Pleasant. I walked Mix and gave him his tea and played with some of the photographs I had taken while we were out (you can do that when you are retired)! Digger had prepared an excellent dinner – pork, potato and leek ‘briquettes’ and ‘black cabbage’, followed by banana splits. Afterwards we sat in front of the tv and watched David Suchet as Poirot in his penultimate performance in the role. Managed to stay awake for the news and Newsnight which tonight were dominated by job cuts on the Clyde and at Portsmouth, with the suggestion that the Clyde can continue to build British warships but only if it remains within the United Kingdom. Up and walked the dog and then enjoyed breakfast with Mum and Cathy in the farmhouse. Started sorting out my finances and then drove Mum into Duns to have her hair done, returning to collect her an hour later. Worked on my papers, getting everything in order for my retirement during the afternoon, and then, after walking Mix, we all dined together in the farm kitchen: sausages, potatoes and carrots. It really was just as I remembered it from childhood days. Afterwards we watched the concluding part of a Lewis which we had started to watch yesterday and I haven't a clue what happened as I promptly fell asleep -- I think it was coming from the cold of firework-watching to the lovely warmth of the granary lounge! Up and walked Mix and then breakfasted. Tom arrived and we took the big TV off the wall in order to fit extra connections behind the screen. Got the TV connected to the internet and discovered that I can now access the internet on the TV – including the BBC and ITV i-players. I spent some time on the internet: we were given a very generous cheque by our congregations when we left Arrochar and Luss. We’ve thought to spend the money on a summer house – so I wanted to see what was available and also what planning permissions were required. I discovered that as long as our summer house fulfils certain conditions about its size, position and use, no permission is required. Tom arrived and we went off to Pearson’s to see what they had on offer in terms of summer houses. We also enjoyed coffee and chocolate at their restaurant. Then it was into Duns itself to post letters. From there we went on to Tom’s home to see his zoo – four goats, many hens – some hand-reared – 10,000 bees, two cats and one dog. Dorothy (who had been busy making coats for the goats) came back with us to Mount Pleasant to see Mum and Cathy. Mix enjoys the farmhouse too! Did some more research and then we dined in the farm kitchen on mince, carrots and potatoes followed by birthday cake and ice cream. In the evening we all watched a BBC2 programme in which a group of folk from P & O were moulded into a choir and then the news and Newsnight before bed. Up and walked Mix on the Swinton Road, had breakfast in the farmhouse and then Mum, Cathy, Rachel and I went off to Church at Gavinton – the minister spoke about Saints, appropriately given that this is the season of ‘all saints’. After the service we had coffee in the hall before making our way home to get the Granary ready to provide drinks for everyone at noon to start the celebrations for Digger’s birthday. At noon, everyone arrived – Digger and Olive, Mum and Cathy, Peter and Veronica, Scott and Sue. Rachel had prepared an aperitivo and some nibbles. 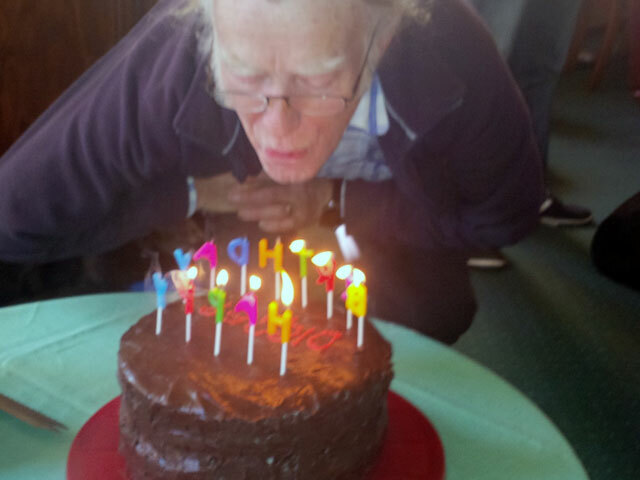 Then we all moved to the farm house for a buffet meal: curry, sweet and sour, cheese and a large chocolate birthday cake. Later in the afternoon Rachel and I went into Duns to walk the dogs around by Duns Castle. We got some cash from the machine to make our food contribution (it’s just like the TV series ‘Bread’ – we even have a china hen under which the cash is kept). We bought Digger’s present (a voucher from the Garden Centre to go with the books about vegetable growing given by Mix and Rowan). While we were all sitting round the fire in the farm house, Alan Cartwright, the minister from Swinton (and also Fogo) arrived to visit. It was really kind of him and I enjoyed meeting him. It seems that we are in Fogo parish. Next Sunday there is a service at Fogo Church at 3.30 in the afternoon (it is Remembrance Sunday) and I will try to attend. Later we enjoyed a snack meal before moving back to the Granary with Cathy and Mum to watch Downton Abbey. And then, after walking Mix, and everyone had gone to bed, I watched ‘The Dukes of Hazard’ – and enjoyed the throwback to my younger years! Realised that today is the first day that I have felt retired – I suppose that it is because I have completed my duties at Luss and also because I will now be at home in the Borders for more than just two or three days. It is going to be good! Even although it was late when I went to bed I read for quite a while, starting ‘Five Dead Canaries’ by Edward Marston. I think that I have read just about everything he has written, it is light but it is also fun and catches the mood of the period – in this case the first world war – excellently. Up and set the fire in the manse, checked the heating in the Church, walked Mix around the paths of the glebe which are not flooded and then got ready for the wedding. Just before it started my bridegroom from last Saturday arrived. What a panic! It seems that last Saturday after the wedding the best man had lost the marriage certificate. It was later found by Cathy on the road, but not before it had been soaked by the rain and run over by several cars. The registrar was not best pleased but had issued a second certificate for the bridegroom to get everyone to re-sign and then return to her. I suppose that it could have been worse! David and Lindsay’s wedding was special – a bit damp, but special – and I was glad that it was so because this was my last ministerial function. By 1 p.m. – the wedding was at noon – I was retired! I caught a brief word with Morag and Bill (it was so good to see then both and then Cathy, Rachel and I, along with the dogs, set off for Luss, arriving soon after 5 p.m. We met up with Olive and Digger’s friends, Peter and Veronica, and we all shared in a lovely meal in the farm kitchen. Later in the evening Mum and Cathy joined us in the Granary where we enjoyed just relaxing in front of the stove in the drawing room. I walked Mix before bed. Got up about nine and after breakfast we started getting the boat in order. I took the toilet cassette off and emptied and cleaned it so that all was fresh for next time. The engine was run for two hours to ensure that the battery is full for when we return. The water and power was turned off – the taps left open to ensure that if things froze nothing would break. The stove was cleaned out and reset – I went off and bought two more sacks of coal briquettes so that there is plenty in hand for when we come to the boat next. We set off for Luss about 12.30 and arrived around 5 p.m. It was an uneventful drive, the only hold up being at the Erskine Bridge. At 6 p.m. we conducted the wedding rehearsal for David and Lindsay’s wedding tomorrow at noon – this will be my final ministerial act (although I will conduct a couple of weddings next year as a friend – but not in Luss Church). After the rehearsal we shared a Chinese take-away and Rachel got on with all of the music preparation which took her most of the evening. I watched an episode of Frost which I hadn’t seen before. We walked the dogs and went to bed. Slept in again before walking Mix and counting 97 boats in the marina today. Went about the ship-board chores. I emptied the toilet cassette, while the engine was charging the batteries. 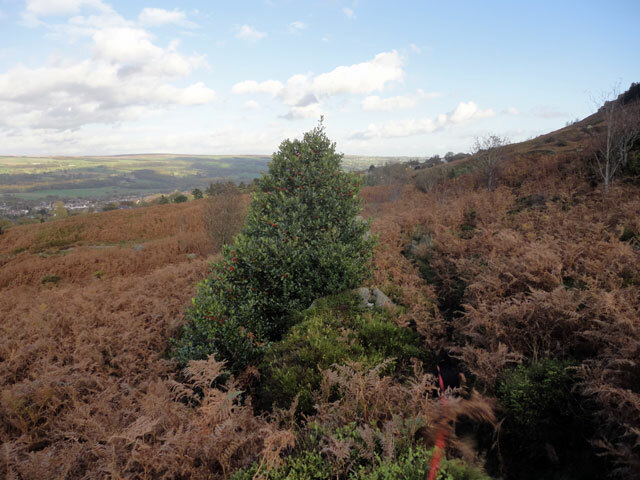 We drove to Ilkley where we walked the dogs on the moor – around a pond which Rachel remembers from childhood. I ’phoned Mum because she spent her honeymoon here. On the way back to the boat we stopped at The Bull for a meal: cauliflower fritters followed by fish and chips. Back on board, the weather turned nasty – it rained and rained so we settled down with our books. I read ‘The Treasure Hunt’ by Andrea Camilleri, and beautifully translated by Stephen Sartarelli. It is one of Camilleri’s best Montalbano books and I would recommend it to anyone. Walked the dogs and got to bed around half-past ten. Really slept in! It was eleven before I got up and, after breakfast, we took the dogs to Skipton where we climbed to the top of the hill overlooking the town. It was mid afternoon before we got down to the car and drove into the town. We found a shop with all walking boots and shoes half-price, with today an extra 20% off. We each bought a couple of pairs and felt that we were really getting bargain. 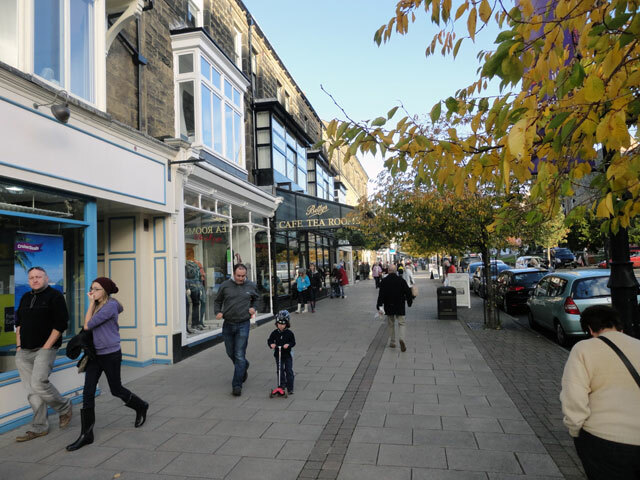 The market was in full swing in Skipton. I bought some licorice but one could have bought almost anything. 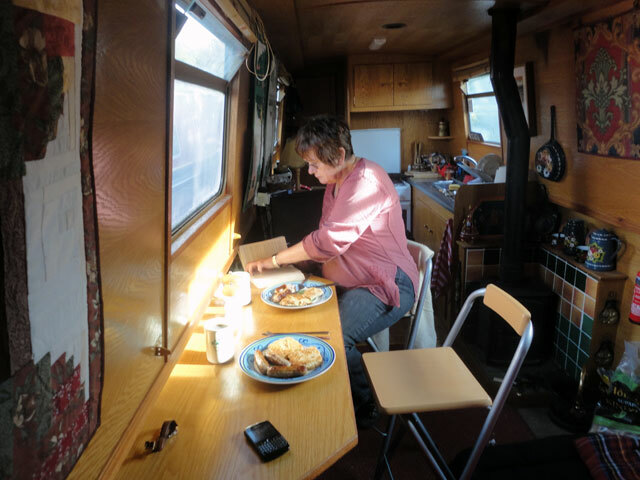 We got back to the boat just before it got dark, for afternoon tea – well, in my case, for Pineapple juice and Eccles cake. Great! We dined on board and then watched ‘Now you see me’ – a strange thriller based on a group of illusionists. Quite fun. Walked the dogs and went to bed. 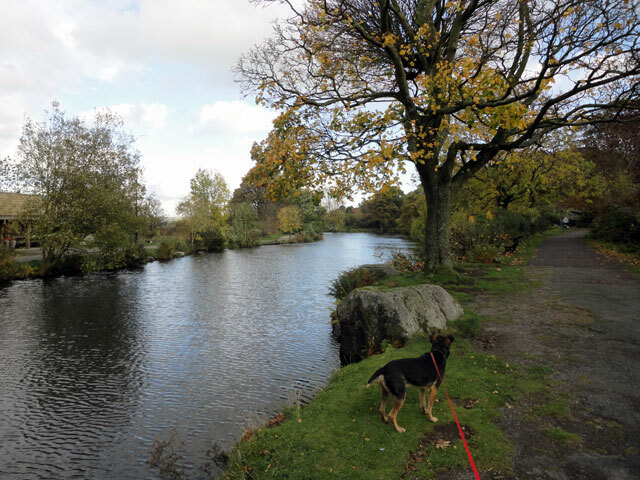 Got up and walked the dogs to Greenberfield and back – a walk of about an hour and a half including an exploration of where the locks had originally been and chatting with a Mr. Logan on the tow path about the virtues of different sorts of dogs. Back at the boat we breakfasted while the engine charged the batteries. 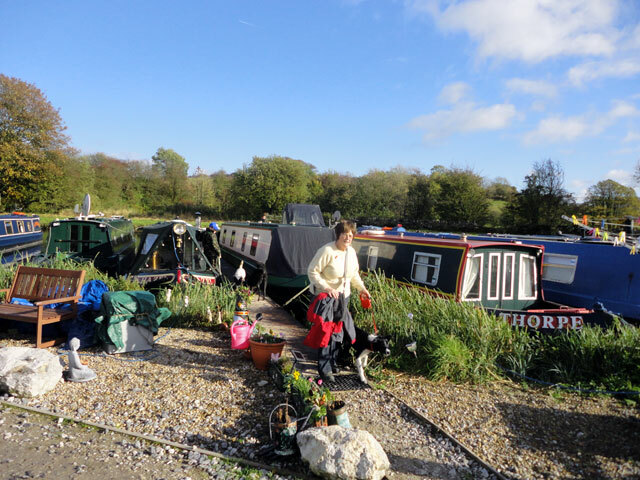 I went along to see Wayne and to pay our mooring fees for another year – remarkably these have remained constant over the three years we have been here, must be one of the best buys around. 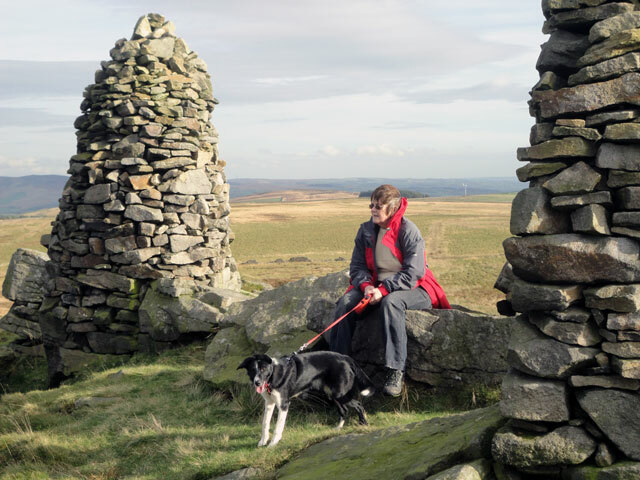 Rachel and I, with the dogs, went off to Skipton where we found a public bridle path which we explored and from which we got a glorious view of the town. Back in Skipton I bought Rachel’s birthday present – a pendant and ear-rings of amber – and we did some shopping before returning to the boat where we settled down with a drink and listened to the news (all about the prices of gas and electricity and discussions between the companies and a parliamentary select committee). It was dark here by 5 p.m. and it is still only October. Admittedly it is an overcast afternoon but if it is dark at 5 p.m. in October, what will it be like by the end of December? 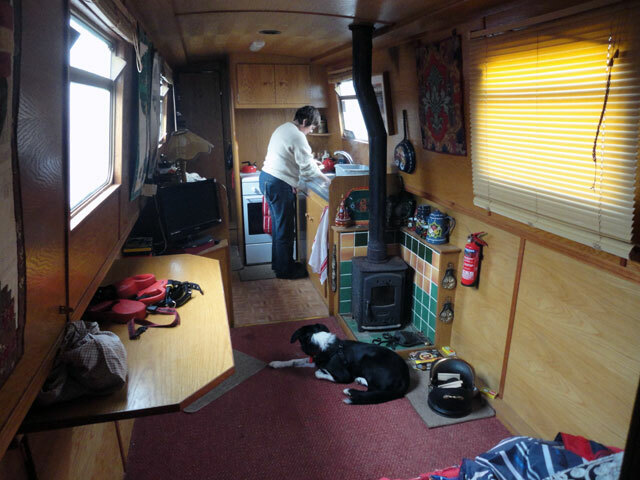 After dining on board, we watched a DVD bought in the afternoon – all snug with the stove burning brightly and the dogs settled down comfortably. The DVD was called Argo and told the tale of how some of the Americans from the Embassy in Iran were smuggled out of the country back in the siege of 1979/80. I remember the events well because one of the consular staff from Genoa – Bob Ode – was caught up as a hostage and was held prisoner for 444 days. I remember seeing him walk down the steps of a plane when they all arrived back in the USA. 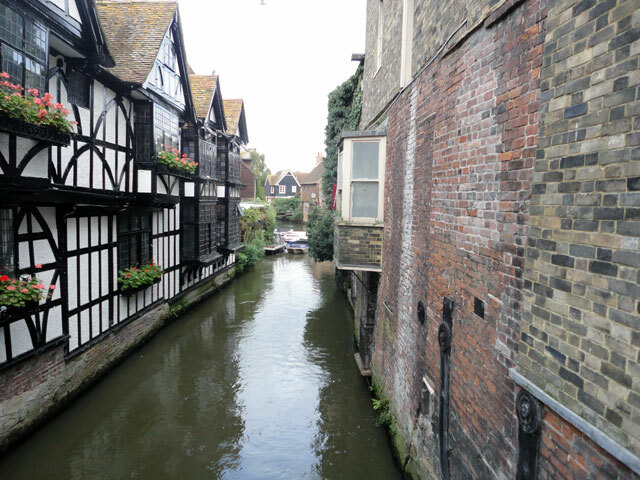 Walked Mix and counted 43 narrow boats with people – or at least lights – on board. For a Tuesday in October that seems like a very large number. Tomorrow I will count all the boats. Woke early and turned the bedroom tv on at once to see how the projected storm had developed. Confirmed gusts of 99 miles an hour in the south and five deaths (two from falling trees, two from a gas explosion caused by a falling tree and one swept out to sea); massive travel disruption and, as the day developed, 600,000 homes without power. Olive had been driven to Berwick to catch a train to Dundee but, as it was cancelled, Digger had to drive all the way to Dundee. 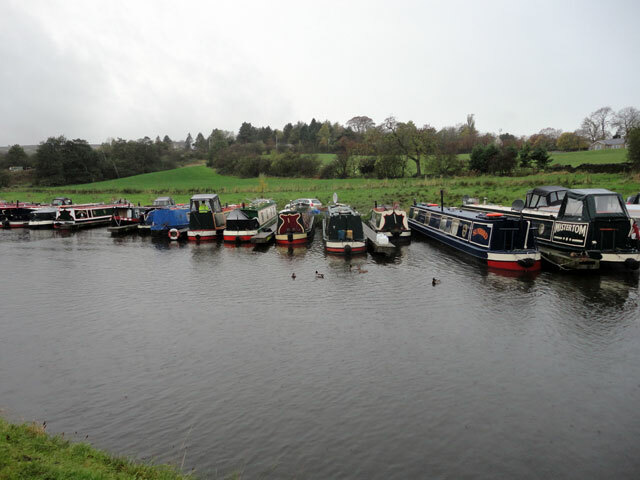 We footled around and I had coffee with Mum before, at 12.15, we set off for Barnoldswick and Rachel’s narrow boat, arriving at 3.40 – I was surprised that it was still such a long journey from the Borders. However, I discovered that Chester-le-Street is just 90 minutes from our house, so that bodes well for the summer. Found the boat well, lit the stove, turned on the engine to charge the batteries, walked the dogs and settled down for an evening in the boat. We dined and then watched the latest ‘Three Musketeers’ on DVD. Based loosely on the Dumas story but with flying galleons suspended from balloons it was a great romp. Walked the dogs and retired to bed. Sunday 27th. October, 2013 -- Another great Sunday. Got up refreshed after that extra hour in bed. Rachel awoke with a start not realising that the clock had gone back and convinced that she was late. On discovering that she wasn’t, she went back to sleep. 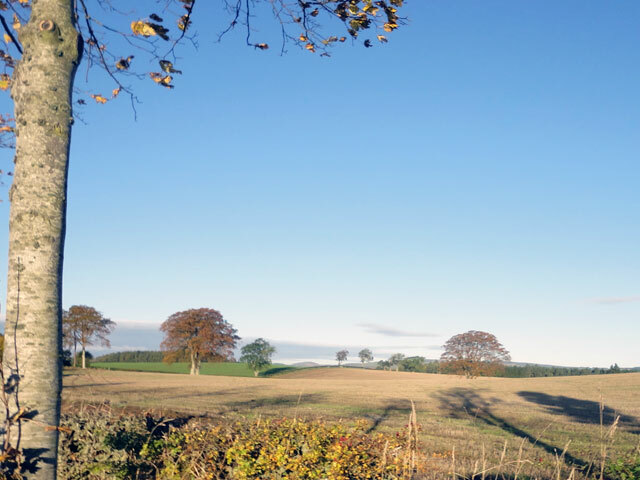 I walked the dog, breakfasted and then we all (Mum, Rachel and I) drove to church at Gavinton where we met up with Tom and Dorothy and enjoyed morning service which centred on the parable of the Pharisee and the Tax Collector. (I remember preaching on the story at an induction in Riverside Church years ago). This was a parable that my Dad really didn’t like (largely because he didn't think that it was fair) and I remember arguing with him and trying to make the point that the one basic rule about parables is that they are stories designed to make one point and one point only. (of course he knew that -- but he still thought it was unfair!) It can be fun to read into parables but that’s not really why they were told. Having said that, I really enjoyed Ann's sermon and the way that it brought out what Jesus was saying in this extended passage of teaching about prayer, in fact I loved the whole service. I am constantly amazed at the depth of Luke's perception about what really matters and about what he wants his readers to understand about the Christian pilgrimage. It seems so simple; it is so deep. 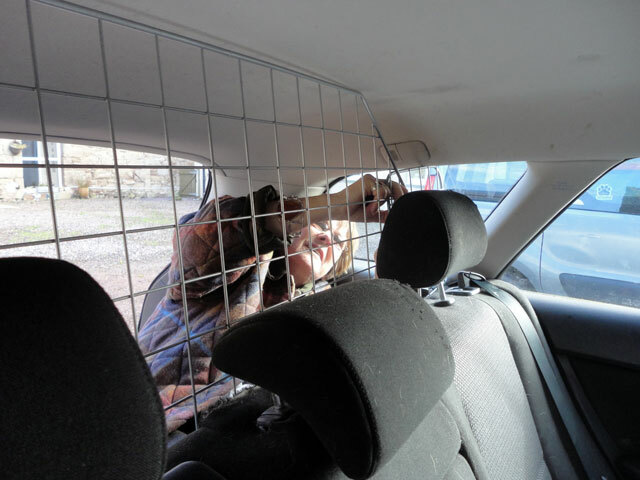 Back home, Rachel fitted the dog guard and then we set off for Spittal which is the beach and village just beside Berwick. We walked the dogs along the beach and were quite surprised at how sheltered it was – the winds are strong today (in preparation, perhaps for the storms forecast for tomorrow). We went on to the shopping area where I collected my sound bar from Curry’s and bought a lawnmower from Home Base, not least because they were having a 15% off weekend. How domesticated I am becoming – and I am quite looking forward to cutting the grass when the weather improves. Back home I set up the sound bar and then we ate with Olive, Digger and Mum in the farmhouse and returned to the Granary so that I could deal with some emails and prepare the wedding for next Saturday and the music for Arrochar for next Sunday. That done, we watched Downton Abbey and the news which was dominated by fears about the heavy weather forecast for tonight and tomorrow morning, walked the dogs and went to bed. I slept in until nine and then walked Mix, lit the fire and packed Rachel’s car. 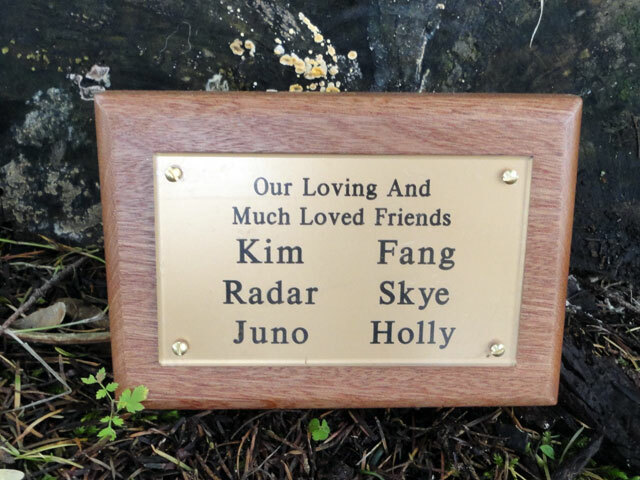 Then we planted the four signs (little plaques, really) we are leaving behind – the first to the dogs buried in the garden: Kim, Radar, Fang, Juno, Skye and Holly; then, by their trees in the glebe to Rachel’s Mum and Dad, to my Dad, and to Anne. Luss has been a happy place for us both but there have been real sadnesses as well. I suppose that Luss and Arrochar and their people have carried us through them and that life is about good and about sad times as well. Planting these little plaques brought home to me that we are moving on and also that we are leaving something of ourselves as well. I showered and got changed for the wedding, relieved that the weather is fair although there are warnings about mighty storms to come – the worst to hit England, but our new home is only nine miles from the border: can we trust the wind to know where the border is? The wedding was another really special occasion and with all the rain around, the couple were extremely lucky to get in and out in the dry before setting off for their reception at the Lodge on Loch Lomond. Today the photographer was Henry who lives in the same road in Cumbernauld in which Rachel and I lived when I was a probationer assistant at the start of my career so many years ago. Rachel and I set off for Duns as quickly as we could. It is Rachel’s birthday and we wanted to have time to celebrate it at home. It was an interesting journey: road works on the M8 held us back but the radio was good. Enjoyed an episode of The Bottom Line hosted by Evan Davis with John Timpson of the Timpson Shoe and Key business as a guest. There are 800 branches (and another 300 which deal with photocopying etc). John Timpson runs it as an upside down business. Decisions are made at branch level and it is all about providing service for the customer. There is flexibility in pricing and discounts and anything that goes wrong is encouraged to be sorted out at branch level. The area managers are there primarily to ensure that the right staff is appointed and then to support them. The central headquarters (John Timpson wouldn’t care for the title I expect) is there to support the rest of the organisation. Imagination is used in the appointment of staff and opportunities are given to ex-offenders. John Timpson was challenged about giving ex-cons the job of cutting folks’ keys! But he explained that their records showed that if you gave someone a chance and trusted them that people responded to that and that the record of things going wrong was no better or worse than with folk appointed from other backgrounds. He went on to say that he thought that much of the present compulsion to have systems and rules to safeguard against the one or two bad apples prevented so many good things from happening and that this was something which society as a whole had to learn. I found the programme entrancing. Of course I was transferring in my mind the situation to the Church. If we truly turned it upside down and left the decision-making to the parishes and saw the centre as purely a small support organisation and presbyteries as only there to provide support and enable congregations to do what they wanted to do, what a different church we would have. I’ll be turning this over in my mind for some time to come. Back home we found that Scott and Sue (my brother and sister-in-law) waiting with Mum, Digger and Olive for a birthday meal. We enjoyed a drink, toasted Rachel in Champaign and ate well before retiring to the Granary, walking the dog and going to bed. We will get an extra hour in bed tonight. Wonderful! 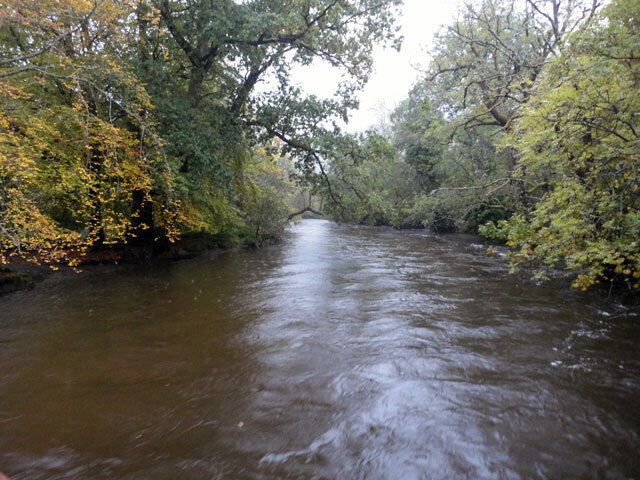 Up and walked the dog around the river path – it is very wet. Lit the fire in the manse and met with Mike to show him how to work the print machine and tell him what I used to do for Remembrance Sunday – because he asked, I hasten to record, I am delighted that now I am no longer there that they do their own thing. Chris and Cathy had got the church looking beautiful and it was warm as well. After a shower and changing into my wedding uniform I conducted the wedding ceremony – the rain eased and then stopped as the bride arrived and it remained fair for photographs afterwards. (Graham was the photographer – it is always good to see him, and his photos are always worth seeing as well.) It was a really lovely wedding, one of my favourite weddings, I think; although to be honest I love them all – but there was something special about the small numbers and the fact that the couple have waited and waited for their wedding. (A very excited couple of Chinese girls on holiday were delighted to photograph the bride as she arrived.) After the wedding everyone set off for the Duck Bay Marina for the reception. After the wedding Rachel and I drove down to the Alexandria library so that Rachel could return all of her books; then we continued on to Dumbarton to buy a dog guard for my car, a tom-tom from Mix and Rowan for Rachel for her birthday tomorrow, and a £10 dinner for two from Marks and Spencer for tonight. Back to Luss in time to walk Mix around the river path before conducting the wedding rehearsal for John and Gemma whose wedding will take place tomorrow. It is going to be a big wedding – another lovely couple. I’m looking forward to it already! Went back to the manse and reflected on both the privilege of sharing in folk’s weddings and on the opportunity which each wedding presents. Discussion so often tends to centre on the financial importance of weddings for the local economy or the stress and stain it places on the church but it is really about the opportunity of placing our faith right at the heart of one of the most special moments of peoples’ lives. It is quite simply what we are here for. I watched the News and Newsnight (it is good that matters at Grangemouth are resolving)and then got caught up in a programme about magical illusions – so I went to bed late. Rose and walked Mix down the Swinton Road and along Bramble Avenue, returning by the Kelso Road. Breakfasted on fried potatoes and freshly laid egg with Mum and Digger. Olive is still not home as Dundee University has prevailed upon her to teach an additional course to their law students. Back in the Granary I dealt with some emails and started to organise my computer now that I am again on-line. In fact I discovered that much of my new internet connection is still not functioning properly (emails etc.). I telephoned BT and they told me that it would be another two days before everything was functioning as it should. Ah well! 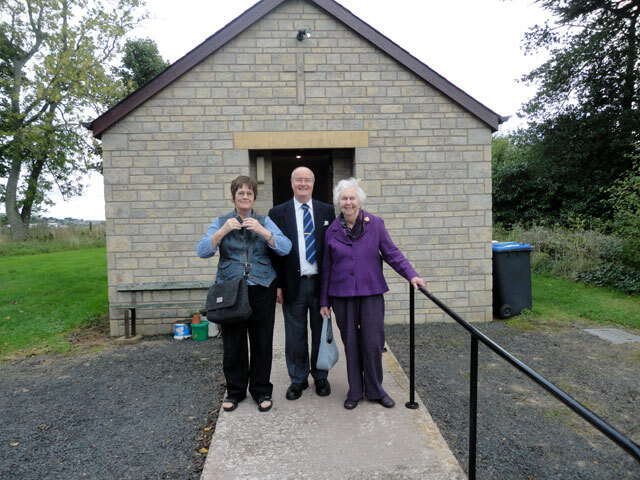 I drove Mum to Gavinton Church so that she could attend the monthly congregational lunch before the Guild meeting. I would like to have stayed myself but we had to set off for Luss. Mum is now thoroughly into the Guild, attending the meetings at both Gavinton and Duns and enjoying them both very much. I do not think that it will be very long before her diary is as busy down here as it was in Kirkcaldy. Rachel and I set off for Luss. It was a good drive with both dogs behaving well. Cathy was waiting to greet us when we arrived and soon we had a fire roaring in the grate – the central heating is still not functioning. I conducted the rehearsal for the wedding of Felipe and Rachel which will be held tomorrow. Felipe is from Mexico and tomorrow’s celebration has been delayed from earlier in the year because of visa difficulties. I am so pleased to be part of this wedding. While I completed the rehearsal, Rachel went off to collect a Chinese take-away which we enjoyed while watching an old Poirot which we had seen before but the pictures are superb, and later I watched the News: I was delighted to see that there was just a glimmer of hope for Grangemouth before we walked the dogs and went to bed. It dawned fair – a nice surprise after all of the rain of previous days. I had given today up to the installation of our telephone as I had no idea how long it would all take. In fact after I had walked Mix and joined Mum and Digger for breakfast I had time to start on the spare bedroom, moving furniture around and, just when I had things in the greatest guddle imaginable, the telephone engineers arrived. It is always thus! There was an immediate question: the lines to the farmhouse cross the road from a pole to the farmhouse, but was the line high enough? If not there was a problem. This became a little strange when I discovered that the join for the telephone connection came from a box beside one of our barns. From there the cable went underground to the other side of the road, went up a pole and came back over the road to our house. Would it not be easier to take the connection from the box by the side of the barn and lead it into our house? This was not possible. 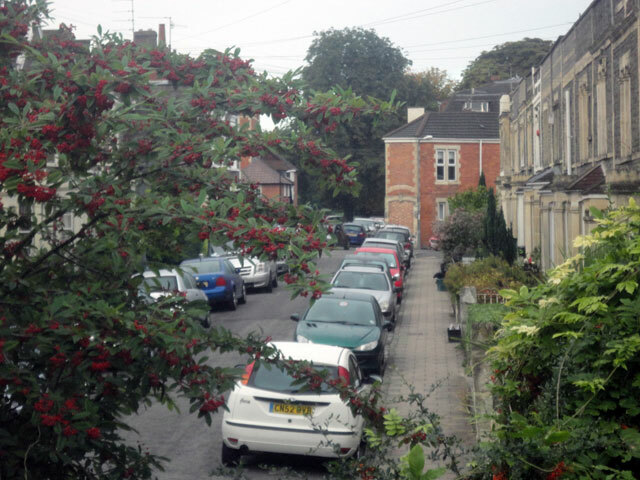 However the cherry-picker was able to ensure that the height across the road was adequate (5.9 metres) and once a hole had been drilled through our wall (it is more than a metre thick) we had not only a working telephone but an internet connection as well. 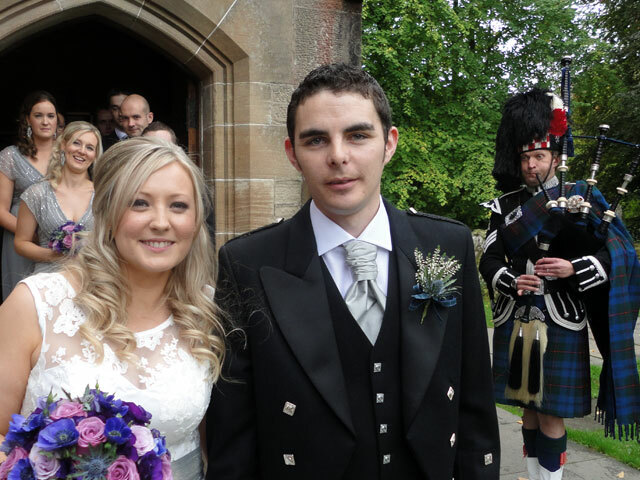 Immediately emails regarding weddings started flooding into my system – I forwarded them on to Luss! As the telephone engineers left, my friends Robin and Helen arrived. Robin was my Episcopalian colleague when I was at Bishopbriggs. Now they are based at Dumfries but were staying near here on holiday. It was really, really good to see them both and to hear of all that is going on in their church community. We had afternoon tea with giant cakes from the local baker in Duns. Later, I walked the dog and had a first tidy of the bedroom before we dined and then settled down to watch the new Poirot on TV, followed by the sad news about the Grangemouth petrochemical plant and its imminent closure (unless something can be done at the last moment to save it). Finally, in the moonlight, Mix and I walked around the policies before going to bed and spending some time reading before sleep. Up a bit later, around 8.30 a.m. and walked Mix along the Swinton Road before breakfast with Mum and Digger. Spent the morning getting my blog up to date and dealing with lots of emails. Even here, having been away for a few days, the email programme was absolutely jammed full. I can only access them through my mother’s internet connection so I don’t like to disturb her too often. However, we are due to get our own telephone line and internet connection on Wednesday so it won’t be too long before we join the real world once more. 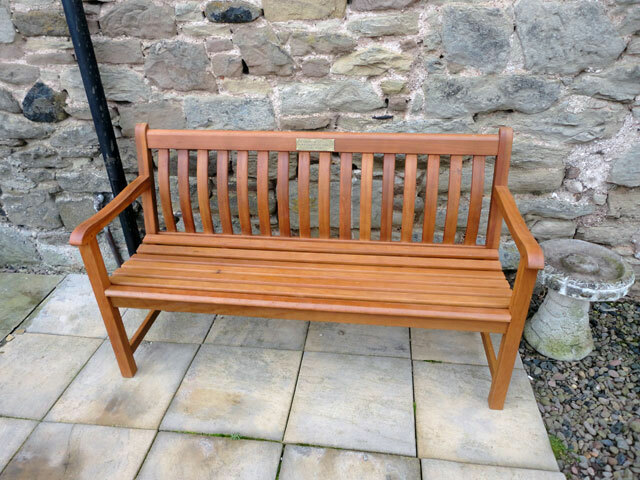 Rachel now has the Guild seat given to us by the Luss Guild on our retirement sitting outside the door of the Granary in the courtyard. We haven’t really had the weather to enjoy it yet – but it is very much admired and we never pass it without thinking of all of our friends. Sitting next to the seat is a bird bath. 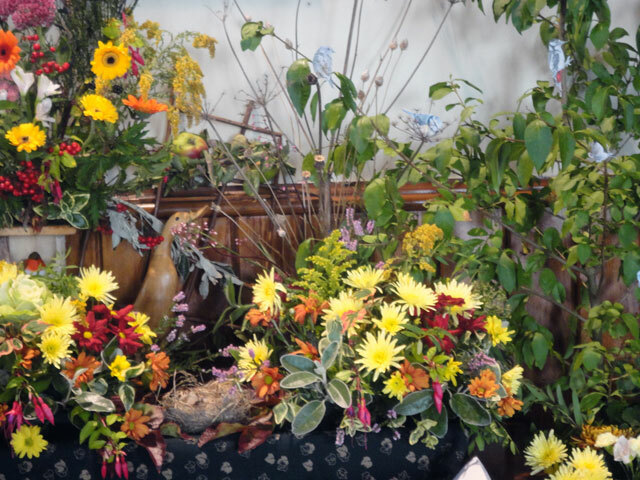 It was the only thing my father wanted to take from the garden of his home in Buckhaven when they left. 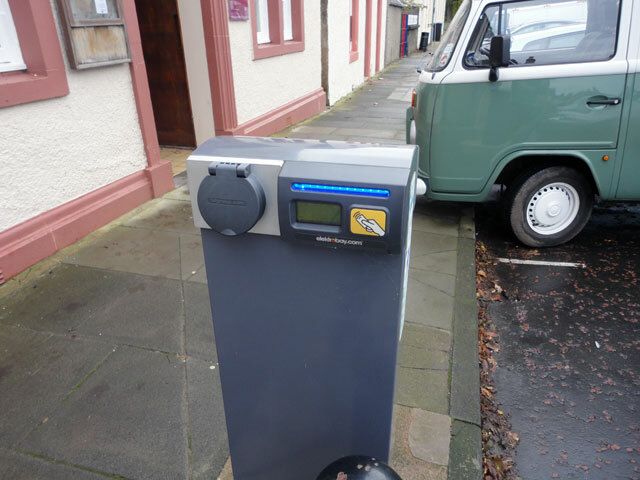 It came to Luss and now it is here with us in the borders. I am sure that it won’t stay here: Mum would like to have it where she can see it from her morning-room window; so once the weather improves we’ll move it there. Had some toad-in-the-hole with Digger at lunch time and then, in the afternoon, Rachel, Mum and I set off for Berwick. Mum wanted to make some purchases from W H Smith (diary for 2014), Rachel wanted to buy some bits and pieces from Tesco (brush and dust pan and other odds and ends) and I wanted to pop into Curry’s – when I bought our television a couple of weeks ago I was given a voucher for £200 provided I used it within thirty days. As we are unlikely to be here much during the latter part of this month I thought I had better spend it before it expired. I bought a sound bar for the television and a blue ray DVD player. I also bought three films: Les Miserables, the latest James Bond and the film about Abraham Lincoln. In the evening we watched Les Miserables on the new television and blue ray player. It was absolutely out of this world. When I think of the tiny black and white television on which we watched the coronation all those years ago, how the television experience has changed! 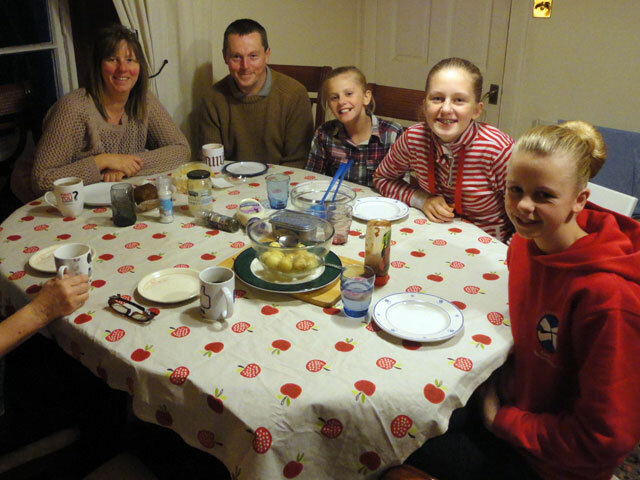 In between we dined with Mum and Digger – Scotch Broth and fish-pie, very yummy. Later we walked the dogs – no moon tonight (too many clouds) so it was very dark and I read some more of The Unusual Pilgrimage of Harold Fry in bed. I am going to get to love this new way of life. Got up and walked Mix – the roads are totally deserted and we could be on the moon. I just love the isolation here. The fields have already changed since last week as crops are starting to grow even although we are well into the Autumn. Breakfasted in the farmhouse and then went off to Gavinton Church with Mum and Rachel. Counting the organist and the minister, there were just twenty of us, but numbers don’t matter and it was a lovely service on the theme of the ‘unjust judge’; Ann, the minister, using her past experience as an advocate to revel in the story which is all about the contrast between human authority and God. It is good to be reminded both of God’s unceasing care and of the importance of prayer. 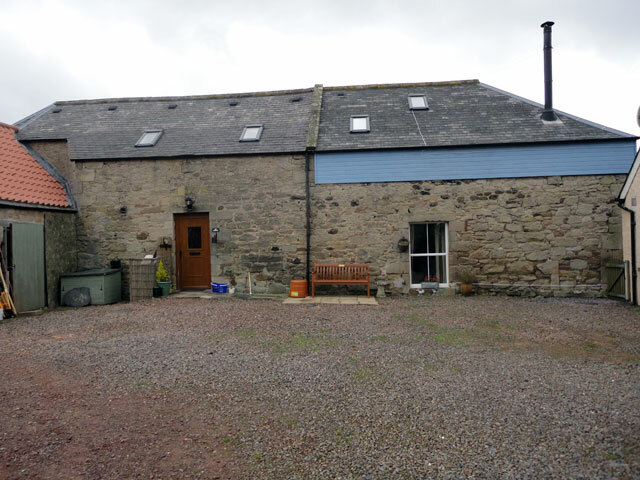 Back home, in these now endless days, we loaded Mix and Rowan into Rachel’s car and drove to Coldingham where we walked the dogs along the beach, returning through Reston where we saw that the house which Mum used to own has been all done up and is now for sale. Collecting Mum, we set off for the tiny village of Abbey St. Bathans (in the parish of Gavinton) where we attended the reopening of the little village Church. It wasn’t really what we had expected – there were no pews but it was a lovely building. It seems that a few years ago the Church felt that it could no longer afford the upkeep of the building and so it was sold to a local couple who, with help from the community, have turned the building into something quite special which will be used for community events and, from time to time, as a church. 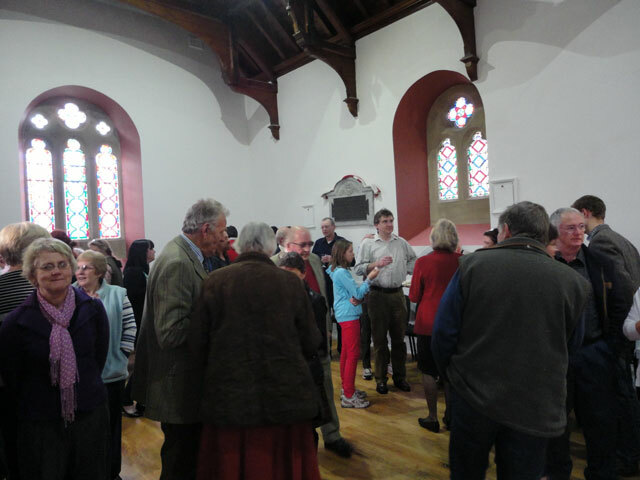 The building was full and there was a lot of enthusiasm – so things look bright for both the community and for the wider church parish. 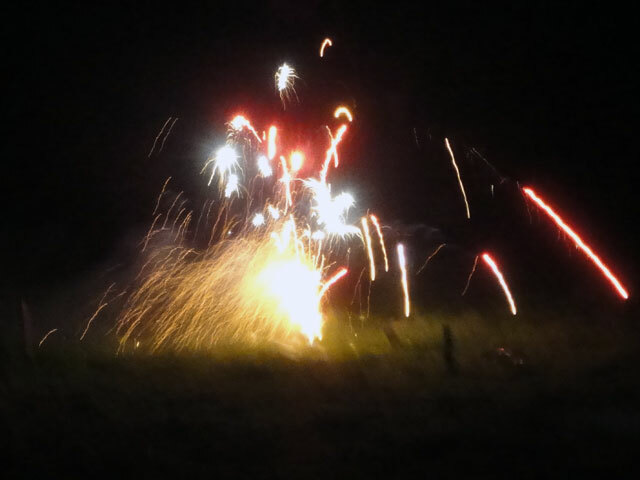 Back home – it was still only half-past four – Scott arrived and we all sat and chatted in the farmhouse before dinner at seven, after which we retired to the Granary and watched Downton Abbey and the news before walking the dogs in the moonlight before bed. Up and walked the dog around the glebe. 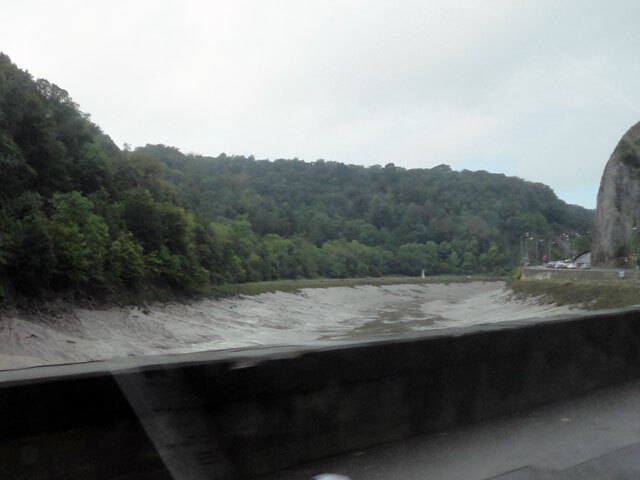 It is very, very wet and the river is running fast. Already many of the paths are flooded and it is a thoroughly nasty day. Back at the manse I popped over to the church to sort the heating, lit a coal fire in the manse (where there is no other heating) and I checked that every room was still clean and tidy. I got the apple tree (given to us by the Luss Sunday School) ready to put in the car and chatted with Alison and Elspeth as they stapled the orders of service. Cathy got the church ready for the wedding, florists arrived to do their thing, Rachel practised the music and then we loaded her car so that we could set off as soon as the 2 p.m. wedding was concluded. 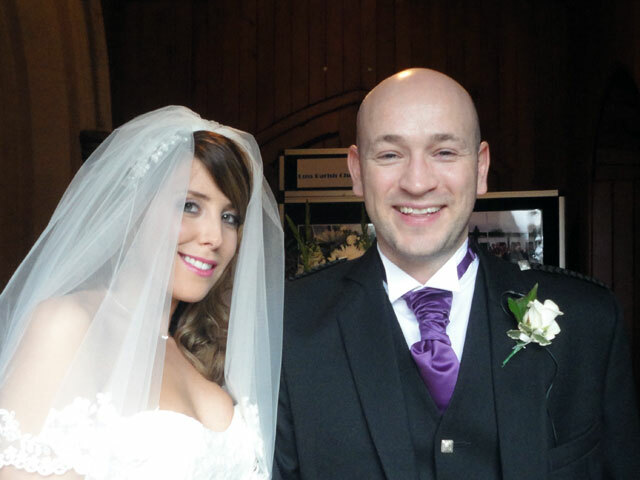 It was bad luck to get such awful weather for their wedding but Emma and Clive were having a day to remember with a lovely service at Luss Church followed by a reception at the Loch Lomond Golf Club. After the service the weather eased a bit to enable photos to be taken; we got into Rachel’s Berlingo and made excellent time back to Mount Pleasant, arriving just after six, joining Mum, Digger and Olive for a splendid meal and then retiring to our new home and luxuriating in the fact that we were here – and how cosy it is. Stayed up quite late just footling about: it is good to be home. 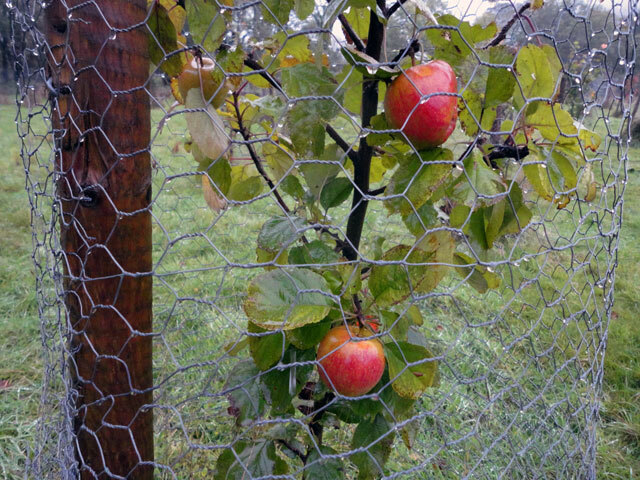 I walked Mix around the glebe and snapped these apples growing in the little orchard. Then I continued with the manse clean-up. It is now all done and looking clean, ship-shape and quite attractive. Rachel photographed every room, they all looked so good. I met with Mike to run over some of the questions which had inevitably arisen since I had left. How can the heating system in the church be set? How does the central heating in the centre operate? How do you change ink in the Riso machine? We worked through the list and at least one person now knows as much as I do. In the afternoon Cathy ‘dog sat’ while Rachel and I went off to the library (Rachel to return books), the Outlets (Rachel to buy shoes), Antartex (both of us buy ‘bargain – sale’ clothes, Lomond Shores (Rachel to buy dog-walking shoes) and then it was back to Luss where I walked Mix around the glebe before tonight’s wedding rehearsal for the wedding of Emma and Clive. After the rehearsal Cathy came back to look after the dogs and to allow Rachel and I to go down to Alexandria for an evening meal with Jessie and May. It was a wonderful meal with all of my favourites – smoked salmon followed by roast beef and then raspberry pavlova with a very pleasant Chianti, and coffee to end. It was a gloriously relaxed evening – one of the most enjoyable of my retirement. I’ve been reflecting on time. Until I retired every day, every week, every month just rushed by. No sooner did I get up then it was lunchtime and after a few moments or so it seemed it was the evening. I never had enough time and there was so much to be squeezed into each day. Now, just three weeks into retirement, time has slowed right down. I seem to have so much time. Days go on and on. There is time to think. Time to read. Time to plan. Time to walk the dog and time just to be. I want to savour this stage – for fear that it will not last. I sat and read ‘The Unusual Pilgrimage of Harold Fry’ for an hour before bed – it was already late, but so what? I have time and energy to do these things now. 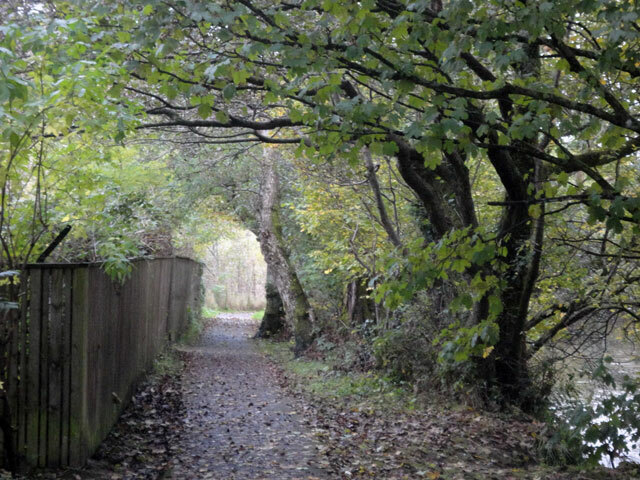 I walked Mix along the river path – it was wet and everything was very quiet. Then I started in earnest on the manse, cleaning the top floor and working down to the middle floor. Cathy was here and it was great to see her. 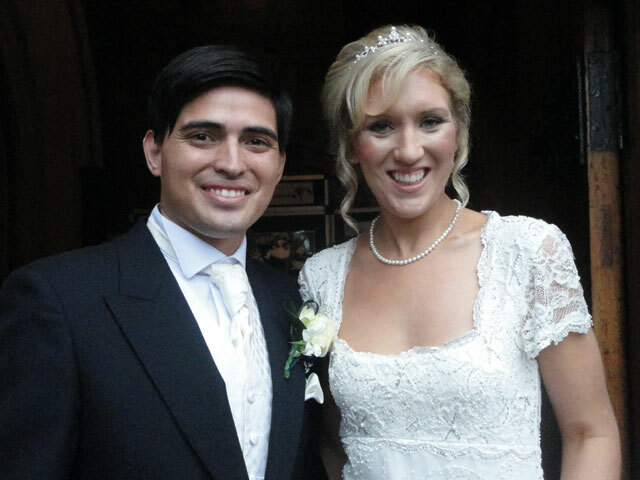 Conducted the wedding of Patricia and James – that’s their picture at the head of this entry. It was a lovely wedding and afterwards the couple and their guests set off for the Duck Bay Marina for their reception. Rachel and I set off for Braehead. Rachel needed some bits and pieces to enable her to hand over copies of all of her music files and slides for use during the services and I wanted to speak to the folk at Apple about buying a computer and a printer which will see me through my retirement. I discovered that Apple was filled with school children so I will go back next week. We had a snack, bought some books and returned to Luss to discover that the central heating in the manse had broken down. What a good job I left a full coal bunker! We were really quite warm as we watched Poirot on television and enjoyed another snack in the evening. Walked Mix and showered. There was still quite a bit of fog around and the roads were quite deserted. I spent the morning getting things done for Luss and Arrochar – preparing an order of service for printing, creating the music files for Arrochar – and soon it was time to set off for Luss. Rachel drove, Rowan slept but Mix was very restless. Still it was a good journey and we arrived in good time for the rehearsal for Patricia and James’ wedding tomorrow. While I completed the rehearsal Rachel went down to Balloch to collect a Chinese meal which we enjoyed in the Manse. It was strange to be here! 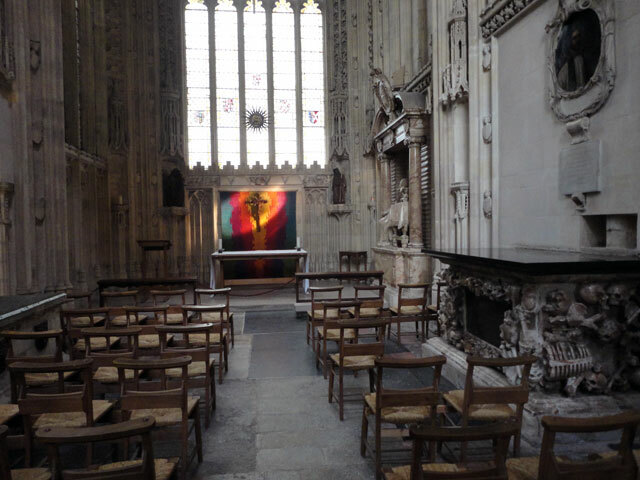 Up early to attend morning prayers at the cathedral at 7.30 a.m. and then went on with Kevin to St. John’s Chapel in the cathedral for the morning communion service. I enjoyed both and realised again how much I would like to have spent time in a religious community where everything is based around the daily times of worship. Back in Italy, forty years ago, I spent time in a Benedictine monastery and developed a hankering which has never quite left me. 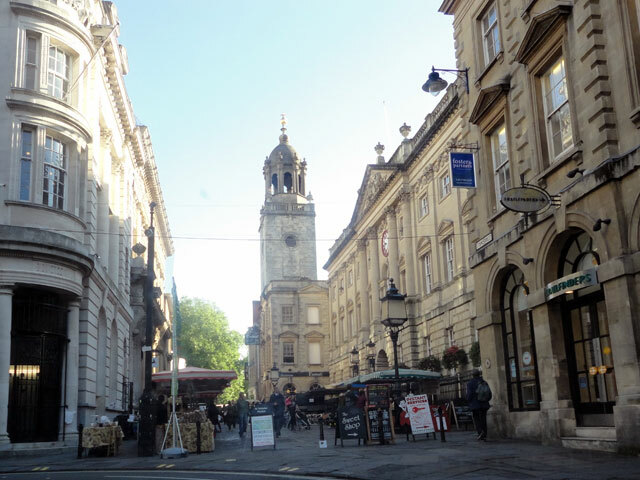 We breakfasted in the cathedral dining room – this was a really splendid breakfast: bacon, egg, hash-brown, sausage, tomato, black pudding and all washed down with orange juice and black coffee. We met in the cathedral board room and took forward our remit to work towards the creation of a European Chapter of the Green Pilgrimage Network. 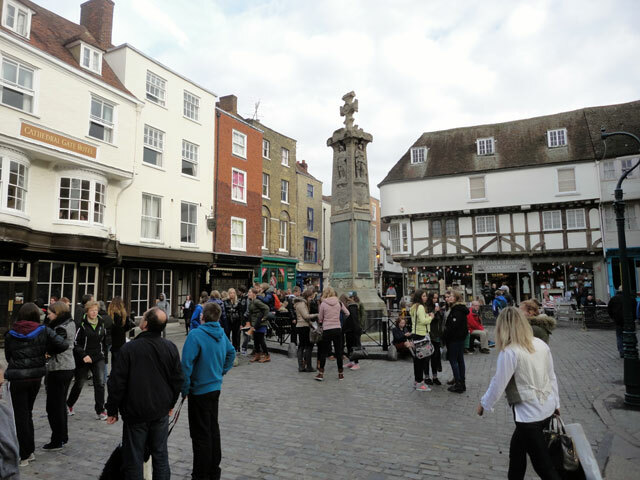 We learned of other pilgrimage places within our area who are anxious to become part of the network and we started planning towards a full chapter meeting in a about a year’s time. In the meantime there is much to do and this will include promotional work within our different areas. The meeting broke up in mid afternoon – we had been served a sandwich lunch and then we had a look around the cathedral before Chris, Kevin and I caught a train back to London. I had time in hand so I walked along Tottenham Court Road and down Oxford Street before returning to the station and catching the train at 7 p.m. It was an uneventful journey and the train arrived on time a little after half past ten. Rachel met me and we drove back to Mount Pleasant through quite a bit of fog. I walked Mix, had another snack, and was glad to get to bed. Up early this morning to walk Mix, have a shower and be driven to Berwick in time to catch the 9.11 train to London. This train was an ‘East Coast’ and compared to last week’s ‘Cross Country’ felt extremely old. One had to open the window and lean out to open the carriage door. It was also less well cared for. Last week, every hour or so someone came along collecting rubbish (mostly generated by the very welcome refreshment cart); this week there was no such collection and refuse gradually built up as the journey progressed. Interestingly, the food on the trolley was more expensive as well -- £5 .25p for a BLT sandwich and Fanta as compared to £4 .95p. On such differences are reputations built. The train was twenty minutes late (point failure at Peterborough -- I feel like Reggie Perrin) but I still had plenty of time to walk from King’s Cross to St. Pancras Station which is the height of luxury and more like an airport terminal than one’s everyday station – shops, restaurants and wide boulevards. 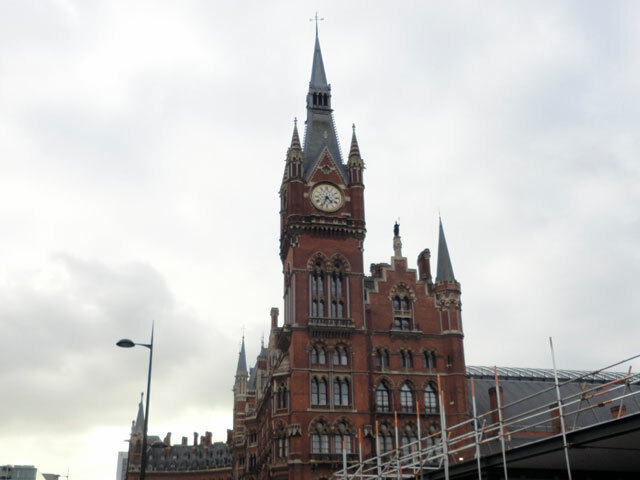 I recollected that many years ago my father’s first job was in an office within the wonderful frontage of St. Pancras. My father started in the property and land department of the railway company which was based here and if it hadn’t been for the war then this might have been his base for many years. I was surprised to discover that it cost £9 .50p to enter the cathedral precincts as a visitor. As one who was expected I didn’t have to pay but it is quite a hefty charge for a family to have to pay to visit church (of course, no one has to pay if they are going in to the cathedral for a service). Back at the cathedral conference centre I met up with my colleagues – Alison from the Green Pilgrimage Network, Berit from Norway, Per from Sweden, Chris – a very distinguished environmentalist from England, and Kevin from St. Albans. 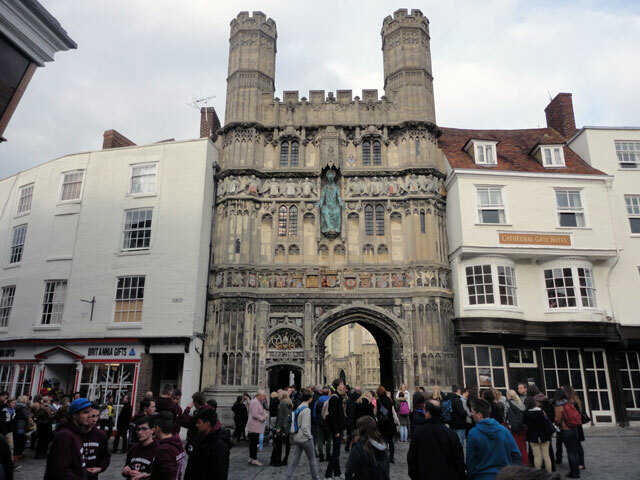 We were hosted by Caroline from Canterbury. After sorting out our accommodation we went into the cathedral to share in a service of Choral Evensong led by a choir of twenty boys and twelve men. It was a very lovely service. We were then taken for a very superb meal in the cathedral dining room, beautifully served and an excellent meal: salmon and vegetables, followed by a desert and washed down with wine and coffee. In the evening we all went out to one of the old public houses and enjoyed a couple of beers and incidentally got much of the work done for tomorrow while we sat with our beers! The view from the bathroom window in the Farmhouse caught my eye. A lovely sunny Sunday morning and the wind which has been quite ferocious over recent days has disappeared. 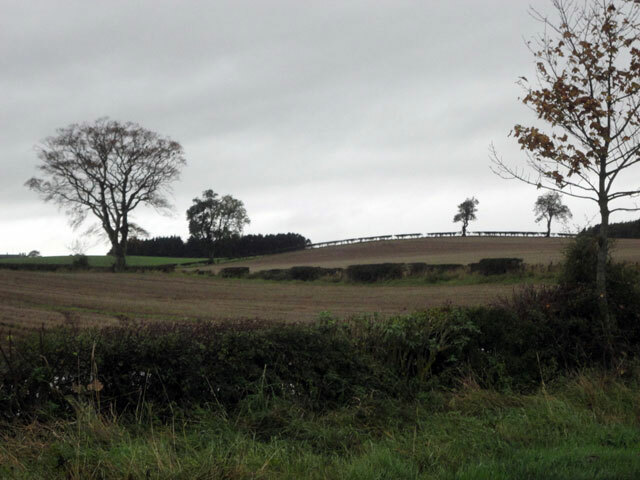 I walked Mix – there was hardly any traffic on the roads; showered and breakfasted before going with Mum and Rachel to Gavinton Church for the Harvest Festival Service which I enjoyed. Helen, the session clerk and, I believe, the presbytery clerk, spoke about practical help for those in poverty overseas and used as an example of practical help a Heath-Robinson (I don’t mean that in any derogatory way) fish farm created out of netting, bamboo poles and four empty plastic lemonade bottles. Ann, the minister, spoke about choices between eating and heating being faced in our own country. At harvest we share what we have – food and faith. It was good. In the afternoon I opened my first box and started on my room. 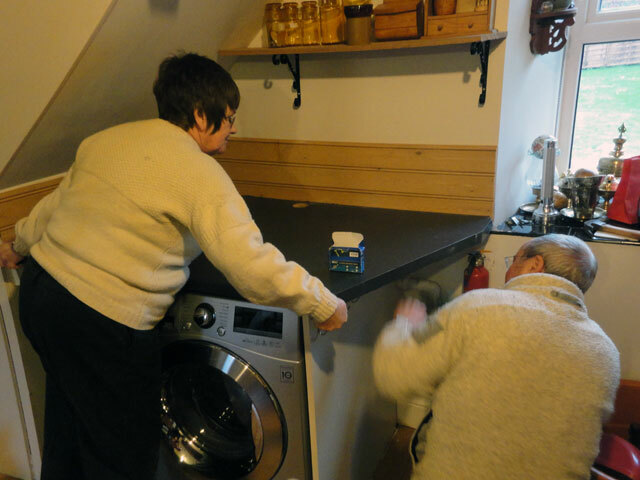 However, Tom arrived soon afterwards and set about installing our washing machine – or at least, altering the unit to allow it to fit. Once this was completed I set off for a walk with Mix, taking advantage of the quiet Sunday roads to walk to Fogo and back – a distance of a little over five miles. Fogo has a beautiful little church which evidently traces its history back to the eleventh century. There is a service there every third Sunday of the month. I’d love to go next week but already I feel quite committed to Gavinton. After the service we drove back to Mount Pleasant and I got ready to go to Canterbury tomorrow. At nine we watched Downton Abbey after which I walked Mix before retiring to bed. I’m looking forward to next Sunday already. The roads are very quiet on a Saturday morning so Mix and I walked along to the neighbouring farm on the Kelso Road. We admired the farm with its stock of hay and lots of pens for sheep. We looked at the ten little cottages presumably for farm workers (with what had obviously been the three outside privies) and the two new detached houses which didn’t look as anyone had as yet moved in, and we wandered down the quiet road towards Fogo. Back home we breakfasted and then we waited for the delivery from Curry’s which arrived on time and they delivered our new washing/drying machine and our slim-line deep freeze. The washing machine didn’t quite fit – so much for them all being the same height and we had to send for Tom who was busy building a goat house for his herd of four goats – their latest acquisition. Ah, this rural life! We really are very rural here, far more rural than anywhere I have lived before. All around us are fields which are being cultivated – most of the traffic on the roads is gigantic tractors and farm implements, the purposes of some of which I can only guess. The farm workers work hard – they are in the fields as soon as it gets light and are often still hard at it long after it has got dark. Today is Saturday but that made no difference: when I walked Mix at 5 p.m. two tractors (you can see them in the picture) were still hard at work in the field across the road from where we live. We got a friendly wave from one of the drivers and it made me feel at home. We have got the television fitted up in the bedroom now. The aerial is directed towards Berwick so we get English television upstairs and Scottish television downstairs – that way we will get every opinion on the referendum! After a chicken dinner (with garlic bread), we retired to the Granary where we watched the Young Montalbano before bed. It had been a lovely day. Up and walked the dog before enjoying breakfast of bacon and egg in the farmhouse. 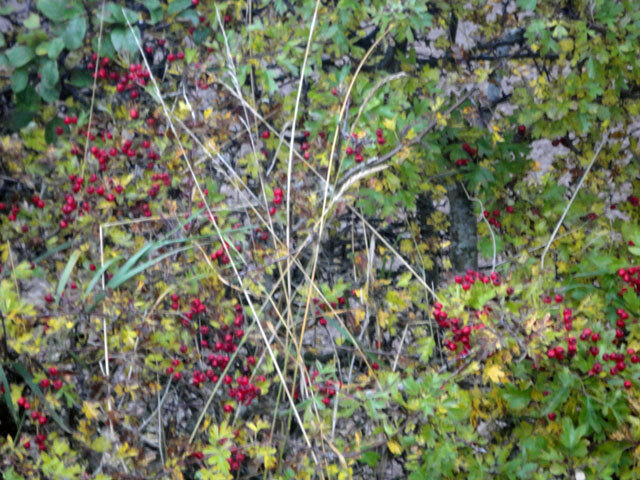 (Walked down the road to Swinton and then turned off along a track between two fields – we call it Bramble Avenue because of the Bramble bushes there. Took a picture from a long way away of the farmhouse.) Tom arrived to erect our freeview digital television aerial and take a lead in through the bedroom window for the small television we are fitting up there. Tom has the tool for every occasion and I can see that if I am going to try to do things for myself here that the first requirement will be a set of tools. 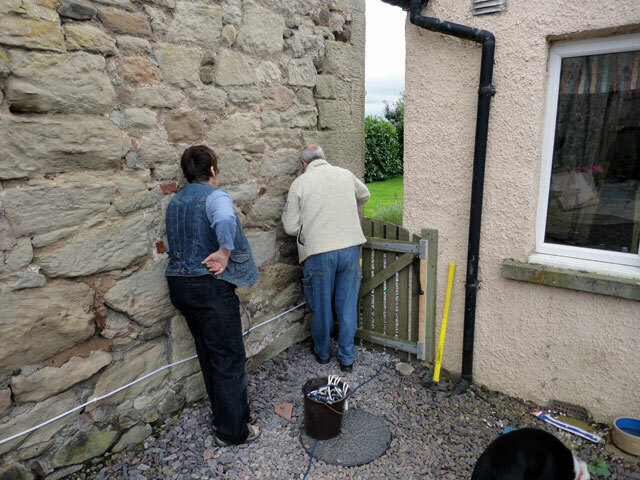 The task continued into the afternoon and involved a trip into Duns to purchase (from Howard’s Electrical Supplies) a metal pole on which to erect the aerial. Later in the afternoon I walked Mix and then Rachel and I went into Duns to get forms to sign on at the local medical practice. We also went into Pearson’s and bought some fuel for the stove in the Granary. After a magnificent meal in the farmhouse (which included some of the cake given to us by Arrochar Church) we came back to a very warm Granary and watched an episode of Lewis – at least, Rachel watched the episode. I realised once it had finished that I hadn’t a clue who had done what to whom – but I had enjoyed the doze in the warmth on the sofa. And so, after a brief walk around the policies with the dog, to bed. 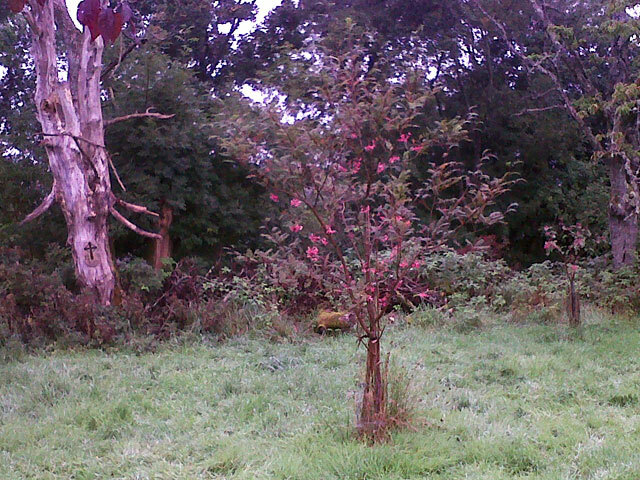 This morning I rose and walked Mix before settling down to do some chores for Luss and Arrochar. I prepared a draft Order of Service (because I have a file with the words of all of the hymns on it). I prepared music files of the hymns for Arrochar and started transferring files to Mike so that he can take over. This has been delayed because my email account (operated through my mother’s internet because we won’t have a telephone or internet until the 23rd. of October) has not been functioning as it should. Andy, however, has managed to get it all working again. In the early afternoon, measurements having been taken, we returned with Mum to Berwick and visited Curry’s where Simon was awaiting us. We bought a new washing machine with a tumble dryer included. It cost rather more than we had intended to spend but we are getting the Granary ready for the rest of our lives. We bought a slim-line freezer and also a small flat television for our bedroom. There will be no further purchases for a long time to come but we should now at least begin to get sorted out. Back home I walked the dog. I started trying to get a bit organised in the short while before dinner and then after a lovely meal with the whole family in the farm house, Rachel and I watched an old episode of Spooks on television. The News and Newsnight followed and then it was time for bed. 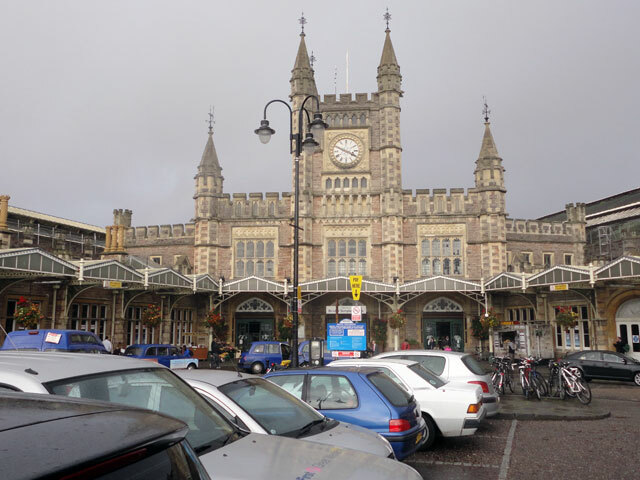 After breakfast David drove me through Bristol back to the railway station for my journey back to Berwick. On the way I again grabbed a few pictures from the car window. I loved seeing the old buildings as we drove past. This is the site of the old market. 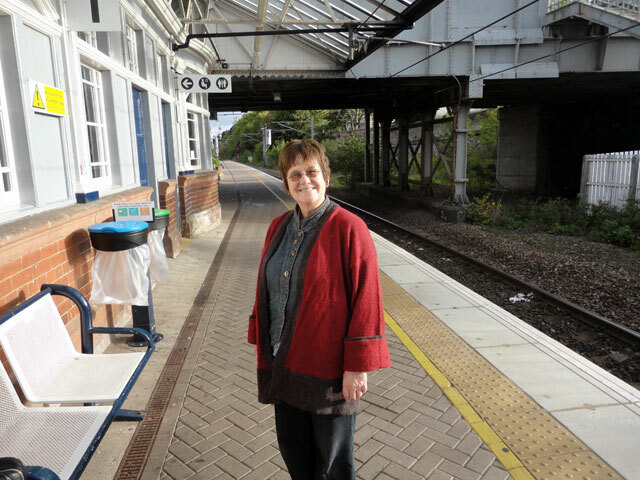 Soon we were at the station where, without any fuss at all, I caught my train and enjoyed the five-hour trip back to Berwick. I had the double seat to myself except for a brief period when I was joined by a lady journeying to see her daughter. She told me of all of her holidays cruising. I put her down as someone with a great deal of money until she told me that she and her husband were retired and had their names down for all kinds of last minute offers. They had recently sailed the Atlantic to New York (and flown home again) all for £400. Decided to explore those possibilities when I get my own telephone and internet connection later in the month. Rachel was waiting for me when I arrived in Berwick and we went off to Curry’s to see about a washing machine with a built-in tumble dryer (our kitchen is very small) and a small upright freezer which we might squeeze in. Found another very helpful and knowledgeable assistant (Simon) who helped us and we set off for home to do some measuring. After walking the dog and showering, I set off for Berwick Station for a five hour train journey to Bristol. 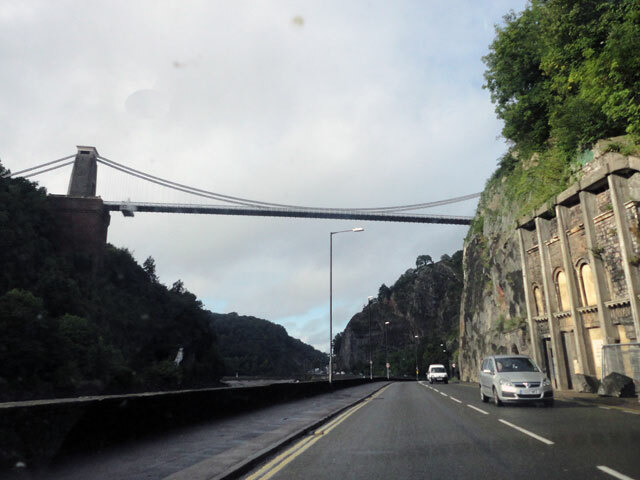 I had never been to Bristol so it was all quite exciting. The train took me through Newcastle, Durham, York, Leeds, Birmingham and Cheltenham and I arrived at Bristol in the mid afternoon. The train run by Cross Country was, I overheard one gentleman remark to his wife, ‘a superior one’. Well, it was certainly very comfortable. I had a booked seat and it was waiting for me on my embarkation. I noticed that many folk got on to the train and didn’t look at all to see if the seat they sat on was booked or not. Other people examined the signage in great detail to make sure that they were doing what was correct. The folk who didn’t bother were often the ones who then got quite annoyed when the rightful ‘owner’ of the seat arrived! At the station in Bristol I was met by David, a friend from University days at St. Andrews. 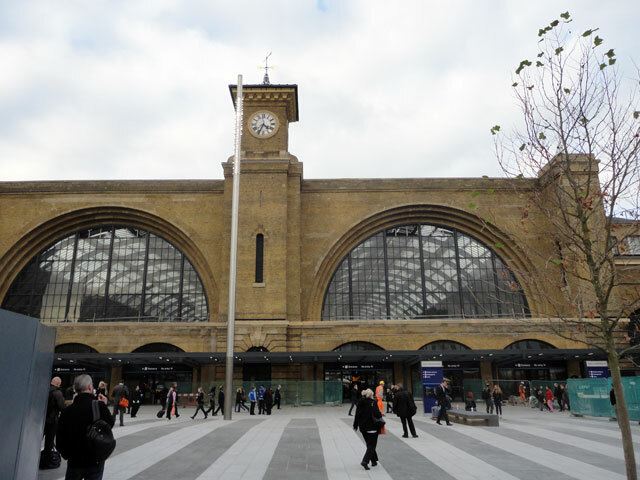 The name of the station comes from the Church of the Knights Templar – mead is a word for fields. David drove me to his home. I was welcomed to David and Diana’s home and, after something to eat and a walk around the area to get my bearings, we set off for the evening meeting of the Bristol Anglo-Italian Circle held in the British Aerospace Workers Association building. I enjoyed meeting all of the members and spoke (and showed pictures) of my time in Genoa as minister between the years of 1971 and 1976. Back home at David’s, we dined and then I retired to bed in a lovely room in their three-floored terrace house. It had been another good day. Up and walked Mix and then back to the Granary where Tom arrived around nine. 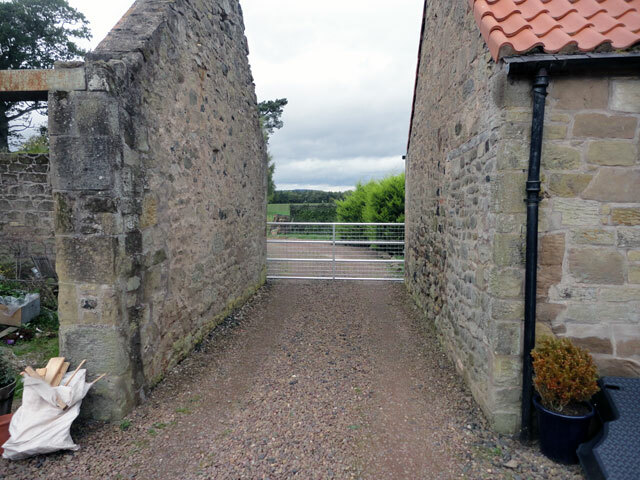 With Tom taking the lead, we erected the new farm gate to keep the dogs in the courtyard and then dismantled the small gate and Tom re-hung it with a spring to keep it closed. This all took a lot longer than it takes to write and was a real precision task – thank goodness for Tom! 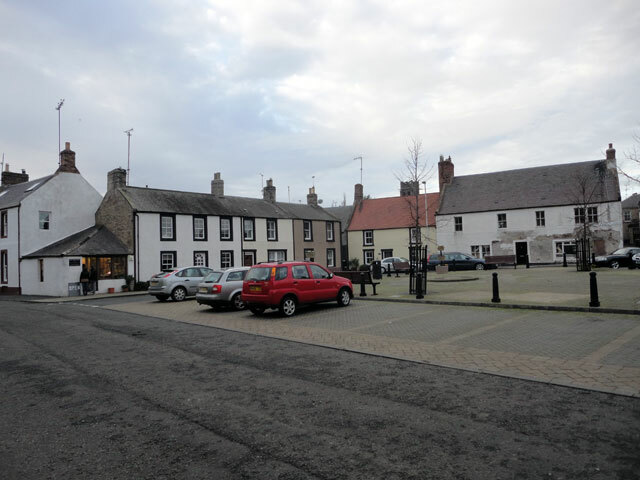 In the afternoon I went up to Duns to visit the bank and to do a little shopping. I’d hoped to get onto my emails through my mother’s account but the system didn’t appear to be working so things will have to wait until service is resumed. I fitted up my Mum’s digital picture frame so that she can relive past holidays and then I worked in the study on a talk that I am to give in Bristol tomorrow evening. Walked Mix and soon it was time to eat again. Retirement does have its advantages! 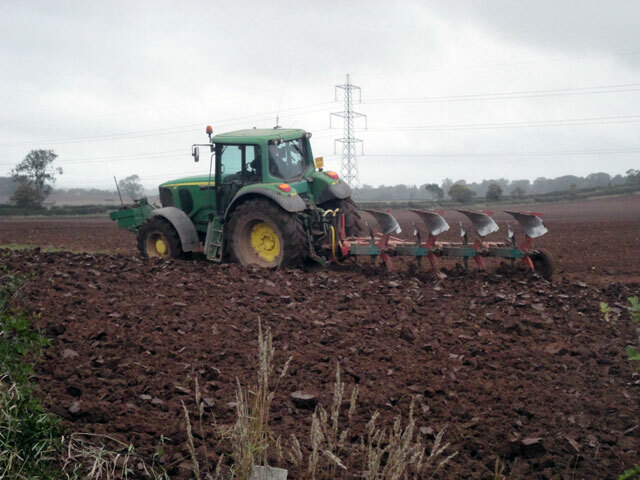 While walking Mix (with Rachel and Rowan) watched two tractors driving along in tandem – one had a huge device for gathering potatoes and then it had a conveyor belt which delivered them into the truck being pulled by its neighbour tractor. It was all very efficient and brought back memories of the days when we got two weeks of holiday from school in Dundee so that we could gather tatties. I have many happy memories of those days – but it was very hard work. Dined in the farmhouse and then retired to the Granary to get everything ready for my trip to Bristol tomorrow. I have never been to Bristol before so it will all be rather exciting. Joined the congregation for coffee in the small hall beside the Church and learned that we are probably not in Gavinton parish (the boundary seems to run down the middle of the road which passes our door and we are on the other side). But we are welcome nonetheless! Back home Tom and I got the television set we had bought assembled and fitted on to the wall. Just before two the Sky engineer arrived and by half past two we had television again. I walked Mix and watched television (!) before doing some tidying in the study – I still haven’t started opening boxes – and then we all dined together in the farmhouse (toad in the hole – my favourite). Everyone came across to the Granary to watch Downton Abbey on our new television set and afterwards it wasn’t long before we went to bed. A really lovely Sunday. Up and started to clear up the Manse. Rachel and I had intended to start at the top of the manse and work our way downwards but there is a big event happening on Monday – a meeting of the executive of ACTS (The actions of Churches together) and so it was more important that we set about the ground floor. Everyone pitched in to help – Cathie, Rhoida, Mike, Alison, Elspeth – and by the time we left in the late afternoon the ground floor was immaculate. The first wedding was at noon. 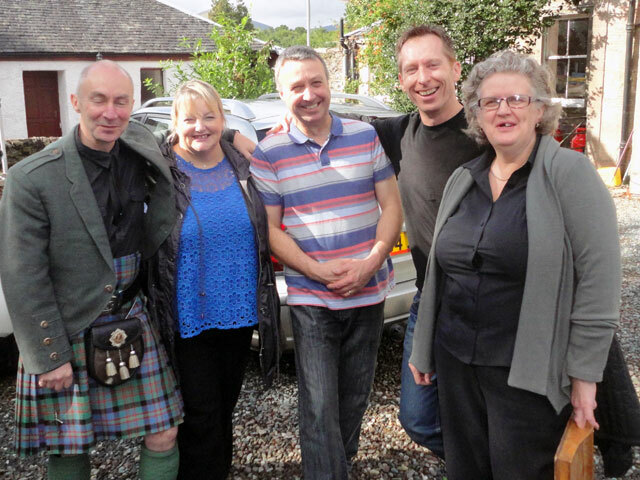 Louise from Helensburgh to John from the United States of America, with guests from Scotland and from the United States. This was followed by the wedding of Maura and Ryan – another lovely occasion with, on this occasion, both bride and groom coming from this country, and bringing with them many guests. 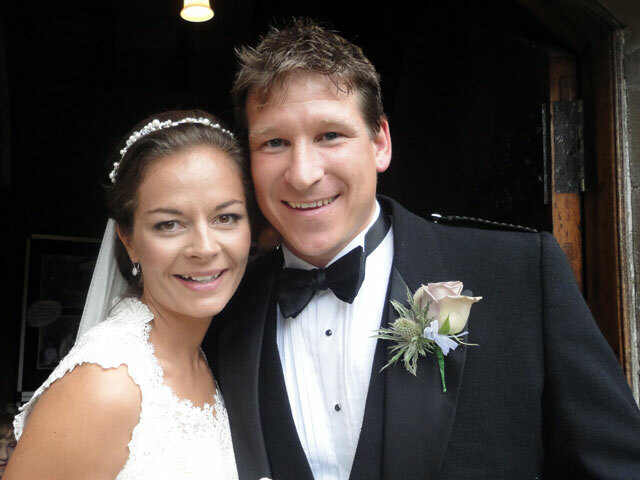 Our third couple, David and Rhona, had travelled from Canada to be married, although Rhona is from this country and met her 'husband-to-be' at the base camp on Mount Everest. Now they live in Winnipeg where David is a surgeon. Rhona had arranged for all of her guests to arrive by boat so that they would not be at the church too early and risk arriving before the guests from the previous wedding had departed. In fact it all worked out perfectly. Everyone kept to their allotted times; all of the weddings were really happy occasions and it was a joy for me to be part of them. Rachel was in charge of the music as usual. 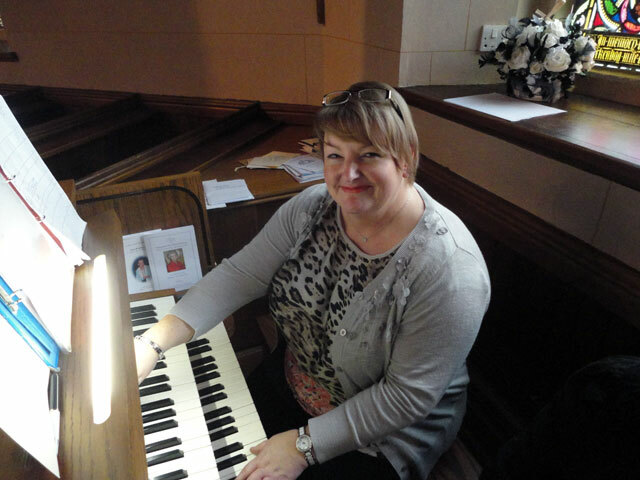 However, given that we will not be around in future, Rachel has been giving Carol lessons in controlling the organ. Carol sat in for two of the weddings this afternoon and is making great progress. After an excellent meal, Rachel and I returned to the Manse where we loaded the dogs and some bits and pieces into our vehicles and drove down to Duns, arriving around eleven at night, just in time to climb into bed. Friday 4th. October, 2013 -- And Back to Work! I got up early and walked Mix along the Swinton Road – on the way back I took this picture of the Mount Pleasant Farmhouse with our Granary to the right and barns to the left. Today I had to return to Luss in order to conduct three wedding rehearsals, with the three weddings tomorrow. I’m happy to do that to help out, particularly now that Bill who was to look after these events has been taken unwell. I was on the road by about half-past eleven, arriving at Luss about 2 p.m. and then going off to Helensburgh to have a session with my physio. Back in Luss the wedding rehearsals started at five and ran through until eight, after which Rachel and I enjoyed a Chinese take-away before getting off to bed. It seems incredibly odd to be back in Luss. In one sense I have never been away but the decisions are made by other people now and my responsibility is only to do the things that I have been asked to do to the best of my ability. Phone calls, emails, people with requests get forwarded on to other people and, after forty-three years of being the person with whom the buck stopped, that is quite a strange feeling. Lorraine is the beadle for tomorrow but both Robbie and Mike came along to see me, and it was very good to see them both. Up early and walked the dog, showered and then breakfasted at eight before setting off with Mum and Tom for Berwick at 8.30 a.m. We drove just along the road and past signs announcing that now we were in England. 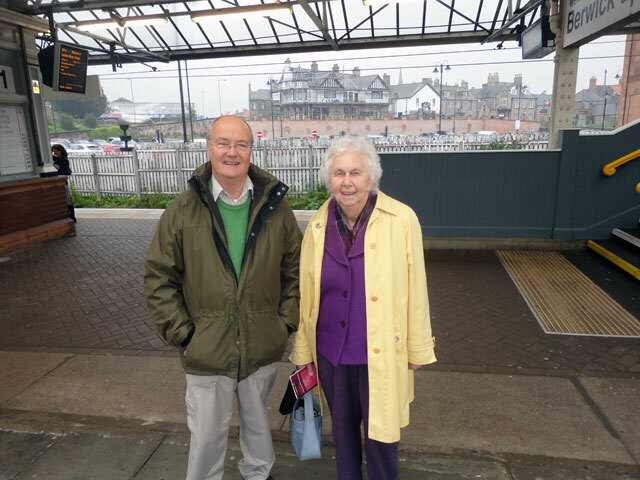 Mum caught a train to Edinburgh where she is going to the theatre with friends (to see The Fiddler on the Roof). Tom and I went to a retail outlet where we bought a television. There are so many different televisions and we were shown them all by Chris, a very helpful assistant from Curry's who, while working, is also studying computer game design at the Open University. Chris helped us to make our choice and, as the television was not in stock, arranged for it to be delivered to the Granary on Saturday. Now Tom went off to see a friend (for a music rehearsal) and I met up with Cathy and Rachel. We had a morning coffee and then went into Home Base to work through Rachel's shopping list for the new home. Home Base had everything on the list -- pretty good! Back at Mount Pleasant we grabbed something to eat and soon afterwards Tom arrived and we mounted the wall plate for the television so that everything is in order for when the television and then the Sky engineer arrives. I then went off to the study to get things ready for the weddings I will conduct at Luss on Saturday (with rehearsals tomorrow). 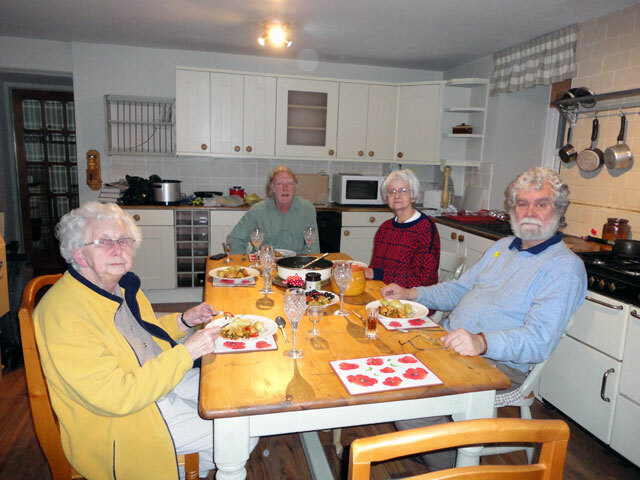 Olive gave us a super meal -- vegetable soup (home-made) followed by home-made fishcakes with roast potatoes. Rachel discovered that she had lost in the removal the power cables for her laptops so panic ensued. We have made provisional arrangements for the Church music at Luss but hope to find that the cables have been left at Luss! Walked the dog and so to bed. Woke early with a phone call from Morag and then walked the dog before breakfast made by Digger -- sausage and French toast. Then I borrowed Mum's phone and started trying to see about a telephone and broadband for the Granary -- and a television system as well. BT have arranged that we will be connected to the telephone system on 23rd. October -- we need to have a new line installed and we will have BT internet as well. I spoke to Sky and they were keen to get us connected to their television service. I had thought that a few weeks would have to pass but no, they will be with us on Sunday afternoon. That's great except for the fact that we don't have a television so I will have to go out tomorrow and buy a television set to which the Sky can be attached. Also spoke to the Church of Scotland who told me that they have now sorted out my pension so I can look forward to being paid for my life of leisure! Just after lunch time Tom arrived and we set off to see about a gate for the farm courtyard. We went to a farm nearby where the farmer was obviously an agent for gates -- he had hundreds of them in what had obviously been a grain storage building. He knew exactly what we required and it will arrive to him tomorrow night and be delivered to us on Friday morning. We bought all of the fittings and brought them here so that we will be ready to fit the gate soon after it is delivered. Tom then took me on a tour of the industrial estate, the garden centre and other places which he thought I would need to know about -- we met a builder and saw the local MOT garage and eventually ended up back at Tom and Dorothy's home. What a lot they have done to it and how great it looks. Came back to Mount Pleasant and had some afternoon tea/lunch -- Olive had now returned from her two day teaching stint in Dundee. I worked in the study sorting out many of my clothes which are now hanging on rails for the first time in several weeks. Walked Mix and then we all shared in a meal -- fish pie and stewed apples and brambles with ice cream. It was superb. Sat and talked with Mum and Cathy in the lounge of the farm house before returning to the Granary for a final burst on the clothes before bed. I can get to like this retirement business! It seems that this is a busy place! I was determined not to get up this morning but Bill caught me on my mobile at 8.30 and so I got up and walked Mix -- a very pleasant walk -- and what struck me at once was that I saw no people at all while I was out. For one who has been surrounded by people for the whole of my life, that was really quite remarkable. In Luss I never walked Mix without meeting and greeting at least a couple of folk. Back home, plans were being made for the day. I found my approach to these plans quite remarkable as well. You see normally when I have been away from my parish it has been for a snatched day or two or a brief holiday but, while days remain enormously precious, now my diary is almost empty -- so I am happy to do whatever anyone wants and I won't feel that if I haven't actually achieved something of importance that the day has been wasted. 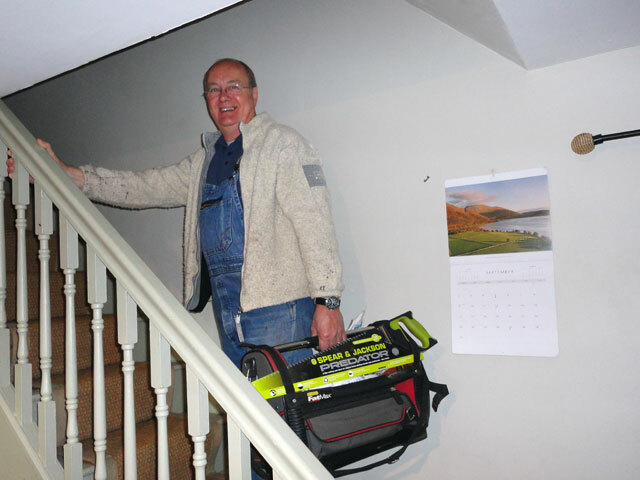 Tom arrived and I snapped him going up the stairs with his tools. he didn't feel that the folk who were decorating Mum's new upstairs sitting room were doing the work around the sink (for her cups of tea) as well as was required. So now Tom himself is on the job. 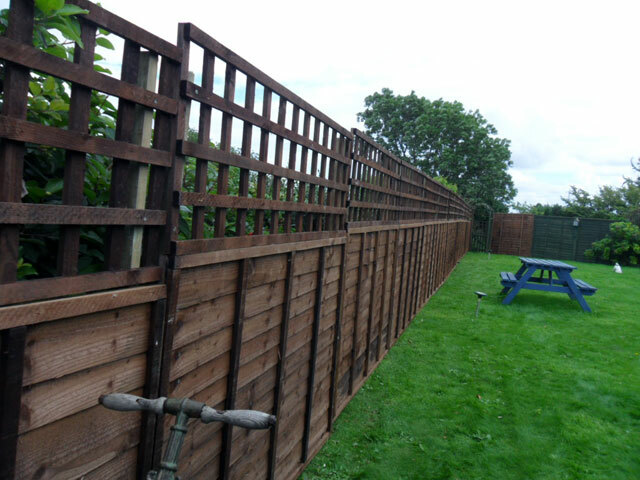 He also fixed another area of fence to prevent Mix and Rowan from setting out to explore the outside world. My job was to drive Mum to Duns to have her hair cut. It is a tiny journey -- four minutes at the most -- and when I got back to the Granary everything was as I had left it! Rachel was unpacking boxes, Cathy was in the barns rooting about for a lawnmower to attack the back garden. Cathy and I went back into Duns to collect Mum and to have a short look around the shops and we brought back with us a snack lunch which went down very well. 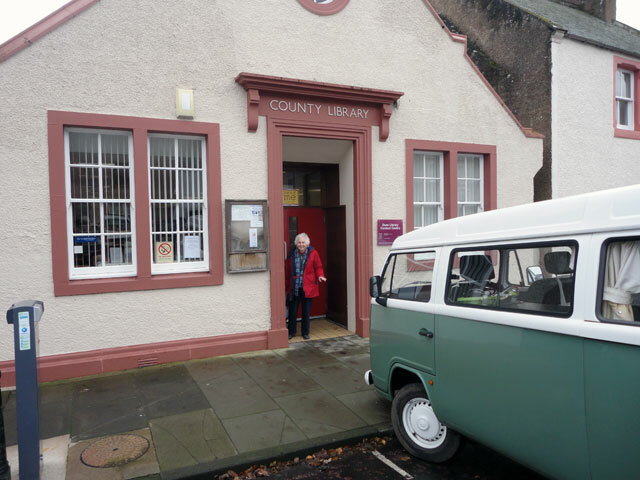 In the afternoon I had a short siesta (and read my book) before taking Mum back into Duns to sign on at the local medical practice. There are two practices which both share the same building. One is called the Duns practice and the other the Merse practice. Mum signed on at the Duns practice and really liked the doctor (who said that he couldn't believe that she was really ninety -- who says bedside manners are a thing of the past)? Back home I unpacked a couple of boxes to show willing, and installed a big cushion for Mix to settle down on when he is in my study. I should report that Mix is settling in very well. Even after a day his barking is stopping and he is extremely happy. With Rowan he loves to run around the garden and he has accepted this new study as his place to be. In the evening we all went off to Scott and Sue's house at Polworth Rhodes, about a ten minute drive from here. Sue gave us a magnificent meal -- salmon followed by fruit flan with cream and ice cream, and we were regaled with all that had been happening at the recent Berwick Film Festival at which Scott had been involved. It sounds like we have come to an exciting place to live. It was good, too, to be in a home that wasn't upside down with a removal going on! Back home -- and glad to go to bed after my first day as a member of the retired generation. Awoke and walked Mix and then set about dismantling my study and cramming all of the leftovers and all of the presents we have been given into our two vehicles. It just wouldn't go and we shall be back in Luss on Friday to complete the task and also to clean the house from top to bottom. (We shall also be conducting three wedding rehearsals and, on the Saturday, three weddings.) Finally, about one in the afternoon, we set off for the Borders, Mix and I in one car and Rachel, Cathy and Rowan in the other. I arrived just after half-past three. I unloaded my car and that was it! (Rachel didn't even unload her car.) 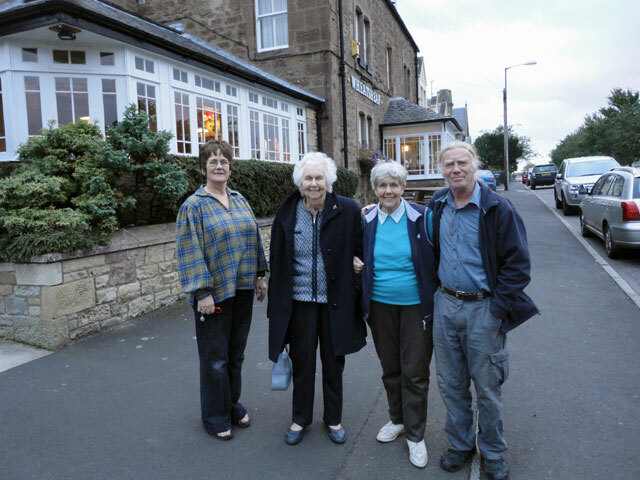 We sat and chatted with Mum and Digger (Olive was in Dundee and Fife) and then in the early evening we set off for Swinton (three miles south) and had a meal in the Wheatsheaf Hotel dining room. It was a very pleasant meal. Back home I checked my emails to ensure that any which came in before I retired were dealt with. (I had to do this on my mother's computer because I have no internet access, no landline -- and no television.) I got a lovely message to say that Jackie Baillie had put down a motion of congratulation to me on my retirement in the Scottish Parliament. How kind! Rachel was filled with the joys of getting boxes unpacked and the kitchen cleared. I decided that I would wait until I was properly retired and went to bed with a book. I tried to take this surreptitiously while folk were arriving in Arrochar Church this morning -- and, as a result, I missed one half of the church! Up at seven and started my final Sunday by walking the dog. Back to the Manse to shower and soon it was time to set off for Arrochar. It was a lovely occasion for me -- intensely sad because I was leaving, but warm and loving and very, very kind. Tom and Dorothy had come to the service as had John and Annette Christie and so many Arrochar friends. The Sunday School had asked to make a short Christian Aid presentation. It was an impressive description of what they had done to help other people with the money they had raised at a recent coffee morning but then it turned into a thank you to Rachel and me from the Sunday School and from the congregation. Rachel was given an olive tree which she will treasure and nurture down in Duns. And there was a cake! The picture was taken at an Easter morning service by the pier at Tarbet -- just another of the million or so memories bouncing around in my head. Made my way down to Luss with tears in my eyes. Everywhere was awash with cars and we had quickly run out of orders of service. It was a special service during which six new elders were ordained and admitted along with Morag (who was already an elder) to the Kirk Session. The six were Muriel, Ray, Lorraine, James, Donald and Nick. They will be an enormous addition to the Session and congregation and there will be photos of all that happened at Luss when I get them from Drew, our resident photographer! 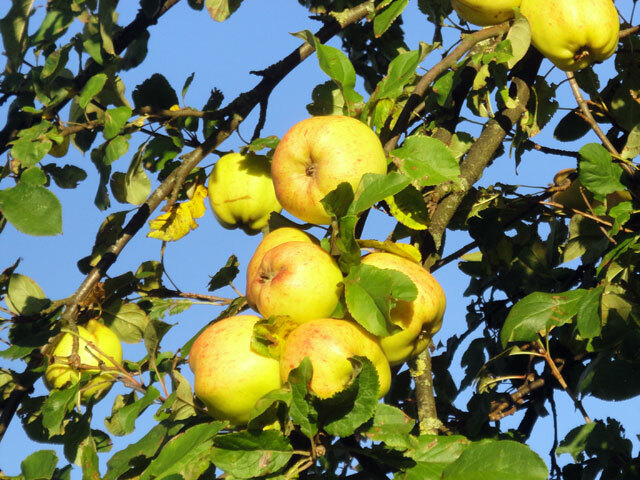 The service ended with the Sacrament of Holy Communion -- and then, totally unexpectedly, the children of the Sunday School led by Andy, who spoke beautifully, presented me with an apple tree to remember them all by. 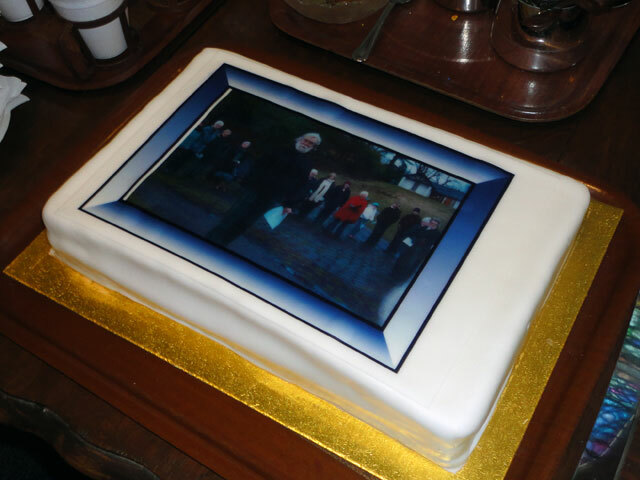 He reminded us all that the church in Luss was not about all that we did but about each other -- and it is each other: all the folk in the pews Sunday by Sunday -- who have made our adventure so exciting and so memorable. I'll love the apple tree but I don't need anything to remember our folk by. Across in the Centre everyone had tea or coffee and soon I had to make my way back to the Church for the wedding of Greg and Catherine, a happy affair. In the Manse we then sat and talked with folk who were still around. My friend Brian's daughter Alison had travelled from Edinburgh. Earlier Sang, now minister at Alloa, was in Church, as were Rachel's cousins Mary and Donald. Mike and June were up from the Borders and so many other people. I was also delighted to see that Will, the little baby who had endured a difficult birth and for whom we had prayed for as a congregation over the last two weeks, was this week with us in church with his parents and grand parents. And just yesterday our Session Clerk had become a great grandfather again! It was really very special. 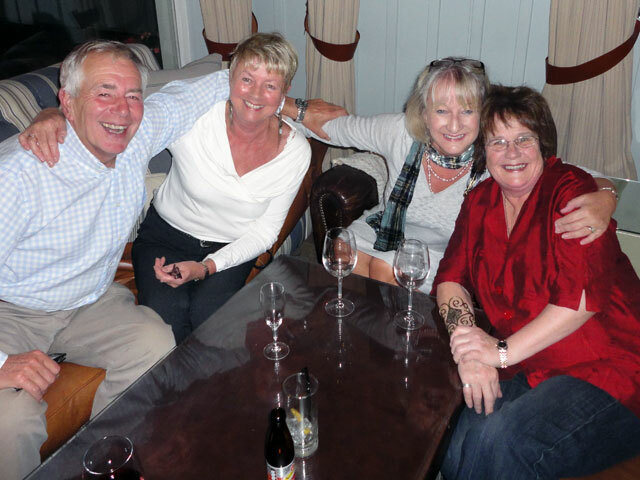 The last to leave, appropriately because they do so much for me, were Bill and Morag, May and Jessie, and Cathy. Rachel and I walked the dogs and then came home and had something to eat. We watched Downton Abbey and were glad to get to bed. Today had been a difficult day but one in which we have been shown so much love and kindness. It is a day I will never forget. This morning Drew, John, Martin, Mike and I set about clearing our many of the nooks and crannies in the church and other buildings and piling almost everything we found into a skip. Everything was soon looking very much tidier and what we have kept will be much easier to find. In the afternoon I returned to my own tidying. We won't get everything done by Monday but Rachel and I will be back in the Manse next weekend for three weddings and we will get everything finally cleaned out, tidied and vacuumed at that time. Later in the afternoon, Tom and Dorothy arrived -- I could hear the gales of laughter from downstairs and went down to join the party. Soon, with help from Mike and Lorraine, I conducted a wedding rehearsal for Greg and Catherine who will be married tomorrow and then Dorothy and Tom came with Rachel and me for a meal at the Village Rest. I had an excellent Finnan Haddie in a white sauce on a bed of mashed potatoes and surrounded by garden vegetables. It is no wonder that the Village Rest is always so busy now, with such excellent food. I was really hungry so I also had a haggis starter and followed it all up with an ice-cream desert. I'll be needing to renew my acquaintance with the Strone very soon! After coffee in the Manse and a bit more time in the study I retired to bed. I had intended to have a really early night but it was still eleven before I got there. It had been, as my father used to say, a good day. 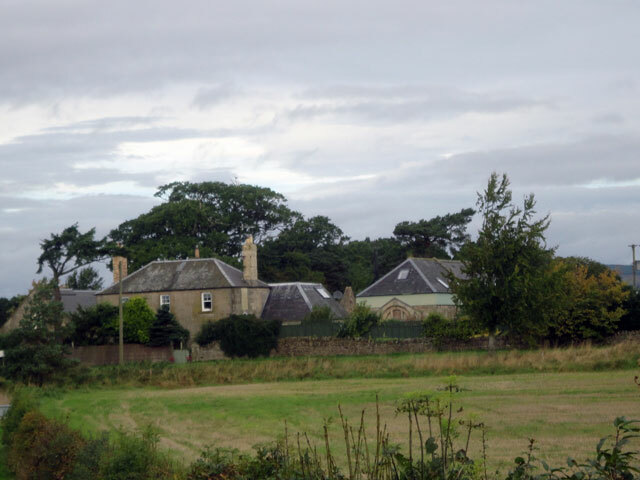 Got up and walked Mix and by the time I arrived at the Manse, folk had arrived to take Olivebank off on the first stage of her journey to Duns. 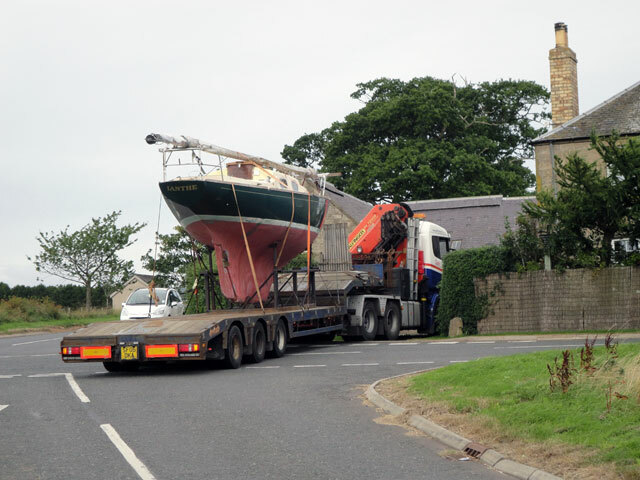 It took them no time at all to pull Olivebank onto the back of their truck and to set off for Helensburgh where Olivebank will stay with Simon while work is done on the trailer before she completes her journey to the Borders. I went back into the study and worked through some of the tasks which were awaiting me -- and a number of people came to see me and to say 'good-bye'. I have been touched by how many people have wanted to say things to me. Roy popped in today and gave Rachel a horse-shoe from Rosa who has pulled the wedding carriage to so many ceremonies at the Church, and Bob popped in to say good-bye to Rachel because he had missed her earlier in the week when he came to visit. In the early afternoon we had the Luss School Harvest Service -- they had brought it forward so that I could share in it and I enjoyed being part of their service. They gave me a lovely Bible signed by every child (and member of staff) in the school. I appreciate their kindness. Then it was back to work before it was time to change and go along to the Lodge on Loch Lomond for a bit of a party. I hadn't known what to expect. 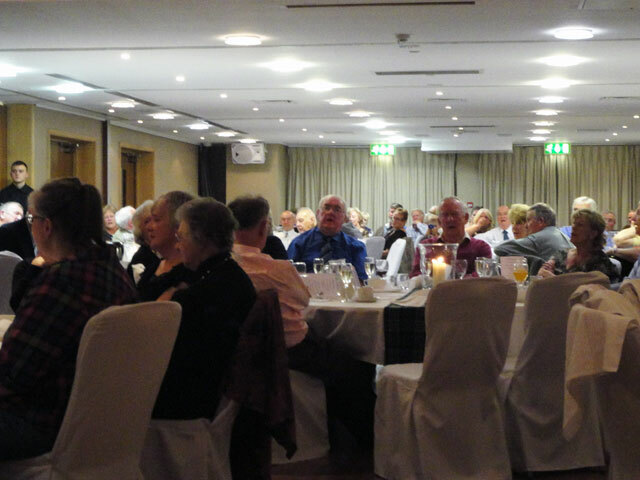 I had been told to be there just after seven but when we arrived we discovered that there were about one hundred and forty people present all gathered in the big function room at the Lodge and that the event was a full-scale dinner. As with everything the Lodge does, it was a superb evening, good food and a glorious company drawn from both congregations -- in fact I think that the total present was larger than the number in the combined congregations! Everything was chaired by Robbie with speeches by Jamie and by Robbie -- and we were showered with gifts: Rachel was given flowers, as was my mother. Rachel was given a chimnea (a very beautiful one at that) and I was given a hugely generous cheque. But it was the words which people spoke to me which pulled hardest at my heartstrings. I was amazed at how far some people had travelled to be part of the evening. Hannah had left work at four and travelled from Carlyle where she is on placement as part of her training, Ross and Anne had travelled from deep in the wilds of Argyll, Isobel and Maggie had travelled from the east, Allan and Flora had travelled up to their caravan, Tom and Dorothy had travelled up from the Borders. And there were folk I didn't expect to see out tonight: Davina, and John MacEachern. Judy was there and there were so many children -- it was special to have Hannah, Katie and Emma who seem to have been part of everything that has happened while I have been here. I sat at the table with my mind in a whirl. So many people so sad to see us going -- but it didn't matter how sad they were it was nothing at all compared to how sad we are to be leaving them: not to be leaving the place (through that is pretty fabulous) but to be leaving the people. All of them have become our very greatest of friends and we will miss them. I guessed too that there was an element of confusion in amongst everyones' sadness. They knew what was going to happen to us -- we would be sitting in the garden at Mount Pleasant on the garden bench presented to us by the Guild by the chimnea in a garden environment which had never experienced the invasion of the west-coast midge, but what of them? It is natural to have misgivings but there is clearly no need. I have never seen two congregations which both individually and together wouldn't know the meaning of disharmony and which are totally united in being a Christian family with a place for everyone. Both congregations also have a very clear view of where they want to go. 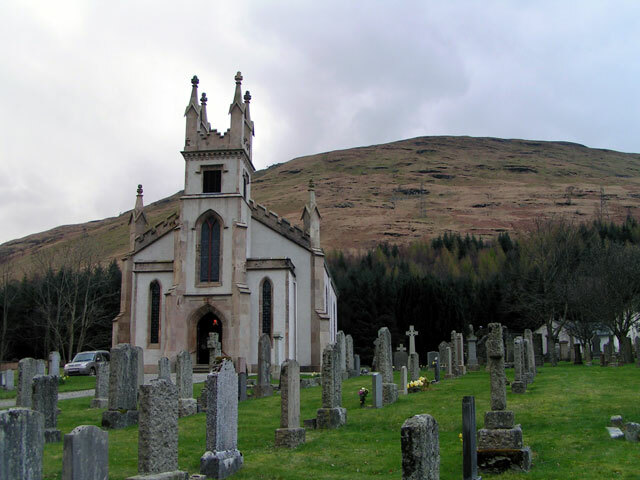 In Arrochar the aim is to be a village congregation serving its community. That's a massive objective, already fulfilled -- but it wasn't always the case. 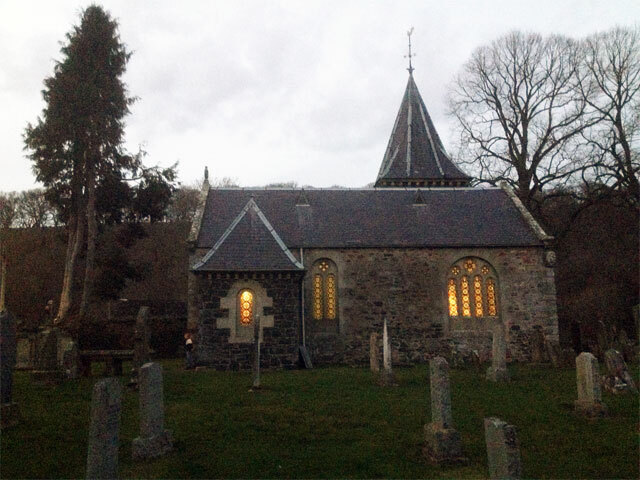 I remember going to see the Presbytery Clerk soon after I arrived and saying, "Well, I expect that you'll want us to start rebuilding the Church," only to get the response that the little hall was quite big enough for any congregation that Arrochar was ever likely to attract. The congregation proved them wrong -- a wonderful restoration job and a fabulous congregation which now has a thriving youth group and Guild and I am so proud of the young folk who have come through our Sunday School. 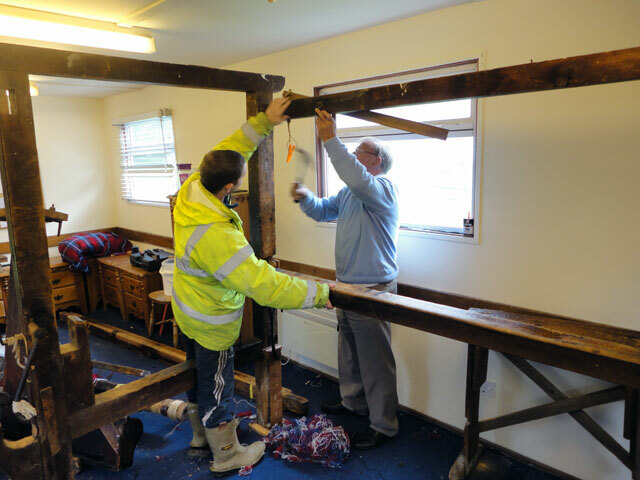 I remember, too, all that the rebirth of the congregation did for the village -- the building of the village hall, the winning of the Village of the Year award and so much more, all of which is now part of the story of Arrochar. Luss too has a clearly worked out statement of where it is going and how it is going to achieve it. Important strands of the Church's mission here are welcoming the hundreds of thousands of visitors who come to Luss each year, the development of the church's youth project with youngsters from all around the world, from Prince's Trust teams and from secondary schools, the work with those who come here to be married -- not because of the economic importance of weddings to the community (five million pounds was a recent estimate) but because of the missionary opportunity of being alongside people from all over our country and beyond at such a crucial time in their lives, the streaming of our Sunday services to people throughout Scotland and throughout the world as well, of course, as continuing to serve the needs of our local congregation and community. I got a lovely email today from one of the staff of Our Lady and Saint Patrick's High School. He wrote: "Being involved with you and the community of faith in Luss has enhanced my time in Our Lady and St Patrick's and has been significant in the lives of our young people and the school. We hope that this connection will continue beyond your retirement (and indeed mine in the not too distant future) as it has been too valuable for it not to." We were also commended for all that we do for visitors here. It started with the creation of the Pilgrimage Centre (built by Jimmy and his Arrochar team) providing a heritage centre for those who come to visit but which also provides a place for local groups to meet -- the Guild, the Cinema, the Heritage Group and so much more. It went on through the building of the Luss Bridge by the Royal Engineers and the opening up of the Glebe with its pilgrimage pathways (which in turn led to the Green Pilgrimage opportunities). Now, of course, the Church -- beautifully restored in 2002 -- is equipped with a superb sound and light show which is the envy of many churches and visitor attractions much larger than ourselves. It has become fashionable to talk about the need to 'do up' the village but the Church was engaged in doing it long before anyone else! With all of this background the Church has little to fear. The services will continue in Arrochar and Luss just as they do today, the Glebe will continue to be open for those who come in large numbers to explore, youth groups will continue to come to stay with us in the Palace -- so proudly named after Her Royal Highness the Duchess of Rothesay's visit in 2010 during which she planted the tree which sits in front of the building. The services will continue to be streamed and people will continue to be welcomed. There will be services of Sunday worship, of baptism and marriage, there will be funerals and the Manse will continue to be the hub of so many of the activities at the heart of local community life. As I sat at table I found myself thinking too of some of the folk who weren't with us because they now celebrate on a different shore being separated from us by death. Separated yes, but sometimes they feel so close. My father was so pleased that I had come here to serve and he helped me enormously during those first months of my ministry here. 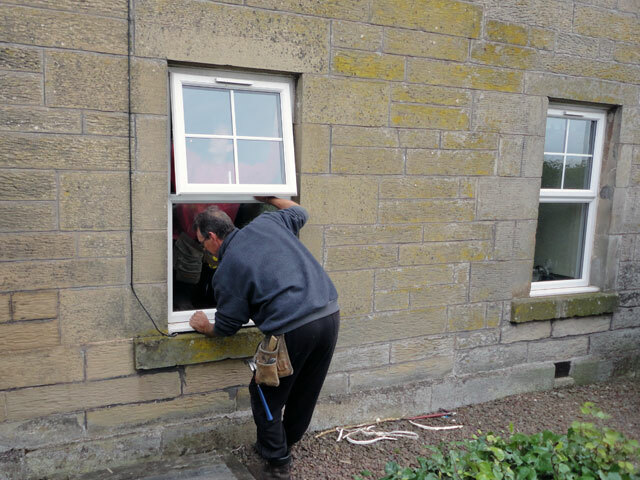 Eric worked so hard for Arrochar Church -- when the presbytery tried to sell it, he insisted on 'helping' by showing prospective purchasers around. Somehow they were never so keen after Eric had told them about the graveyard, about things that went bump in the night and the feelings of the community about the prospect of losing its church. 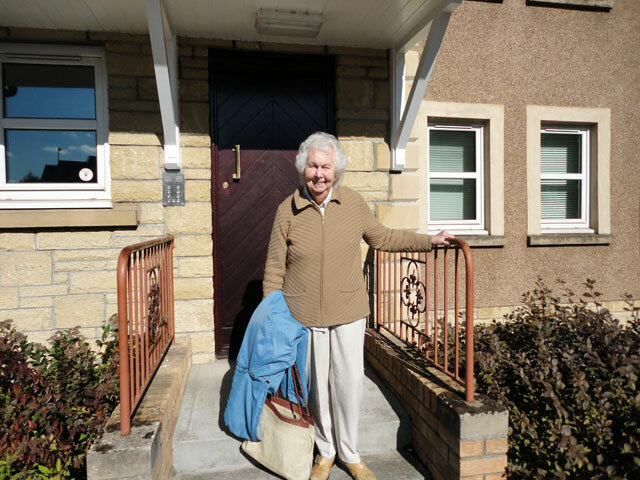 Marion raised so much of the money single-handedly for the Arrochar Church knocking on every door in the village and demanding that everyone contribute! We have some good fund-raisers in Luss. Bettie (from Arrochar) and Val (and it was really good to have both of them with us tonight) made up a ferocious team in the days when they looked after the Church and the Centre together. I found myself thinking of Margaret and Elma, of Hamish (who spear-headed the Luss Restoration), of May Lumsden and of so many more (I knew that I shouldn't have started on this reminiscing because someone always gets left out.) I also thought of Bob who came to see me this week and who worked tirelessly on our youth projects for around five happy years. Then there are all of the folk who arrived when we needed them -- Andy with his IT skills, Bill with his communication abilities, Drew who takes the best photographs and the team of folk who have made the Manse a happy place for so many: Morag and May and Jessie and Cathy and so many more besides. And Chris who looks after the Glebe. It is a wonderful charge -- Arrochar and Luss complimenting each other perfectly -- and in Luss in particular with such a continued influx of new blood, often as a result of weddings or of the welcome which they have received when they visited. I have been fortunate not only in having two lovely congregations but also in having two special Kirk Sessions. So many thoughts going through my mind as I sat and looked out on the assembled company. Rachel and I have been so very, very fortunate and everything we have been able to do has been made possible in very large measure by the love and kindness with which we have been surrounded. God has been very good to us. Having shared my thoughts, here is a view from where I sat. So many friends! The evening was brought to a close by an unexpected visit from the Minister of Glasgow Cathedral -- our mother Church. The Reverend Doctor Laurence Whitley spoke generously about the lives of our congregations and about my ministry. He saw our parishes as being a centre of excellence and his words of encouragement were greatly appreciated by everyone present. Must just say that Robbie had an excellent evening in the chair. He was superb, and along with Jamie, who surpassed himself in his carefully crafted speech, and with the care of the staff of the Lodge on Loch Lomond, and by some great singing from Beth Street with music provided by the organist from the United Reformed Church in Helensburgh, ensured that we all had an evening to remember. I walked home in a dream. It is Thursday and I have become ever so aware of how much there is still to do. I did manage to complete the paperwork -- just as well because no sooner had I done that than the computer packed up! It seems to me that everything is closing down with me. I'll take it away and see if I can get it all working again; it surely can't be just me that isn't suffering from built in obsolescence: perhaps I am but I just haven't noticed it. Worked on all of the paperwork and could just about manage with where I have got to at a push. It took all day and then in the evening we stopped for the final meeting of the Community Council. It is the final meeting, and not because Rachel and I are moving, but because tomorrow nominations close for the new Community Council, our four year stint is up, and I am glad to have completed it. With the benefit of hindsight is it something I would like to do again? Probably not. But four years ago someone needed to do it and no one else wanted to. There were people who needed the Community Council to speak on their behalf and it gave me satisfaction that at least we were able to do that. We were joined at the meeting by Andy, our local policeman, and by George and Robert, two of our local councillors and it was a happy meeting (as they have almost invariably been). After the meeting I watched an episode of Doc Martin before walking Mix and going to bed. Tomorrow is another day! I awoke with much to do, and truth to tell, much of what I had hoped to do is still not done at the end of the day. After walking Mix around the glebe I started to work through the service for Arrochar on Sunday and soon afterwards Mike arrived and wanted to see around the different places at the church, centre and so on in case there was anything he needed to know for the future. Was happy to break of for a couple of hours and do that. We also planned to have a massive clear-out to the skip which is now sitting in front of the Manse. William's memory relates to the giant Advent Calendar with stained glass windows made by Rachel and, on the back of each door, a little Bible verse. The calendar will stay at Arrochar and I hope may be used again in the future so that it can 'tell the story' and make other children 'feel special' as well. 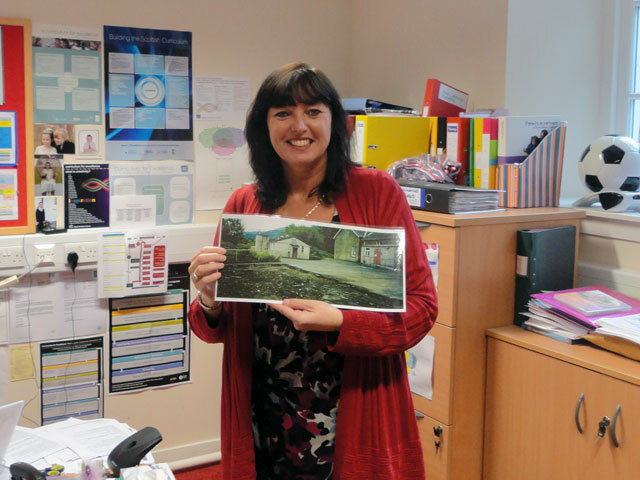 Certainly the assembly made me feel special, and Rachel and I were given two lovely pictures chosen with great care -- one a view of Loch Lomond, the other a view of the Strone, the hill I used to trek up and down every day in an attempt to lose weight! After the Assembly Rachel and I were given afternoon tea with cakes and we reminisced about all that Alison had achieved since she had become head teacher. I was on the selection committee which chose her and so I take special satisfaction from all that she has done! Alison showed Rachel around the school and also showed a picture of how things used to be. What a wonderful transformation -- and so many memories for me, especially of school assemblies and end of term services in the Church. Back home, I set off for the bank to do some more sorting out of finances and then some pastoral calls before returning to the Manse and working through until seven when it was time to meet with the new elders and with Robbie and Mike in the Church to plan for the Ordination Service. Once that was done I went off to collect fish suppers for Rachel and me. We enjoyed them while watching an episode of Doc Martin then Rachel went to bed while I returned to the study to deal with more paperwork before walking Mix and retiring to bed. So much to do and so little time to do it -- how different it will soon be! Tuesday 24th. 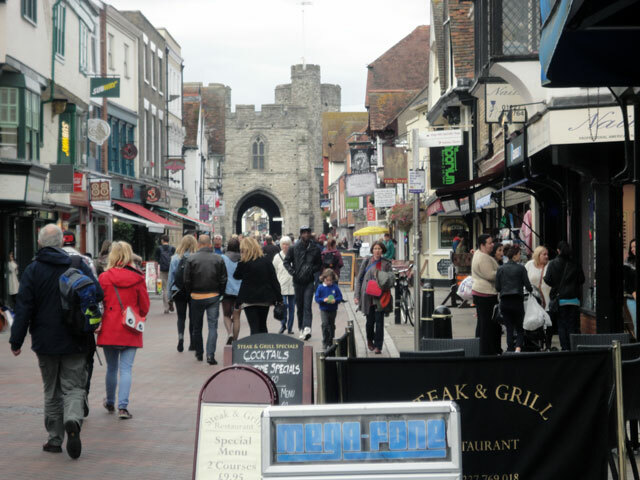 September, 2013 -- So busy I've almost forgotten Mount Pleasant! I got up and walked the dog. Came back to the Manse and showered and it was still not eight o'clock. Got some things done before setting off for Helensburgh for my physio appointment. Came back relaxed to meet Robbie and Mike (from Luss Church) and Ian who is the interim moderator appointed by presbytery. It will be his job to look after the congregations of Luss and Arrochar after I have left and the purpose of the meeting was to sketch out some of the things which I have been doing so that Ian had some kind of an idea of what he will pick up. Early in October I expect that there will be a meeting of the two Kirk Sessions under Ian's chairmanship and they will start to make plans together. I have agreed to help with the weddings in the interim and I will be conducting all three of those scheduled for Saturday 5th. October. 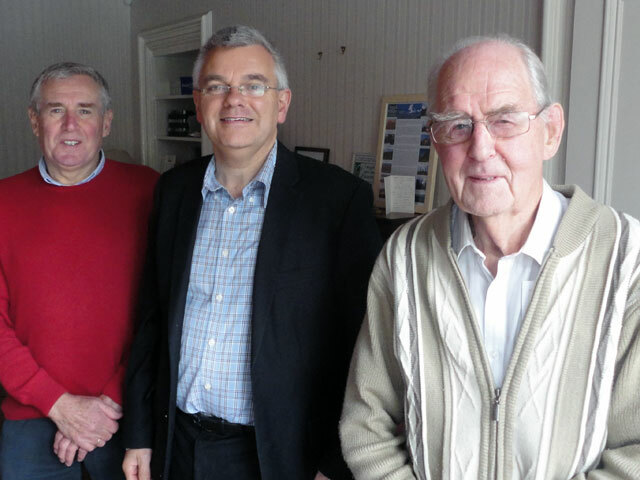 Mike and Robbie indicated that they would really like to have Bill appointed as their locum minister and also that they wanted services to continue the congregational participation which has been built up over the past years. Mike set off and showed Ian around the Church and our other facilities including watching the sound and light show and admiring our Pilgrims' Palace. I set off with things to do and people to see. I also popped into the bank in Helensburgh to sort out some of the financial things I need to get in order. Back in the study I worked on the services for Sunday -- both will be very different: at Luss we are ordaining new elders and will celebrate the Sacrament of Holy Communion. I would have liked to have had communion at Arrochar but as the Session Clerk is away this would have been difficult. But both services will be special for me. Then, after the Luss service, there will be a wedding. Worked well into the evening only stopping for something to eat and while we ate we watched the Young Montalbano (because when we move the recorded programmes on our Sky machine will be lost). Rachel walked Rowan and I returned to the study for a bit longer before walking Mix and falling into bed. It has been a very busy day -- but then retirement looms and, at least for a while, it may be quite different. I intended today to be a day of really hard work but it didn't turn out that way. I walked the dog, settled down at my desk and it wasn't long before Robbie telephoned to say that he and Mike were on their way to see me to talk about some of the arrangements for when I have left (how I hate even the words, never mind the concept). They arrived and we spend quite a while in discussions. May and Jessie arrived to count some of the cash which needs to get paid into the bank. Cathy arrived and opened the church for visitors. Bob arrived to say hello (well, I suppose it was really Good-bye). Whatever it was, it was particularly good to see Bob. He and I worked closely for several years building the glebe pathway, developing the Pilgrimage centre and making a go of the international youth programme. It's true to say that none of these things would have happened without Bob's efforts and I was touched that he made time to come and see me today. I hope that he, and others too, will come and visit us at the Granary when we have time to welcome them and show proper hospitality.My friend Peter arrived and took me for something to eat. He is off on holiday to Portugal tomorrow so will miss my final days here. I am sorry about that. 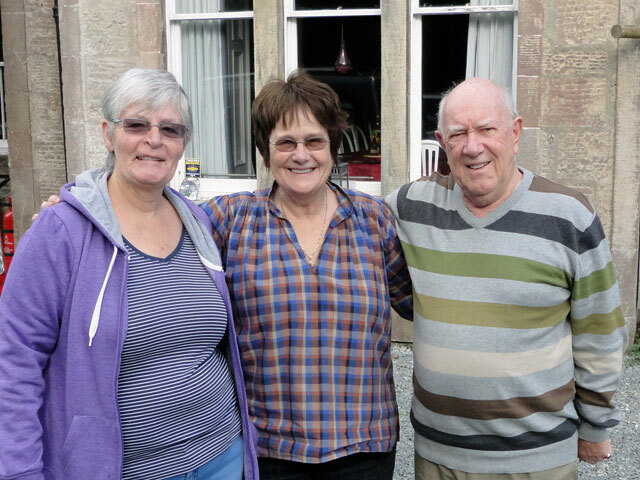 No sooner had Peter left than Rachel returned from seeing her cousin Mary from Comrie. We walked both of the dogs on the Glebe and then we went down to the Boat House at Cameron House to join our good friend Judy and her friends Janet and Roger. I say 'her friends' but I hope that they are really our friends as well. We've known Judy for many years and I was so pleased that she had come up from the Lake District to be in church yesterday and had brought Roger and Janet with her. Roger and Janet farm mushrooms and many years ago when we held a garden party in the manse grounds to raise funds for the new church organ they arrived laden with mushrooms which they sold to help our fund-raising efforts. It was Judy who gave me the card at the top of this entry. 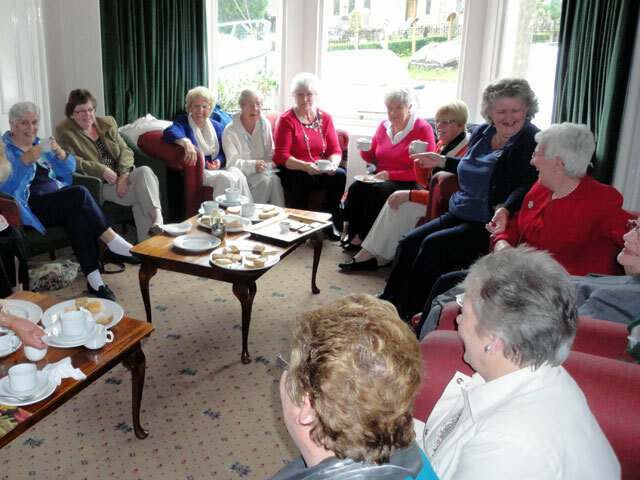 It was from Vivien, a friend of Judy's and a friend of ours who comes to Luss from time to time and who joins us regularly on lussonline. I've been given so many cards and letters over the last few days and I have appreciated every one of them -- I'll keep them and treasure them for ever -- but this one pulled a chord inside me. 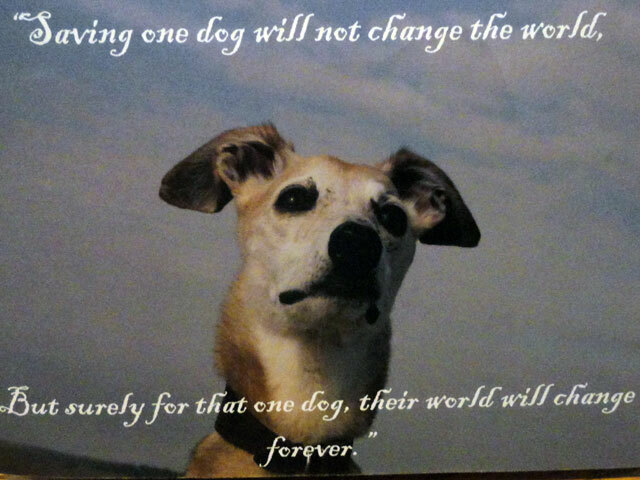 It is a lovely message 'Saving one dog will not change the world, but surely for that one dog, their world will change for ever.' You won't need me to tell you that Vivien is a doggy person and the message is powerful because it doesn't just transfer to other people but contains a universal truth as it is the antidote to the suffocating feeling of why should I try to do anything because anything I do will make such a little difference? Everything we do makes a difference for someone. 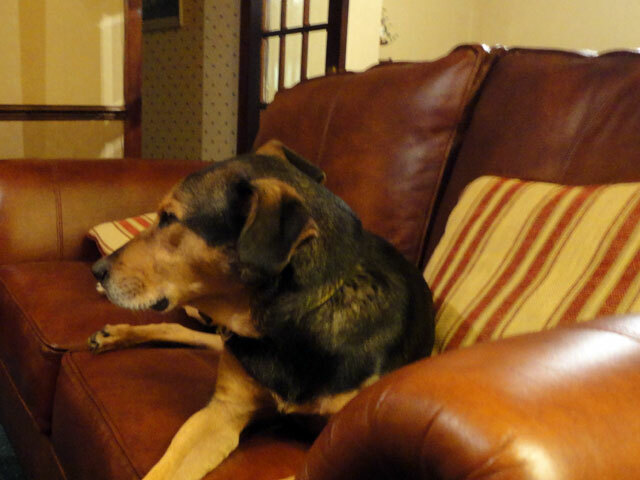 So now I am off out to take my rescue dog, Mix, for a walk before bed. It's not the day I expected but it has been a very special day. It didn't start out that way, in fact it was a really wet and nasty morning when I walked Mix along the river path. It was still wet when I arrived in Arrochar and it was raining when I stood at the door to shake hands with folk as they left the service at Luss. But none of that stopped it being a thoroughly lovely Sunday -- and it is the Sunday mornings with my folk in Arrochar and Luss that I will miss most when I retire. 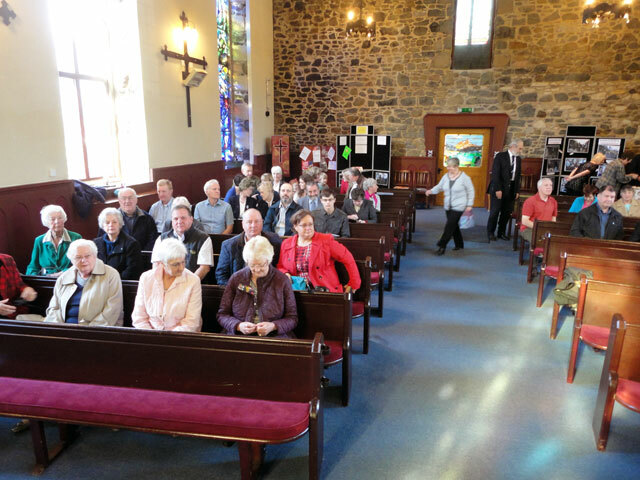 I enjoyed the service at Arrochar and there was a good turn out. 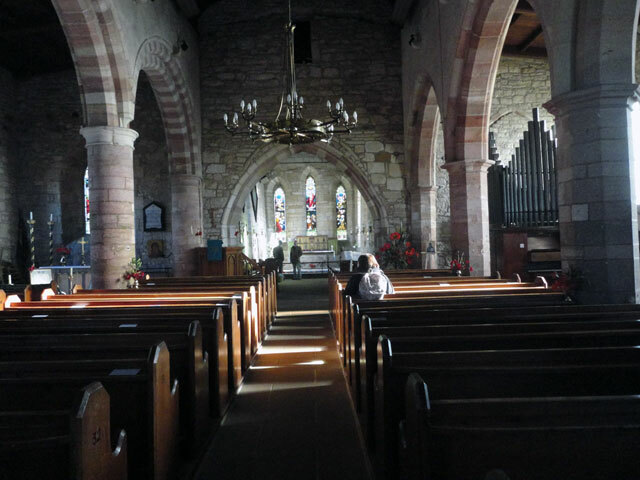 In Luss the Church was virtually full and in both churches there was a super friendly atmosphere. At Luss we had a party of Canadian and American pilgrims who were journeying throughout Scotland spending time at the important Christian sites. 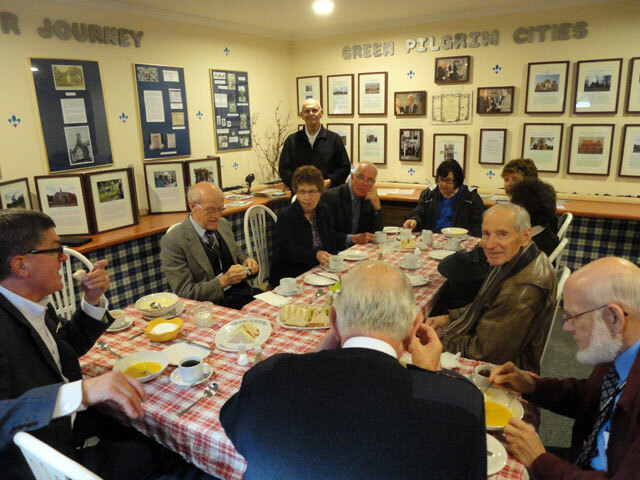 After the service Bill and John told them our story and showed them our sound and light show before they were given soup and sandwiches in the Green Room by Morag and May. You can see from the picture that they had a good time. My friends Simon and Eileen joined us in church and then, with a little help from Drew and Martin, Simon prepared Olivebank for her journey later in the week from Luss. Allan, one of our removal men, came back to Luss with his wife Stacey and his daughter Danielle, to show them around Luss -- the site of his three days of hard work last week. It was good to see them. Sorry that I caught John with his eyes closed! It was late in the afternoon before everyone left. It had been a lovely day and in the evening we watched the first episode of the new series of Downton Abbey before walking the dogs and retiring to bed. Saturday 21st. September -- A Quiet Saturday! 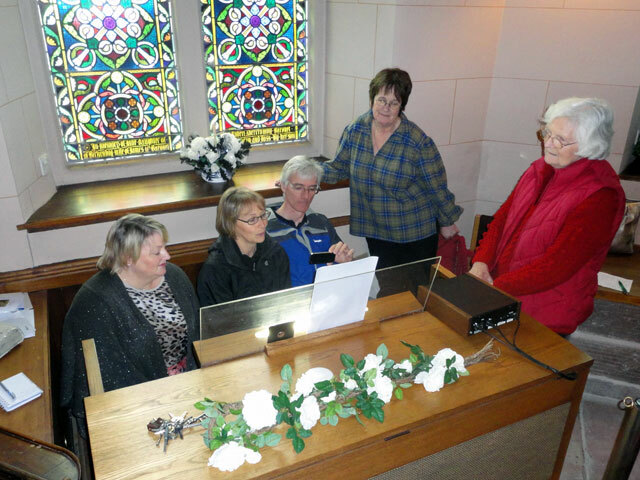 The organ class in full swing -- Carol, Lindsay, Nick, Rachel and Morag -- admiring the fine sounds emanating from our organ. Up early (well, not too early) and walked the dog. Today is one of those real treasures: a Saturday without a wedding. We did have a wedding arranged for today but serious illness in the family led to a quicker wedding nearer to home. Actually we have had three weddings cancelled within the last month, a quite unique experience -- in a couple of cases it was because the couple had decided not to get married. I suppose that it really is a blessing that they discovered that they weren't for each other before they got married -- that's a truism, everyone says it: but it really is true. Took advantage of the day to try to work through all of the financial papers which I have relating to the Church and the different organisations with which I am involved. Discovered that many of my papers have disappeared down to Duns so things were more complicated than I imagined, but hey! in the overall scheme of things these are minor problems. I'm still celebrating in my heart about a little baby who has had a difficult birth and had to be rushed to another hospital for serious treatment and who is now making good progress. That's something important -- and praise God and be grateful for the skill of doctors and nurses, for the relief which his parents and grandparents are feeling today. Worked through to the evening, stopping briefly for a snack with Bill and Morag who were through so that Morag could attend Rachel's organ class. Like so many things, it is not exactly as it seems. We have a wonderful organ but the keyboard is controlled by a computer, making it, I suppose, a little bit like an old fashioned pianola (you remember: a paper roll was inserted into the piano and this 'played' the keys according to a succession of holes in the roll). So the keyboards of the organ are controlled by computer leaving the operator to choose the organ stops (instruments), control the volume and the speed and turn the keyboard notation into a work of art. Rachel not only operates the organ but prepares all of the files -- the instructions for the keyboard -- and includes descants and other appropriate embellishments. But Rachel will be leaving for Duns in just a few days. The team pictured have agreed to take over the organ. To begin with Rachel will send the files by email but eventually that will be taken over in house as well. Realise that I have never recorded my pleasure in Durham's victory in the county championship. It really was a spectacular achievement and once I am retired I will be able to join all of the old buffers sitting watching the cricket from the pavilion and explaining to everyone that it isn't as it was in my day. They have done well. 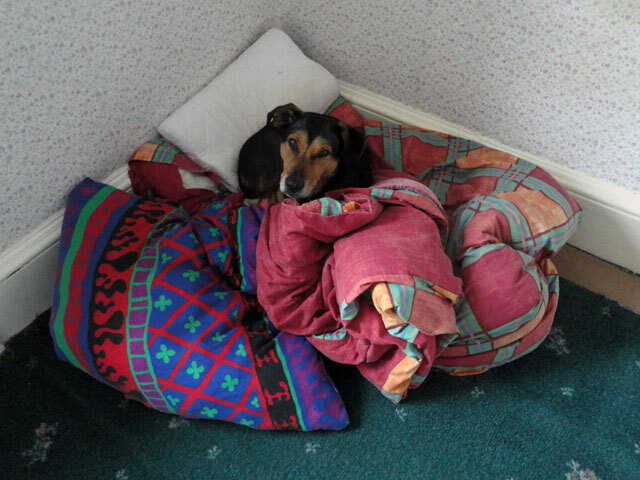 Mix has found the one comfy spot in the house! Today has been one of the strangest days of my life. What's more, it has completely taken me by surprise. I haven't allowed myself to think past the removal and now that that has been successfully (?) completed, I can turn my attention to getting everything here in order so that I can leave my Churches in a good state for someone to take over. Only nothing ever quite works out the way it should! Because I got stranded in Duns on Monday and had to stay the night there, I wasn't here to supervise the removal at Luss. As a result (and it is no-one's fault but mine) everything in the Manse has ended up in Duns. That includes the things that we intended to remain here; it includes the things we intended to go into the rubbish bin, and it includes the papers and so on I intended to work on during the next ten days. So I started the day in absolute consternation! Gradually some kind of sanity emerged. I will just have to work through the chaos! Started by walking the dog. Then I got stuck into preparing the services for Sunday -- printing the Orders of Service, preparing the music for the organ, preparing the service itself and all of the scripts for those who share in the leading of the worship -- in fact all of those tasks which are such a part of my life but which will very soon become half remembered parts of a distant ritual. In the late morning Robbie and Mike arrived, closely followed by Neil and Jamie, to talk through who will pick up all of the different tasks which have been mine over so many years. Soon it was time for a wedding -- that of Daniel and Katrina. The weather yesterday was shocking but today all was calm and fair and it was a splendid wedding. I enjoyed being part of it. Then it was back to work. The services to complete, weddings to sort out -- I have agreed to return to conduct the three weddings which will be held on 5th. October. It would be too big a baptism for whoever takes over from me and I will be delighted to share with these couples in their special day. Rachel and I had a nostalgic walk around the glebe -- it really is looking good -- and then I went off to Balloch to collect a Chinese take-away. Once we had enjoyed that we watched the Young Montalbano on television (it belongs to the Church and was screwed to the wall, otherwise it would have been away as well) and then, after walking the dogs, we went to bed. It has been a day I will remember! Got taken to task by someone who reads the blog (and hasn't met me) for not putting a picture of myself on the web-site so that they can see who is writing all of this stuff. So here I am! Sixty-seven and a half-years old, retiring in eleven days time and moving from Arrochar and Luss (where I have been enormously happy) to Mount Pleasant in the Borders (where I expect to be happy as well). Awoke on Thursday and breakfasted in the farmhouse before spending the morning starting to sort out our new home. It was bucketing with rain which made us realise just how lucky we had been over the last three days having been given a window of really good weather to complete our removal. I had the task of trying to organise our second bedroom. We have a desk and a cupboard and a small bunk-bed unit in it -- all of this is quite temporary and will be sorted out once we are back in the Borders on a more permanent basis. Rachel, meanwhile, worked in the kitchen and in the main bedroom. Around one we stopped for lunch and soon afterwards I set off for home with Mix in the back of the car. I got hopelessly lost and ended up driving through Edinburgh in the rush hour and then through Glasgow in the rush hour and arrived back in Luss about 6.15 p.m. to discover that Rachel had started the wedding rehearsal (for which I was very thankful). Once that was over we drove down to Helensburgh to spend the evening with Simon and Irene and with their friends John and Marlene from the United States. It was a lovely, relaxing evening with a glorious meal and we returned home around eleven fifteen in time to walk the dogs and go to bed. The back of the moving has now been broken and, although there are many things still to sort out, I can now see a light at the end of the tunnel (even if it is still quite dim)! Ian, Malcolm, Stuart and Allan -- job done! 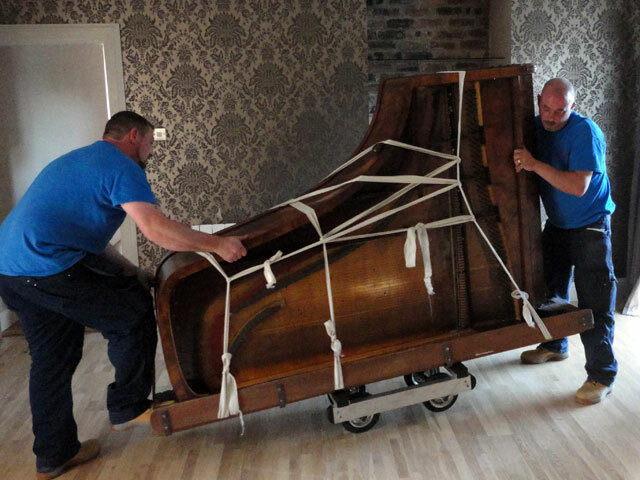 Awoke early in Luss and by 8 a.m. the second load of furniture was being loaded into the three removal vans which were at the Manse -- having returned the previous day from the Borders. There wasn't a huge amount to do but this was because so much had already been taken down and because a great deal of work had been done in the latter part of yesterday. Soon after ten the vans were on their way. Rachel, Cathy, Rowan, Mix and I loaded ourselves into the car and set off about half an hour later -- Mix travelled in the back with Rachel, Rowan sat happily on Cathy's knee and was as good as gold. We had an uneventful journey arriving at Mount Pleasant around one in the afternoon. Olive had baked a cheese and bean pie (well several) and she fed the removal men first with pie and with bacon sandwiches and then she fed us. Rachel and I were on duty directing boxes here there and everywhere -- all kinds of things which weren't meant to come down here have arrived and there will need to be a sorting out and returning of bits and pieces as well as a getting of some skips for a total throw out as well. 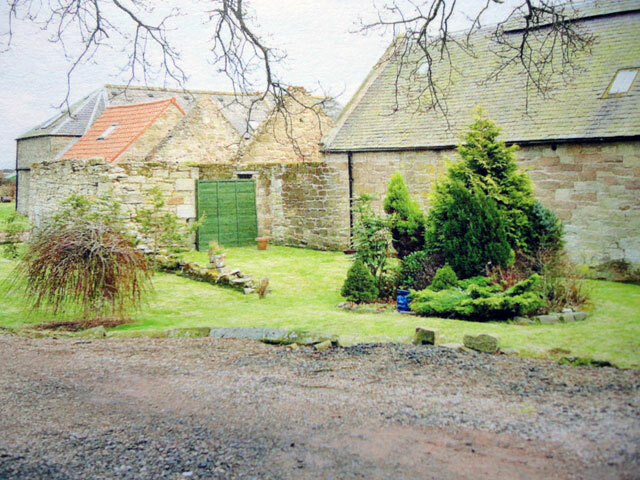 Rachel and I have downsized from our home in Wemyss with seven rooms and a Manse in Luss with seven rooms to a new home with three rooms -- fourteen to three, so clearly it doesn't go! So the last thing we needed was for some things which don't belong to us and some things which belong in the skip! The removal team -- who have been fabulous -- left for home about seven in the evening and afterwards Rachel, Cathy, Mum, Olive, Digger and I enjoyed an evening meal in the farmhouse with all of the ingredients of the meal from the small holding and chicken run itself. Went to sleep (in a bed) after walking Mix. Malcolm outside the door of the Granary and it is not yet eight o'clock! Awoke early and was just coming to when I realised that four removal vans were driving in to the courtyard. I was panicking because I realised that I should have been going to my physio but it had gone out of my head when I discovered that I couldn't get back to Luss last night. I had no phone number for my physio but I got Rachel who managed to get my apologies to Lorna. The removal team had left Luss before five to be down at Duns so early. At once they set about unloading their vans. The first problem was that the side-board which Olive and my Mum really wanted to have in their front room wouldn't go through the doors. Before nine a joiner was on site and a window had been removed. and five minutes after that the window was back in position. By now Tom the painter and decorator had arrived to continue work on Mum's new upstairs lounge, work was also continuing apace on emptying the removal vans and then Ianthe arrived on the back of one of Alan Galt's lorries. 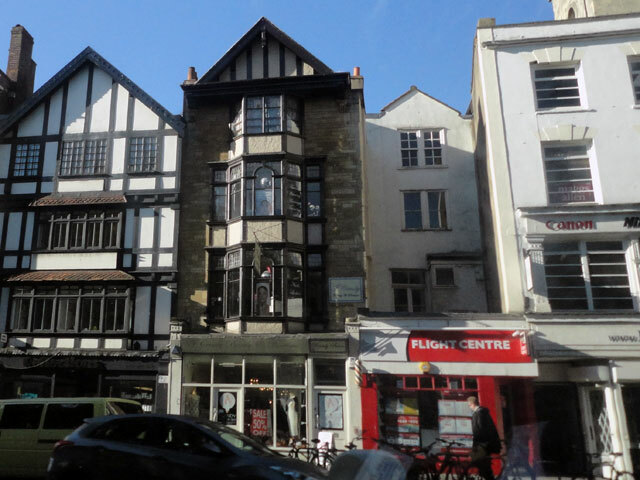 I was enormously impressed by the skill with which the driver and his mate controlled the crane and manoeuvred Ianthe in the relatively confined space of a small courtyard filled with vans and cars. It wasn't long before Ianthe was parked up by the wall in the corner which is to be her home for the next little while. Soon afterwards I set off with Malcolm in his van for Luss. We joined the others at Costco for lunch and were back in Luss sometime before four in the afternoon. 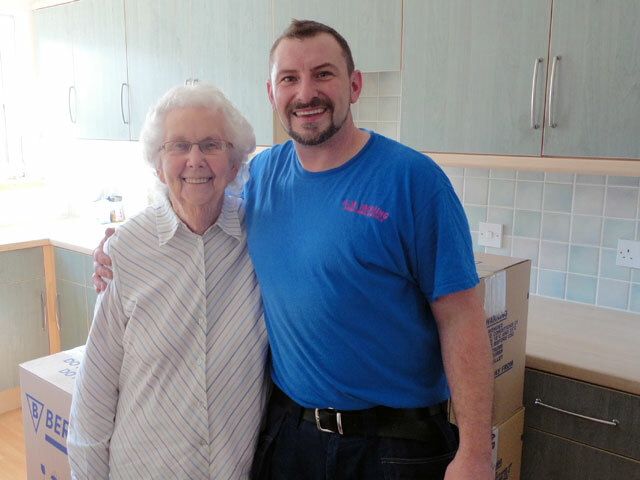 There were more boxes to be loaded and furniture to be carried out to the vans and then Simon arrived to pump out Olivebank who will also be moving from Luss within the next week or so. Just about eight the removal team, Rachel and I, went up to the Village Rest for a lovely meal -- made the more delicious by how hungry and tired I was -- and then it was back to work once more before a final coffee, a walk around the village with Mix and a welcome collapse into bed. I have to say what a wonderful team our removal men are. This could have been an horrendous experience but they are turning it into something quite special -- and how everyone is rallying round to help! 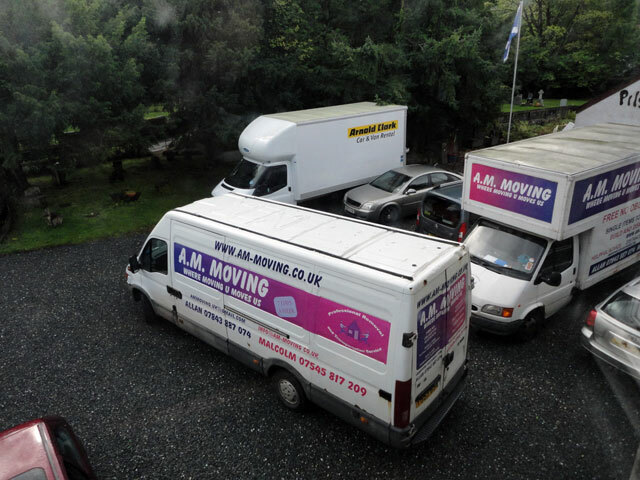 Vans started to arrive early for the Removal Van Convention held at the Manse -- we managed five by the middle of the day! I was up early today anxious to walk Mix before everything started to happen. I was glad that I had because the first vans arrived early -- four of them, driven by Allan and Malcolm, Ian and Stewart. Soon afterwards Sandy arrived to dismantle and collect his loom and to drive it down to the borders -- Sandy lives at Melrose and, with Rachel at Duns, they hope to do some joint projects in the coming months. 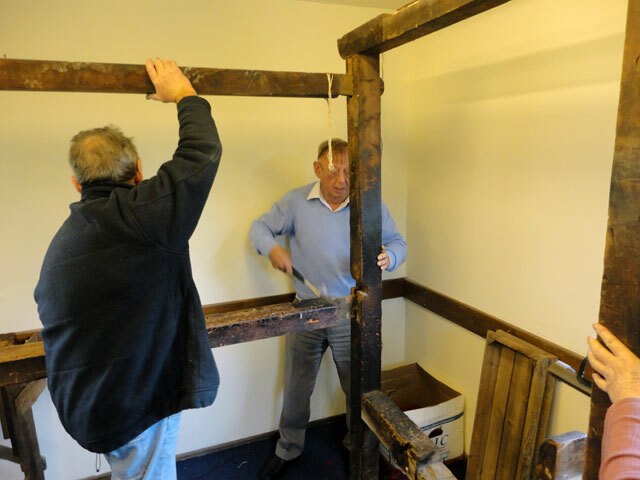 Alastair -- who helped Sandy move the loom from Tarbet all those years ago, came to help with the dismantling and then it was all hands to help load the loom into the van which sandy had driven up from the borders. Once the van was loaded I set off for the borders to help Sandy unload at the other end. Meanwhile Rachel, with help from Cathy, worked with the removal team -- Rachel took them all out for a meal at the Village Rest and everyone had a good time. I arrived down at Duns just before 4 p.m., just a bit ahead of Sandy. Tom was waiting for me and I told him about a problem I was having with Rachel's Berlingo (which I was driving because it was filled with my clothes). It seemed that the rear off-side tyre was always just a little bit flat. Tom discovered that there was a nail in it. We thought about changing the tyre but couldn't find the tools. We even phoned the Citron dealer to ask where the Berlingo tools were installed. The dealer (in Kirkcaldy) promised to phone back but didn't. So it was decided that Tom would take the Berlingo away to get the tyre repaired and I would stay overnight and travel back to Luss with the removal men who were setting off from Luss at 5 a.m. to do a first unload before returning to Luss to pick up more items. Sandy arrived and with help from Digger and me the loom was unloaded and then we all joined Olive and Rita (Sandy's wife) for tea in the farm kitchen. Later on we enjoyed an evening meal -- mum, Olive, Digger and me -- and after that I was happy to get my head down in the Granary. It had been an eventful day! What a lovely day! It started at Arrochar where I conducted the ten o'clock service -- the lectionary presenting us with the fifteenth chapter of Saint Luke's Gospel, without any doubt my favourite chapter of Scripture. Having conducted that service and grabbed a cup of coffee with the church folk, we drove down to Luss for the morning service there at 11.45 a.m. After coffee in the Pilgrimage Centre and a chat with Bill and Morag about the week's activities (what would I do without them), Rachel and I spent some time packing boxes -- surely the end is in sight? In the early evening Jonathan and Vivienne took us for a meal to the Loch Lomond Arms Hotel. It was good to have a chance to sit down in peace and chat with them both. This week has been so busy that we have been like ships that pass in the night. Back home we had a coffee before bed. Tomorrow the removal vans arrive! Spoke to Mum on the telephone. She had been taken to Gavinton Church by Tom. 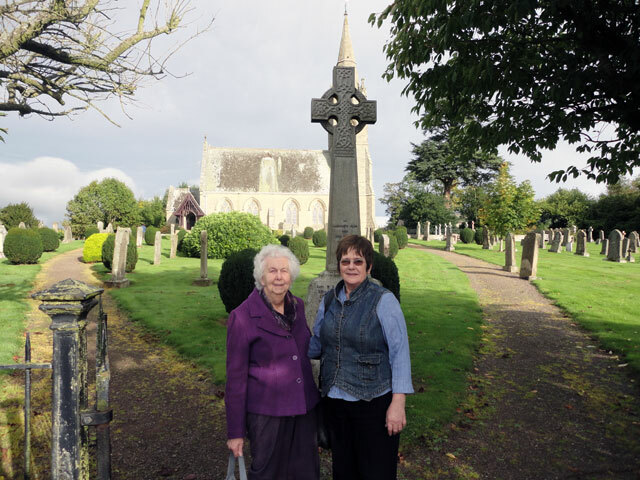 The service had been conducted by the Minister, Ann Inglis, and Mum had enjoyed it very much -- particularly as it was a service of Holy Communion and because the common cup was offered to the congregation. 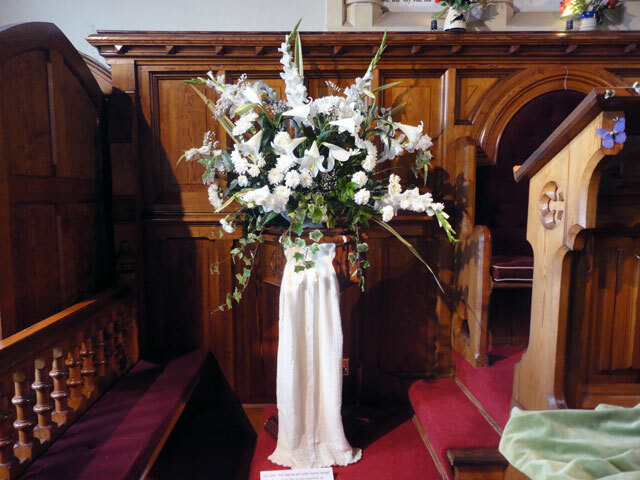 She had found the congregation to be very welcoming and she was even given the church flowers for her new home. That's the way to win new members! Saturday 14th. September, 2013 -- A normal Saturday at Luss! 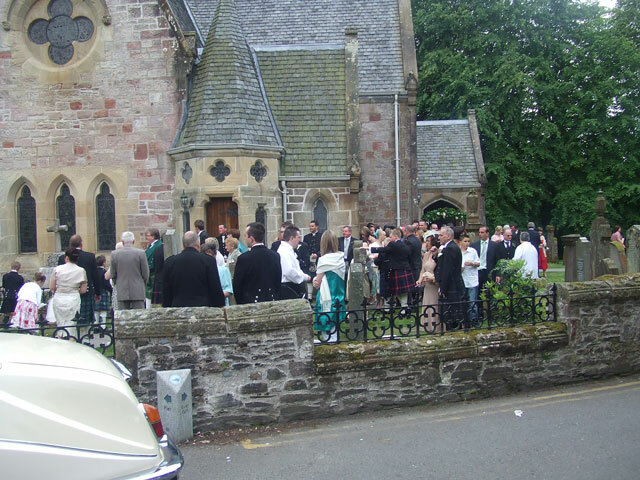 A typical Luss Wedding scene. It wasn't really a typical day for us because we had our usual appointment with boxes which had to be filled. But for Luss it was a fairly typical day -- a wedding in the Church (often there are two or even three) and loads of visitors who have come to explore our beautiful little village. I got a break from 'boxing' when my friend Peter arrived for coffee -- he was actually out looking for peat for his fire but popped in for a chat as well. The wedding went well and after some more time spent working through the house I drove down to Balloch to collect a Chinese meal for Rachel and me -- and soon after eating it we went to bed. Spoke to Mum on her telephone -- it was a new phone which she had bought today and was trying out -- now she will be wearing it out! Mum told me that she was going to one of the local churches tomorrow -- evidently there are two local churches, one in Duns and one in Gavinton. Mum has friends in both so hasn't yet decided where she will go. I suspect that we are in the parish of Gavinton so I expect that there is where I will go. I can hardly have spent the whole of my ministry extolling the virtues of the parish system and then go elsewhere! However, we will see. Some superlative cricket results -- Durham with an incredible win over Derbyshire which takes us well clear of the top of the Championship (you'll gather that I am a member and a supporter of Durham County Cricket Club) and England with a last over victory over Australia which sets up the final decider on Monday beautifully. I do hope that game is not affected by the weather. After yesterday's blitz on boxes I thought that today would be easier; but I woke with my body telling my brain that it really couldn't cope with another day like yesterday. Well it was never going to be that way anyway because there were a number of duties which had to be undertaken today. I now begin to understand why they say that retiring is quite stressful -- I have to work right up to the 30th. September, but I also have to have moved out by that date and as my job (shorthand for calling) takes every minute of every day, this is really quite hard! Today I did fill some boxes but I also conducted a funeral at Cardross Crematorium. It was the funeral of Robert Fulton who was for many years the village joiner in Arrochar. 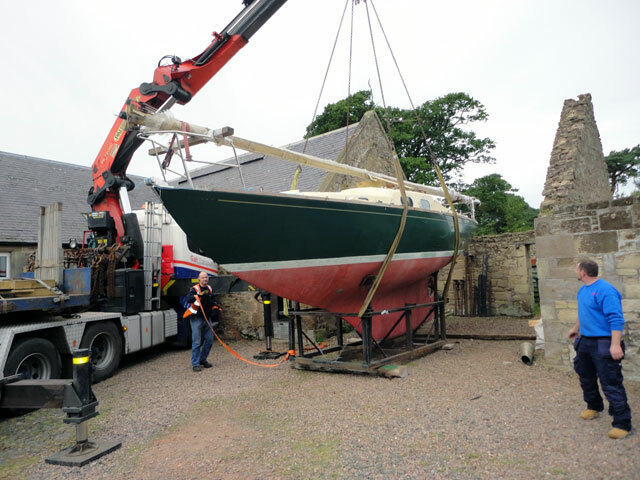 I also conducted a wedding rehearsal for tomorrow's wedding at Luss and then I had a conference meeting to discuss the moving of my boat 'Ianthe' from Bowling to the borders. 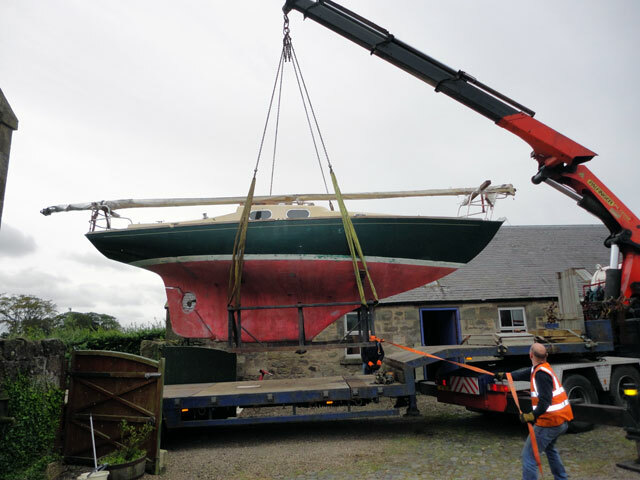 Tom has been active on my behalf and Jimmy who has been working on the boat delivered some spare marine timber to the house to be taken south. It seem that Ianthe will be in the borders before I am, and Simon is also arranging for 'Olivebank' to leave the manse in the next few days -- what a lot of really super friends I have. In fact I'm getting letters all the time from people who want to tell me how they will miss us when we have gone -- and even to say that we have added to their lives while we have been here. It is quite humbling. Bill and Morag arrived this afternoon and decided that we were both looking tired so they took us out for a meal and absolutely wouldn't take 'no' for an answer. How fortunate we are! Meanwhile down in the borders Mum, Olive and Digger continue to get the house into some kind of order. Mum is delighted with her new upstairs lounge and even more pleased to have a telephone again. I tried to get through many times but she was always engaged. I think that speaking on the telephone is her favourite activity. I'm reminded of the old BT advert, 'It's good to talk'. Thursday 12th. September, 2013 -- Boxes! Boxes, boxes, everywhere -- and scarcely a place to sit! There is little to write about today. There was to have been a wedding but the couple decided not to get married so today Rachel and I filled boxes and carried them around the house. I ended up more tired than I can ever imagine and there is still so much more to do. After twelve hours hard at it we flopped down on a vacant piece of furniture and had a snack, walked the dog and went to bed. The glebe continues to look good -- yesterday I took this picture of the tree planted by our friend Anne in memory of her father. 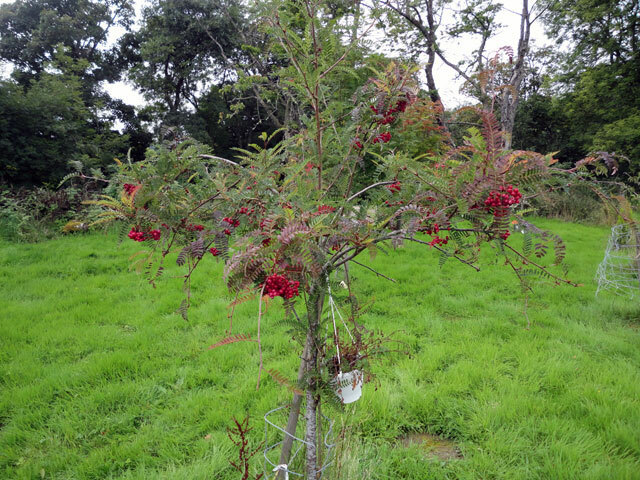 She has since died herself but she would be so pleased to see all of the berries on her tree. As well as the memory garden (which is getting ever larger) we have now designated a little bit of the glebe in memory of pets. It has come in response to a request and it is alongside a new pathway which will tell the story of Saint Francis, so it is really all very appropriate. 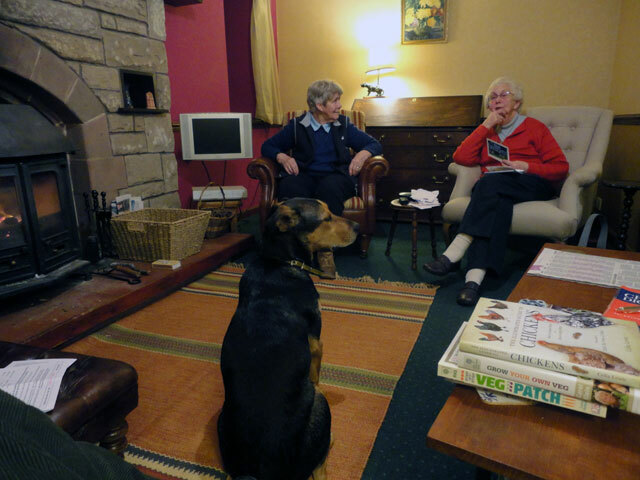 Down in the borders, Mum, Olive and Digger continue to get things in order. 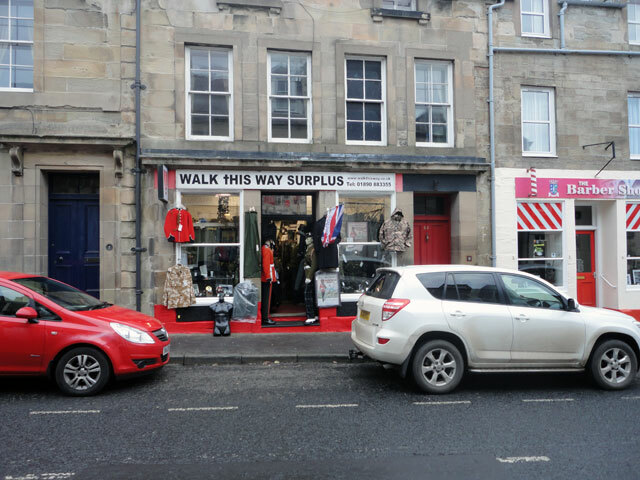 They have done their first large shop in Berwick and Mum now has her computer up and running. Continuing on the theme of trees, Digger harvested his plums today and Olive is looking for interesting ways of serving plums. I suggested plum crumble (served, of course, with ice cream). I include the suggestion here in the hope that when we are down next week that it may have been acted upon and that plum crumble is on the menu! 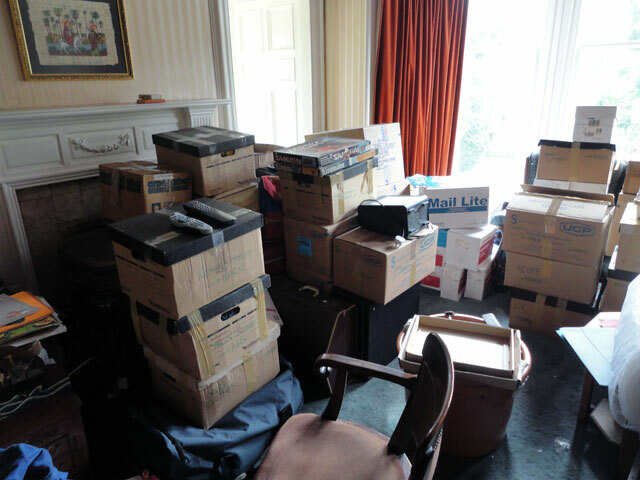 Some of the 'over-flow' from the dining room into the lounge! We had a lovely day in Luss today. I rose early and walked the dog and was concerned that it really was rather wet. Normally this wouldn't have mattered but today it did because today we were being visited by around forty members of the Guild of Bennochy Parish Church in Kirkcaldy. No ordinary Guild this, for Bennochy was the Guild to which my mother belonged before she set off for Mount Pleasant and, had she not just moved, then I am sure that she would have been with us today. 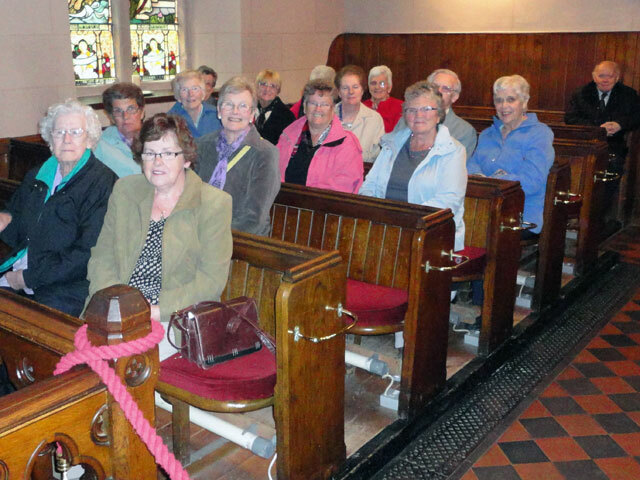 For newcomers to this blog, Guild visits are very much a part of the activities of Luss Parish Church. After our celebration year of 2010 we decided that we would keep the celebrations going for a little while longer by inviting Guilds from all over Scotland to come and visit. We would provide afternoon tea, show them around our Church, our Pilgrimage Centre, our Glebe Pilgrimage Walks and share with them something of our pilgrimage adventure. So many Guilds have come to join us and take advantage of this invitation that what was intended to be part of our programme for 2011 is now still going strong in 2013! After afternoon tea at lunch time because later in the afternoon our ladies (and one gentleman) were going to dine at Bannockburn, everyone came across to the Church where we told them our story and showed them the sound and light show which seeks to tell the story of Luss Church in just seven minutes. 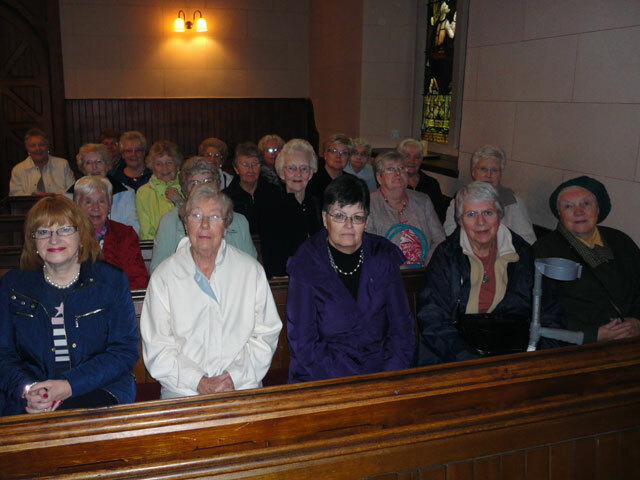 Some of the ladies gathered in the Church for the sound and light show -- I forgot to ask everyone to smile! Everyone is doing better in this picture -- I must have remembered to ask everyone to smile. After time in the church, we set off in three groups to visit the Loom Room (where Rachel demonstrated the weaving of the Luss (St. Kessog) tartan on an old, 1820 Armstrong loom), the Heritage Centre in the Pilgrimage Centre, and the Green Pilgrimage Room. We also visited the Pilgrim's Palace (home to our young folk when they stay with us) and, of course, the Glebe where we walked the Kessog pathway together, returning to the car park in time for everyone to board their bus and set off for Bannockburn where their high-tea awaited them. All my fears about the weather had been proved to be unfounded as no sooner was lunchtime past than the sun came out and everything was beautiful -- and warm as well.The sun was still shining as we waved our friends off on the next stage of their journey. It had been another good visit. I returned to the manse where all of our helpers had coffee together after the activity of the day and then, once they had left, I retired to the study to catch up on work which had to be done, before stopping for a meal with Rachel, and with Jonathan and Vivienne who had been out for the afternoon on their sailing boat. Down at Mount Pleasant my Mum got her new telephone-line and she is once more back on broadband: so look out world. 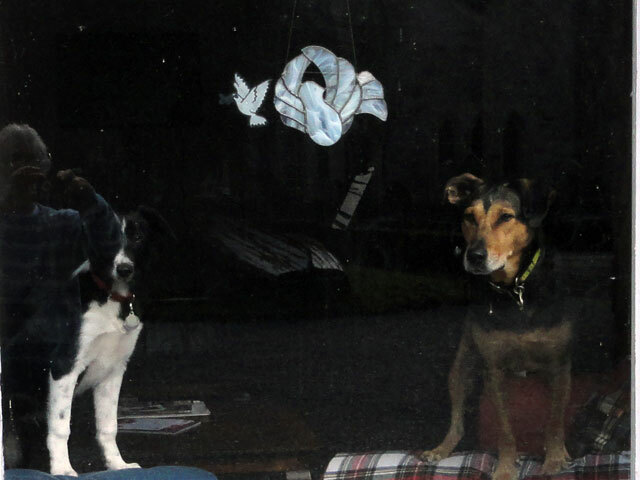 I was out in front of the Manse at Luss saying good-bye to Robin and Glenys who have been with us for a few days when I saw the two dogs, Rowan and Mix, looking through the window. I knew the sun was shining on the window and I knew my reflection would appear in the picture but still I thought I would snap the dogs before, seeing me, they rushed for the front door -- and I rather like the result. Both Rowan, the little border collie puppy of around four and a half months, and Mix, the nine-year-old rescue-dog mongrel with a bit of Doberman in him, have, of course, already visited the Granary and have inspected their new home. Both seemed to be pleased with what they saw but here in this picture they are watching as Rachel and I said good-bye to Glenys and Robin whom we met last year when we were in South Africa so that I could deliver the annual Saint Columba lecture, first in Johannesburg and then at Capetown. It was a good experience and it has been good to catch up with Robin and Glenys. The real surprise for me occurred last night as I was walking with them around the village. They were talking about their niece and her husband, a dentist from Kirkcaldy, and I suddenly realised that they were talking about Donald who, many years ago when I lived in Buckhaven, was not only my dentist, but my golfing partner and a fellow member of a local Gilbert and Sullivan company in which we both sang. It really is a very small world! Rachel (centre) with Glenys and Robin. Before saying good-bye, I had been in Helensburgh at my physio -- what a difference she is making to my tired old body. My posture is improving and I feel so much better. 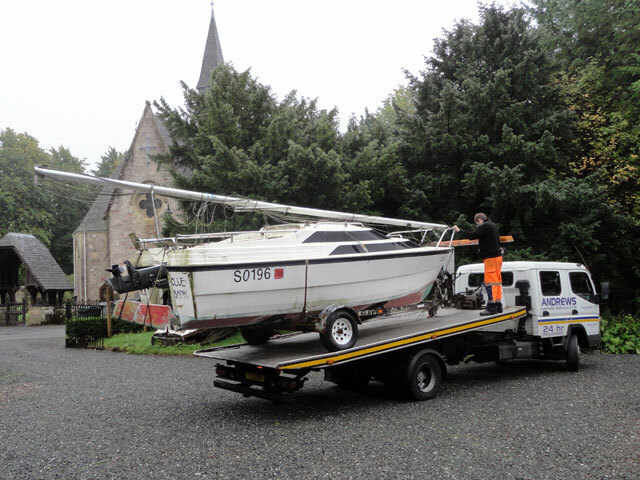 After the departure of our South African friends, I dealt with some pastoral matters, answered emails, prepared services, went down to Balloch to meet Jonathan and Vivienne who have come up to Loch Lomond with their boat and who will be staying with us for a few days. Then it was off to see folk before returning to the manse to continue with work in the study. 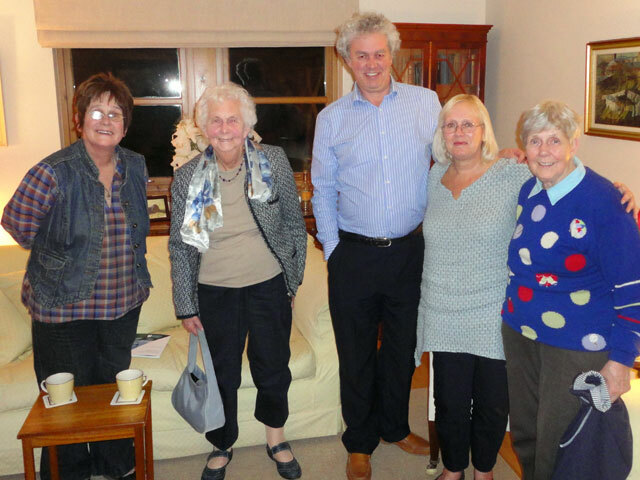 In the evening there was a meeting with some of the congregation of Luss at which we discussed the role of an elder in the Church of Scotland and looked at the challenges and opportunities facing our congregations in the coming months and years. It was a good meeting. Rachel, meanwhile, was out searching the highways and byways of Luss, along with half the population of the village, for a missing dog (not one of ours on this occasion). There was a happy ending to the story as the dog ran by (and then into) the manse and was able to be reunited with its by now distraught owners -- and in true Biblical fashion, there was general rejoicing at the return of the lost prodigal. Down at Mount Pleasant the work of moving-in has continued apace. 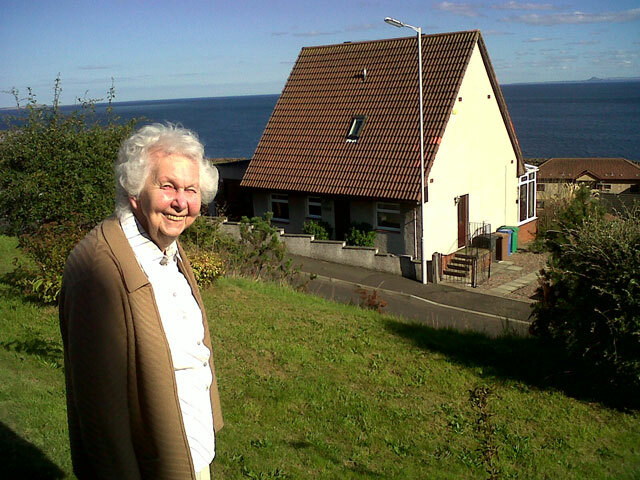 Mum is now happy in her upstairs sitting room and tomorrow is the great day when she gets her new telephone-line and her broadband and will be able, once more, to be in touch with the world. Monday 9th. September, 2013 -- Making Things Safe! A view of the Granary back garden now securely fenced and dog-proof! 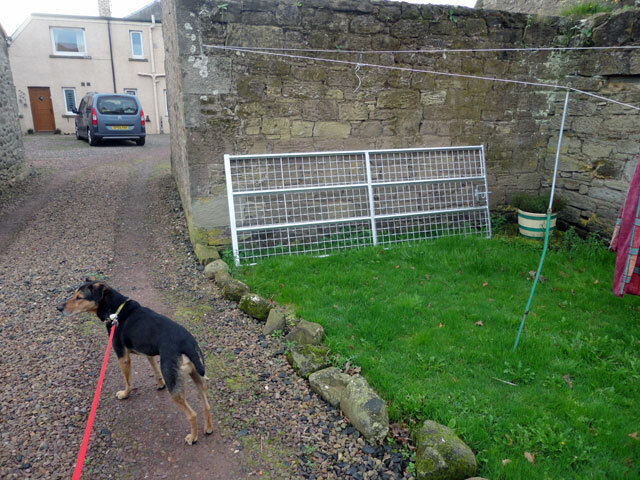 While I am up in Luss Tom has taken charge of having the back garden at the Granary securely fenced in. This means that once we get down to the Granary the dogs will be able to wander in and out of the house without any worry about them running away, getting caught on the road, or disturbing animals -- and there is clearly lots of room for them here. The photo was taken by Dorothy and sent to me by email. Meanwhile I continued to work in Luss -- there are lots of people who have issues they think I can help with and who would like to speak with me before I retire. I started work on the services for Sunday because there will be little time later in the week and I started tackling some of the paperwork which has to be done before I retire. Of course, there were boxes to be filled as well, and so the packing marathon continues. 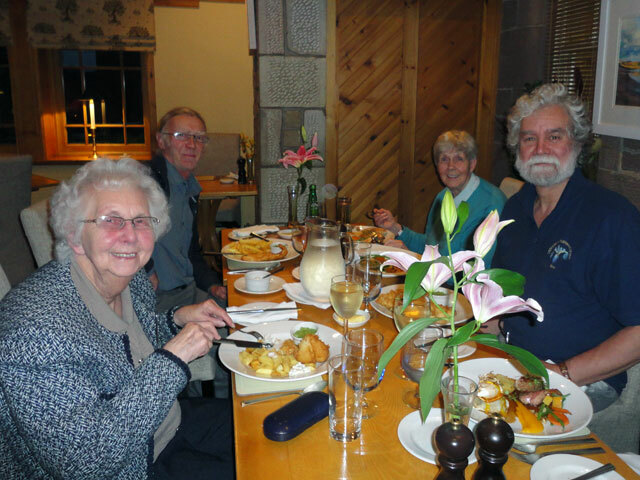 In the evening we went out for a meal with Robin and Glenys from South Africa -- they took us to The Stables in Alexandria and I enjoyed Cullen Skink followed by a beef burger covered in blue cheese (with ice cream and chocolate sauce to help it all down)! It was a pleasant evening. Spoke to Mum on the telephone. She is enjoying her new upstairs sitting room (and her television). A friend of Tom is coming at the weekend to see about painting her new sitting room. Things are beginning to take shape. Sunday 8th. September, 2013 -- Another Busy Sunday! This is a picture of one of the Churches which is in my care until the end of this month. I have actually been minister here for almost fifteen years -- and they have been happy, happy years. 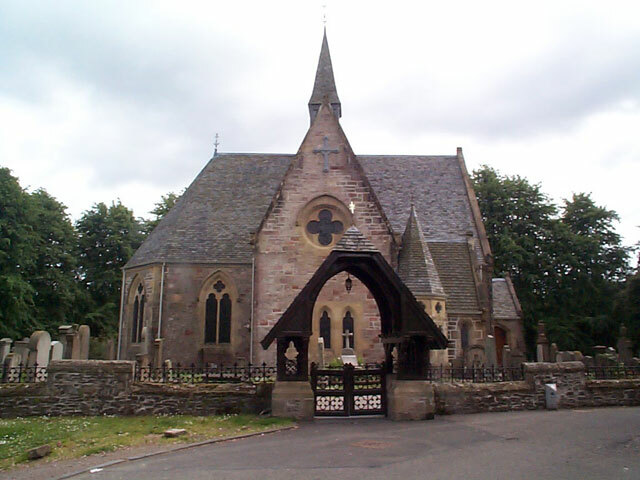 Luss Church sits in the village of that name, on the banks of Loch Lomond. The tiny village welcomes around 750,000 visitors each year and the role of the Church community is to share in that welcoming and to help those who come merely as visitors to leave as pilgrims. That isn't as fanciful as it sounds because Luss has long been a pilgrimage place. Its story goes right the way back to the year 510 when a Celtic missionary called Kessog came to Luss to bring Christianity to the people who lived on the banks of Loch Lomond. He didn't come because Loch Lomond was a beautiful place to be but because this was where three of the ancient Scots Kingdoms met and if one wanted to be a missionary this was the place to be. As well as teaching the folk of Luss about God's love for them, Kessog set out on a number of missionary journeys, one of which saw him travel around the south of Loch Lomond, north through Callander and Comrie and away up to the north east of Scotland were he visited Elgin before making his way to Inverness (where North Kessock remains as a reminder of his journey). 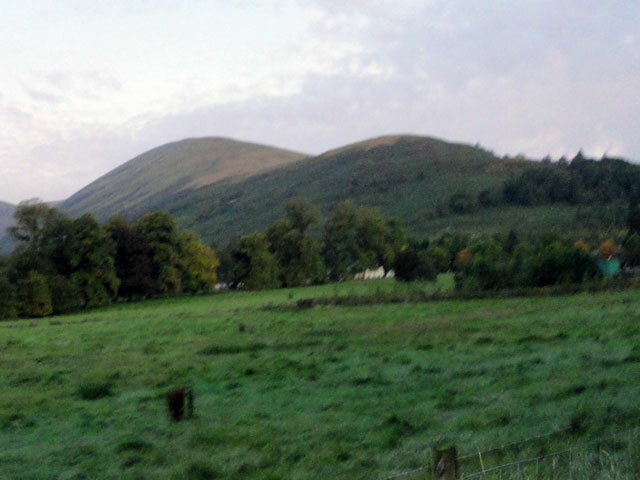 In 520 Kessog was murdered by druids a mile and a half south of Luss and buried here. It is hardly surprising that Luss became a place of pilgrimage as people came to the burial place of such a great man to seek his help in reaching the ears of the Almighty. That dark age pilgrimage seems to disappear into the mists of time but it emerged again in 1314 after the battle of Bannockburn. King Robert had come to Luss to pray at the Church before the battle and had appropriated Kessog's bishop's staff to carry before his troops on the day of the battle -- he had also come because there was wood for his archers on one of the local islands. The battle was, of course, a huge success and on 18th. March, 1315 King Robert returned to Luss and gave thanks for his victory at the Church, also awarding a three-mile girth of sanctuary around the Church -- three miles in every direction (over land and water) in which people were free from the rigours of the law unless they had committed a capital crime -- in recognition of the importance of Kessog to the Scottish troops. It is little wonder that Luss became again a place of pilgrimage. In fact so many people came to Luss on pilgrimage that in 1429 Luss Church was raised to the level of a prebend of Glasgow Cathedral -- a mark of its growing importance. Of course, pilgrimage died out at the time of the Reformation in Scotland (it reached Luss in 1562) but it quickly became clear to us that Luss today with its thousands of visitors would be not dissimilar to Luss then with its thousands of pilgrims. The only difference is that today we welcome tourists, then they welcomed pilgrims. Our task was clear -- to help present day visitors become pilgrims. How we have set about that over the last ten years is a story in itself but it is one which I will share as this diary progresses. 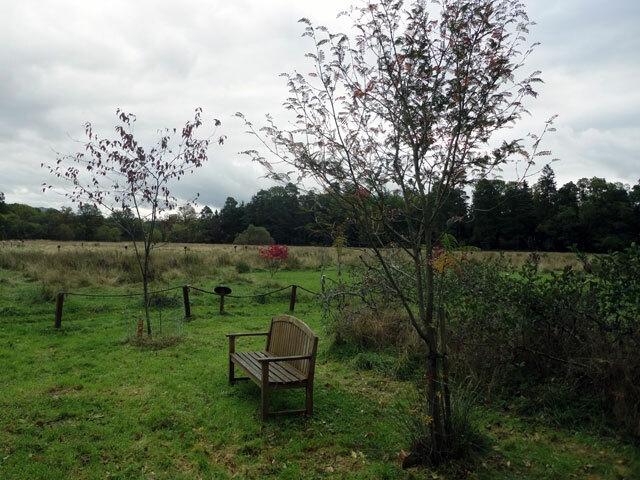 Suffice it to say for the present that we have built a Pilgrimage Centre and designed a series of pilgrimage walks on the twenty-five acre glebe which sits behind the church and across the little river known as the Luss Water. With these facilities we welcome visitors, run an international youth project, work with local secondary schools and Prince's Trust teams, conduct weddings for couples from around the world and from the church we broadcast our Sunday services to a congregation drawn from more than fifty countries each week. But I really set out to describe today's activities. We started with our two morning services -- first at Arrochar at 10 in the morning and then at Luss at 11.45 a.m. At Luss there are always lots of visitors; in Arrochar this is rarer although today we did have a couple who were celebrating their sixty-eighth wedding anniversary and were on holiday in the village. It was good to have them with us. After the Luss service, while everyone was having coffee in the Pilgrimage Centre, I met with couples who were planning to be married here -- four couples this week and two couples who had been married here and had come back to tell us how they were getting on (one couple bringing with them their lovely little baby). As soon as I was finished with wedding couples I met a family for whom I will be conducting a funeral later on in the week. Together we drew up a service and we worked out the life-story which I will relate as part of the celebration of Robert's life. As this family left a party of pilgrims from the Roman Catholic Church community in Cardross arrived. We shared in afternoon tea in the Pilgrimage Centre, went to the Church for prayers and to see the sound and light show telling the story of our Church and then we set out to the glebe to walk one of the Pilgrimage routes. The weather was far from kind and the pilgrimage journey was shorter than it would otherwise have been. But that didn't matter because our visitors will return for a full pilgrimage adventure later on. Bill, Morag, Cathy and I got everything tidied away and as they all left Robin and Glenys from South Africa arrived at the manse. We all went off to the Village Rest for something to eat -- I had haggis followed by haddock and chips, washed down with diet coke -- and then we came back to the manse for coffee and chat. Walked Mix and went to bed. It had been a full day and a happy one! Saturday 7th. September, 2013 Back in the Parish with twenty-three days to go. Here is another view of the Granary from its garden. I'm back in Luss and you can read that 'twenty-three days to go' in two ways, both of which are true. Twenty-three days and I will be able to start to do some of the things that I'm looking forward to doing down in Duns -- but only twenty-three more days to continue with the work which has been my life and which I love and continue to love! So no wonder I am a little confused. This morning I prepared services for tomorrow in Arrochar and Luss. Then there was a wedding to conduct and after that I went up to Arrochar to see a couple in the congregation who are really good friends of mine. Back to the Manse to arrange a funeral for next week and then just a bit of time before a couple arrived from South Africa -- Glynis and Robin whom I met at St. Columba's Church in Johannesburg where I delivered a lecture last year. We dined with them and then, after I had walked the dog, it was time for bed. Spoke to the family down at Mount Pleasant. Mum has decided to have a sitting room upstairs -- it's a lovely, light room and not only does it have a water supply for teas and coffees but it has a working television aerial point so she can start to catch up with 'Neighbours'. The three of them (Mum, Olive and Digger) joined Scott and Sue at the Siamese Kitchen for a Thai meal this evening. By all accounts everyone had a very enjoyable meal. We all breakfasted together in the farm kitchen. I should say that by this time I had taken Mix for a very lengthy walk, had enjoyed a glorious shower and had been to the Duns Golf Course and joined! (I'd seen a web-site advertising the fact that they were having an open day tomorrow with a special rate for those who came along to join. So I contacted them and said I couldn't come tomorrow because I was still working but could I take advantage of their special offer and they said, 'Yes'.) I explained that I hadn't golfed since I lived in Fife but I think that they are desperate for members and I would love to learn to play again. The lady in the office who welcomed me -- and I did feel welcome -- was called Lorraine and she told me that pensioners day was Wednesday (it might have been Tuesday I didn't take it in as I haven't really got used to think of myself in those terms). The golf course is nine minutes drive from the Granary. Anyway here we are around the breakfast table. 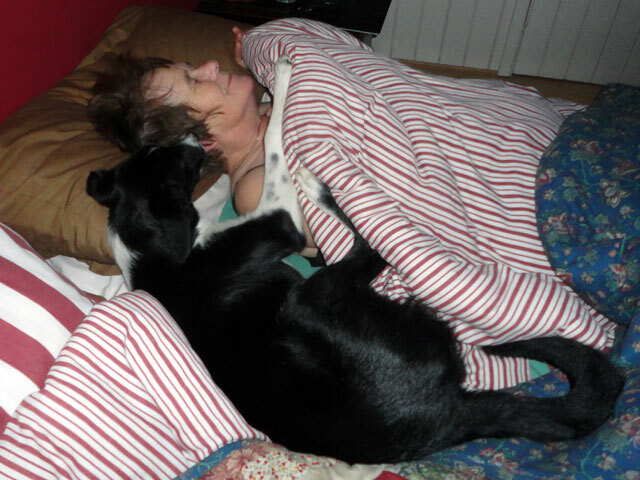 Mum was extremely sleepy because she had been woken at 3.15 a.m. convinced that there was a prowler in the house. After an hour of listening and worrying she got up determined to confront the nocturnal visitor who turned out to be a cat! She hollered for Olive and Digger who evidently sleep soundly and it was some little time before they could be raised and the cat evicted from the property -- by which time Mum was ready to move back to Kirkcaldy. We spent the rest of the morning moving in a wardrobe for Mum, setting up her computer -- broadband arrives with her new phone line next Wednesday -- and carrying furniture around. By the time we left at lunchtime Mum was almost organised. Rachel and I drove back to Luss in my car with both dogs in time to conduct a wedding rehearsal, have something to eat, walk the dogs and retire to bed. Just now it doesn't matter which bed, all are equally comfortable and it is really good to climb in and fall asleep! This isn't a very good picture -- I took it on my telephone -- but it summed up today. 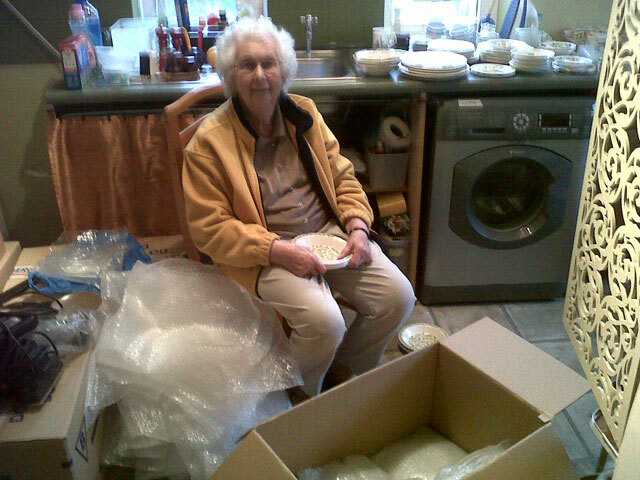 Mum sitting in one of her rooms in the farmhouse emptying boxes. The farmhouse is a very large house and is being shared by my sister and her husband and my mother. 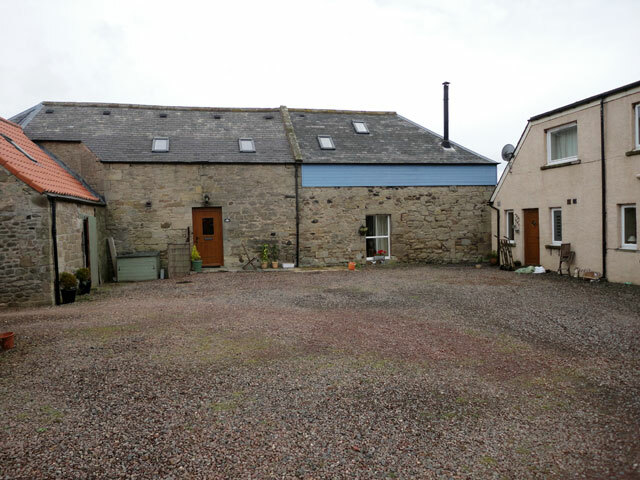 The ground floor centres around a large farm kitchen, a huge lounge and a bedroom, a morning room and a very attractive bathroom with all of the facilities. My mother has taken over the bedroom and morning room as her domain and although she has another bedroom upstairs she is adamant that in general she wishes to remain on the ground floor. Upstairs there are no fewer than five bedrooms as well as a study and, of course, all of the bathroom facilities. They will all have plenty of room and there will be loads of room for visitors as well. While Mum toiled with her boxes, Olive and Digger moved furniture, and Rachel and I met with Tom and a local handyman to arrange to have additional fencing installed in order to ensure that one part of the garden was totally secure so that Mix and Rowan could be allowed to enjoy the garden without fear of them going walk-about. The work will be done on Monday. We also started to bring furniture into the lounge. 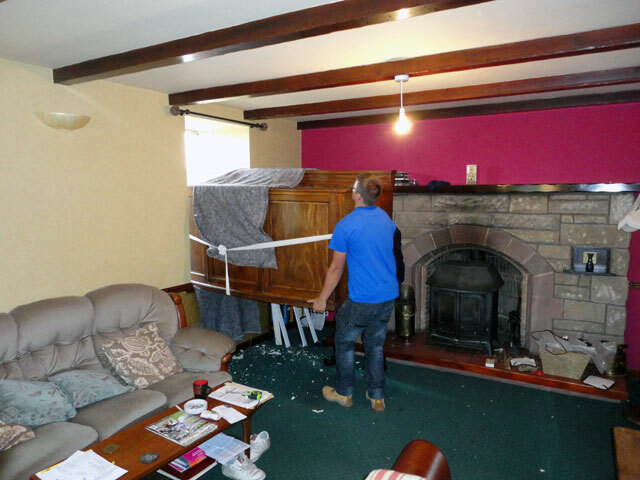 It wasn't the carrying of the furniture which was the problem. It was the finding it first -- raking through barns until we had identified the things we were looking for. In fact it was well into the evening before we had the lounge as Rachel wanted it to be. In between times we had been on a shopping expedition to Duns -- it really is just five minutes away -- and had enjoyed an excellent meal in the farmhouse kitchen. 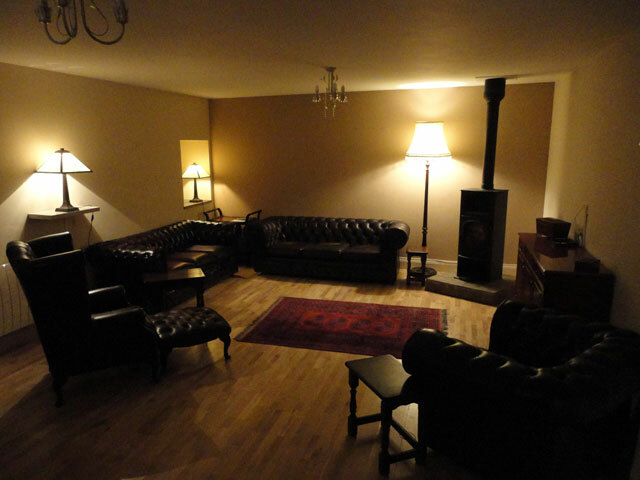 Afterwards we all went back to the Granary for coffee and after everyone had left I took this picture of how the lounge had ended up. Doesn't that wood-burning stove look inviting? It was good to get down onto our futon and fall asleep. My sister has been counting down from sixty-two days (the time she sold her home and became homeless) and now the great day had arrived. Mum travelled down in the removal van with Malcolm and Allan; Olive and Digger drove from Luss, setting out in good time to be at the Borders before 2 p.m. (the hand-over time) and Rachel and I set off in our own vehicles laden down with bits and pieces (and loads of food) as well as with a dog each and arrived about quarter to three. 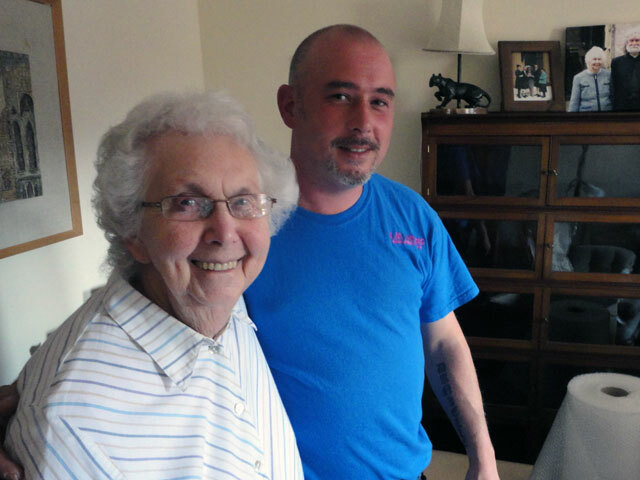 Mum's removal men, Allan and Malcolm, were fabulous and I would recommend them to anyone. 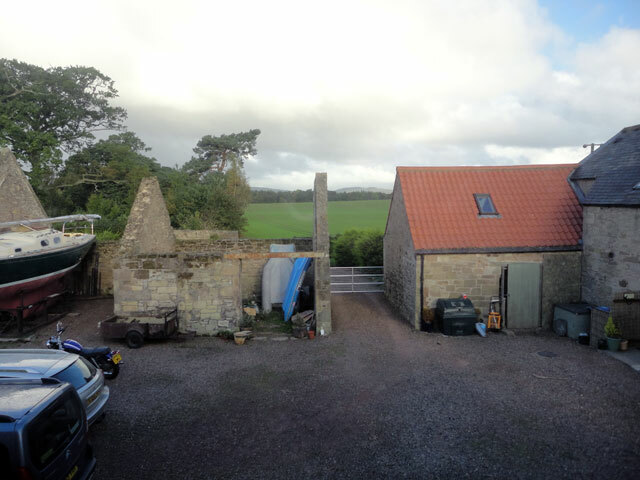 It really didn't take them long to unload all of Mum's possessions and furniture and move her into the farmhouse -- her bit of the farmhouse is the bit you see at the right of the picture above. Meanwhile Olive and Digger started unloading their furniture from one of the barns (there are four big barns)while Rachel and I contented ourselves with unrolling a matrass and setting it out on the floor of our bedroom. That's all the furniture we had for day one -- a grand piano and a matrass. But we were happy as pigs in muck! (which I've always thought was very impolite to pigs). At seven our first guests arrived -- in addition to my Mum, Olive and Digger, we welcomed my brother Scott and his wife Sue; and Tom and Dorothy who live just a few moments away from Mount Pleasant. Our home -- the granary -- is the building in the photo at the head of this entry. All we had in our lounge was the grand piano but Rachel had made a lovely meal of Italian antipasto, followed by pansotti and several different sauces, followed by cheese and birthday cake (it was my sister's birthday, just to add to the celebrations) and my sister-in-law, Sue, had brought along a superb trifle. We drank German prosecco brought to us by our friend Brian when he was across recently and had a great evening. We had arrived and my mother, sister and her husband had now moved in -- and we were in the Granary and it is wonderful. Just to tell you a bit about the Granary: there is a lovely kitchen, a very large lounge and a shower room on the ground floor and on the first floor there are two bedrooms both with their en suite facilities, one with a shower and one with a bath. Once we get them furnished I'll post pictures but that will be a little while yet. It was good to collapse onto our futon and soon I was asleep. Mum standing outside her home after most of her possessions have been packed and put into two large removal vans in preparation for the journey to the Borders tomorrow morning. There was time for several cups of coffee. One of Mum's neighbours had brought in sandwiches, chocolate biscuits and a large apple tart. 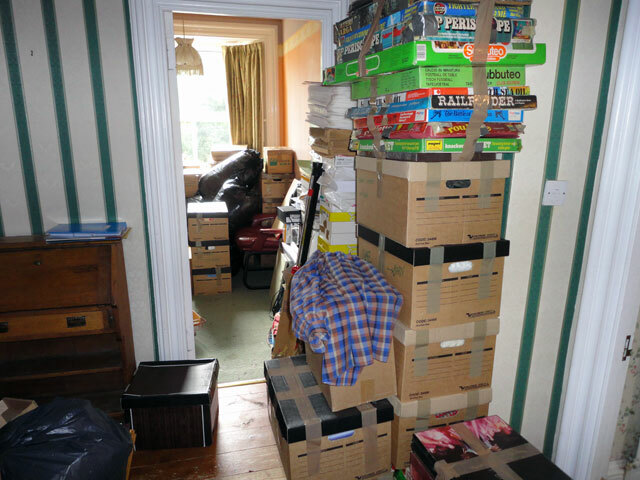 Eventually everything had been packed into boxes and the boxes had been packed into the two removal vans. Allan and Malcolm set off for home promising to return tomorrow morning to ensure that the final items (Mum's bed and so on) were carefully stowed before the convoy set off for the Borders. and then back to Kirkcaldy to the hairdresser to ensure that she looked her best for her arrival at Mount Pleasant tomorrow morning. It's Monday and we become the owners of our new home on Wednesday at 2 p.m. I got confirmation from our solicitor today that all of the money was sitting in his account just waiting for him to press the button and it will transfer to the present owners. I understand that happens sometime tomorrow to enable them to complete their purchase in England. Today we continued to put things in boxes -- well Rachel did, as I was kept busy dealing with the telephone and with all kinds of people who needed to speak to me. We managed to get my mother's telephone transferred to the new house and my sister and her husband also have a telephone line; we shall make do with our mobiles until we get settled. The picture at the top of this entry is of the farm complex from a distance. In front you see the farmhouse itself where my mother, my sister and my brother-in-law will live. The building to the right (you only see the end of it) is our granary. That's what it is, a former granary now converted into a lovely little house just right for the two of us. Mind you, we also have the rest of the barns which will be used for storage (although we have some grandiose plans as well). The small-holding area is behind the barns and belongs to Olive's husband -- he has promised us that we won't have to buy vegetables ever again: we'll see. A popular minister — who has married more than 1,000 couples at his quaint church — has announced his retirement. Rev Dane Sherrard will conduct his last service at Luss Parish Church at the end of next month after 42 years as a Church of Scotland minister and nearly 15 years leading the congregations of Luss and Arrochar. 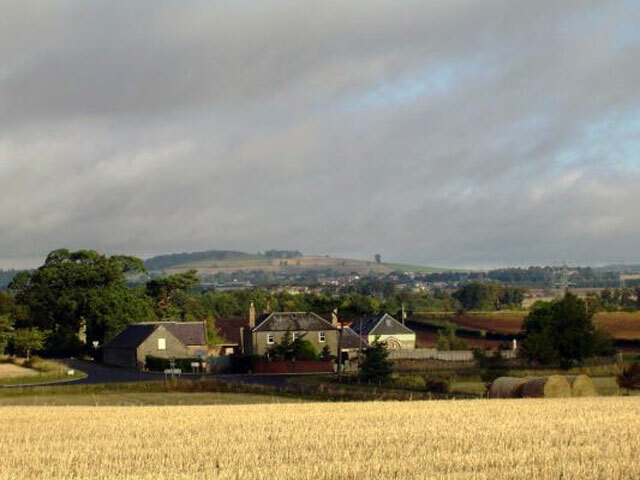 The 67-year-old told the Lennox Herald of his joy at being part of the community — which he calls the best days of his life — and sadness at leaving it all behind for a new life in the Scottish Borders. Speaking from his home before announcing his retirement to his congregations on Sunday, he said: “I am going to write a letter and give it to each person in the church because I won’t be able to stand up and talk about it — this has been my life and it will be difficult to leave behind. “It has been an adventure and if there was any way of me not having to retire, I would do it. 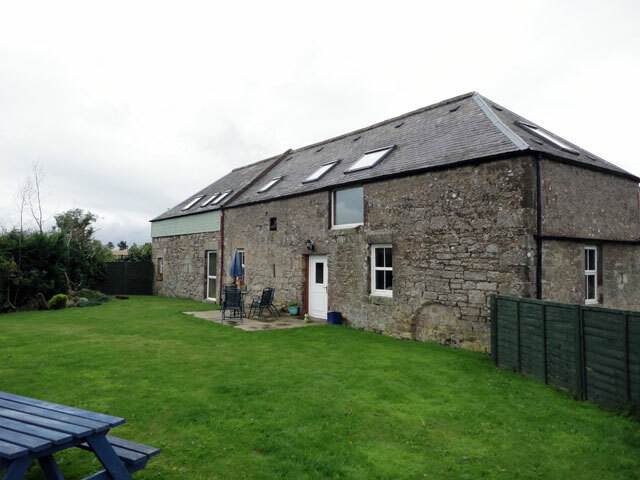 “However, we are moving to a farm steading with my mother and sister and I need to pay the sum required now to buy the property which means I have to retire. Now he fears what the future may hold for Luss and the businesses which rely on weddings at the church as he predicts these nuptials in the village may come to an end once he leaves. He said: “The new minister will take on the congregations of Luss, Arrochar and Kilmaronock which is a big task and means a lot of things are going to have to stop. “I doubt it will be possible for a minister to look after another church and conduct weddings. If that disappears I will be sorry. “I am also sorry for the local businesses which will lose out. People come here from all over the world. “This afternoon, half of the visitors at a wedding I conducted were from Greece and they will stay for a few nights, eat at the local restaurants, go for a ride on the seaplane and go home with souvenirs, wearing their kilts. As well as the weddings, Dane has been an influential and integral part of the community, helping to shape Luss as a tourist and pilgrimage destination. The story began on a rare day trip to Inveraray in 1998, whilst a busy minister in Bishopbriggs. The outing changed his and wife Rachel’s life forever. 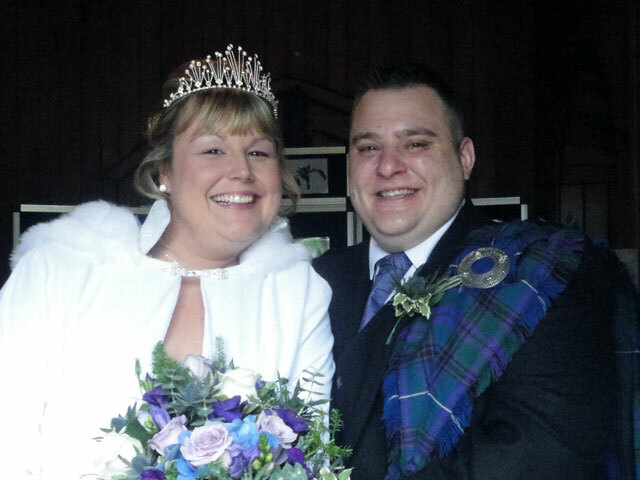 The couple made a stop in Arrochar and Dane was drawn to the once dilapidated parish church. 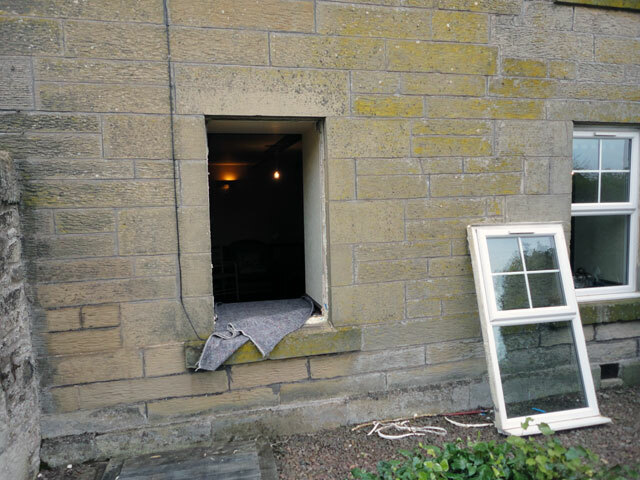 He said: “The closer we got to the church, the more run down it was until we were able to see holes the size of footballs in the windows. “The pews were piled on top of each other and the organ was covered in a plastic bag. 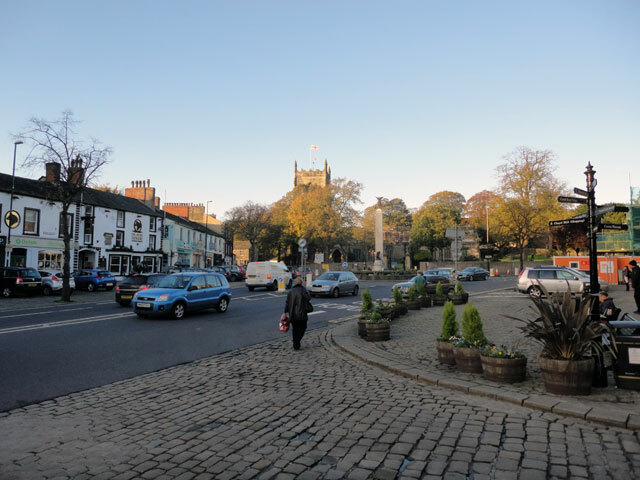 “We bumped into a woman walking her dog and she mentioned there wasn’t a minister at the church and the presbytery was considering knocking the church down. Dane took up his post months later and never looked back. 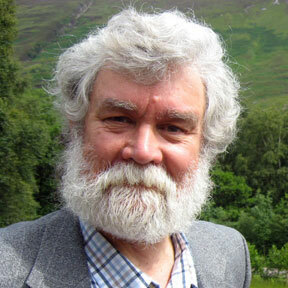 Dane has helped put Luss on the world map and, amongst other projects, he shaped the celebrations in 2010 for the 1,500 year anniversary to mark St Kessog bringing Christianity to Luss and has welcomed thousands of pilgrims from across the world. He also set up an internet broadcasting service at the church allowing people from across the globe tune into Sunday services. Now he is looking forward to taking a back seat and intends to write a book as well as indulging in his love of sport and opera. He added: “I am going to watch cricket. I’m a member of Durham Cricket Club so it’s no accident we are moving closer! “I hope to do some sailing and I am a Gilbert and Sullivan fanatic too so hope to find more time for that." Reverend Dane Sherrard, of Luss Church, who is about to retire. He fears for the future of the church, as there are fewer vicars nowadays. 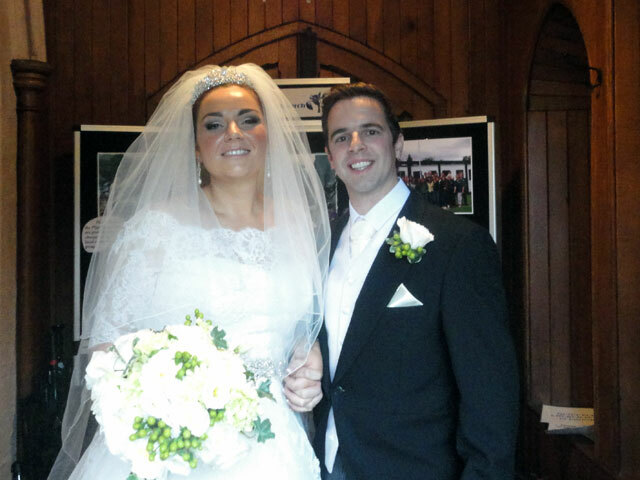 More than 100 couples a year tie the knot at scenic Luss Parish Church on the bonnie banks of Loch Lomond. Celebrity marriages in the past have included Deal Or No Deal presenter Noel Edmonds, Scots supermodel Kirsty Hume and former STV presenter Sarah Heaney. But the retirement of the parish minister may pose a threat to the future of weddings at the scenic kirk. Pension rules mean Rev Dane Sherrard, 67, is having to quit his job at the end of this month. He fears a shortage of ministers will mean his successor will have to take on an extra parish, slashing the time available for marriage ceremonies at Scotland’s most popular wedding venue. 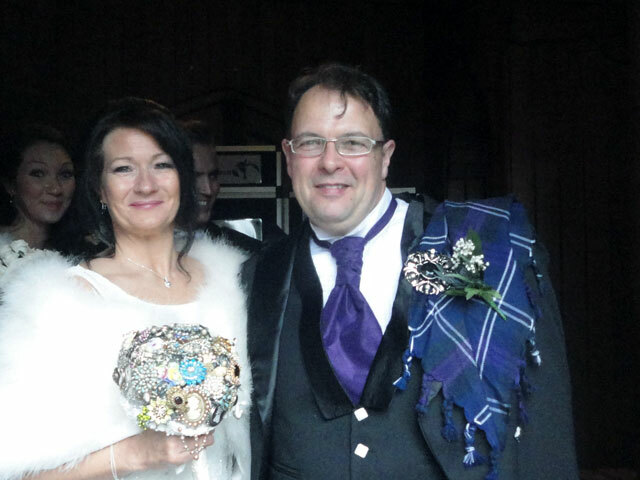 “I’ve had two churches to look after — Arrochar and Luss,” said Rev Sherrard. “If they are linked to a church in another parish then that’s going to make it very difficult for the weddings to continue. “I would certainly be very sad about that. “When I came here we were only allowed to marry people who came from the parish. But so many people from all over wanted to wed here we persuaded the Presbytery. Such is the scenic beauty, two years ago Rev Sherrard banned “cuckoo” newlyweds who were disrupting ceremonies by showing up outside to have their wedding photos taken. The village, formerly location for STV’s Take The High Road, attracts 750,000 visitors a year. 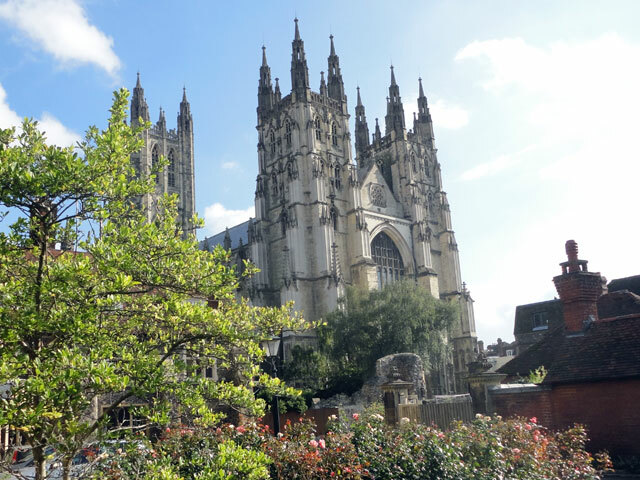 “The economic impact of the things the church does, in terms of welcoming visitors and pilgrimage as well as weddings, runs into millions of pounds,” said Rev Sherrard. The church is so famous Scottish Enterprise helped fund its own TV system to broadcast weddings to viewers abroad. People in more than 50 countries now tune in for the regular Sunday services. “I would have been happy to carry on working, my congregation would have been happy to have me and there’s a shortage of ministers in the Church of Scotland,” added Rev Sherrard. “But I chose to save through the pension fund and the rules are that I have to retire to get my savings. Wedding photographers would be among those hard hit by any major cutback in numbers. 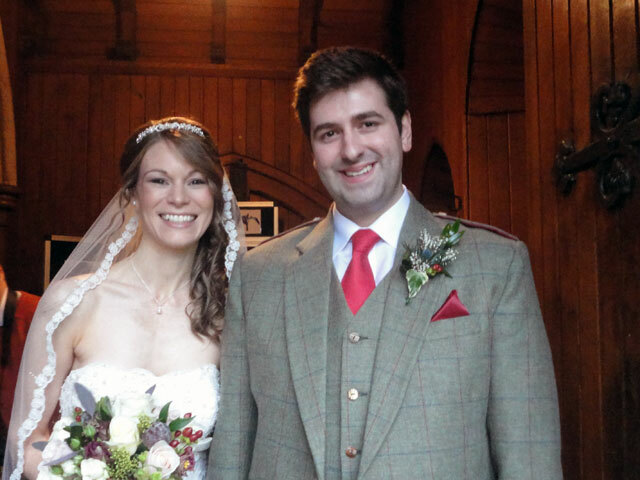 “The weddings have done a great deal of good for the area,” said photographer Graham Wilson, who was himself married at Luss Parish Church. “I don’t think for one minute there will be the same number of weddings. “A survey a few years back said the average wedding brought £34,000 to the area so there is a lot of money to be lost. A Church of Scotland spokesperson said: “We are committed to providing a minister at Luss and our forward plan indicates that it may be linked with another congregation. 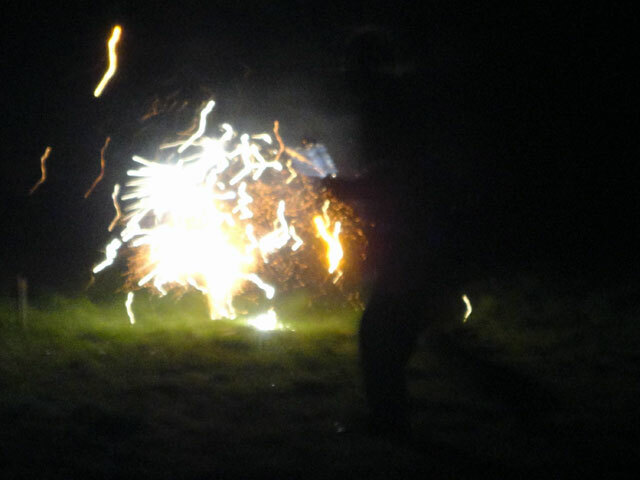 Again it was kind, but I doubt that it will endear me to the Presbytery! Both of the papers published rather nice photos of me -- I mention it here because normally Rachel says that I take a very bad photo because I haven't yet learned how to smile at a camera (when she is feeling more generous she says that it is because my beard makes me look glum)! Anyway, Olive and Digger have arrived back at the manse where they are staying until Wednesday morning. Tomorrow I expect to drive over to my mother's to ensure that her packing goes smoothly and the next day is Wednesday. What an adventure -- but the newspaper articles got it right: I wish I was having this adventure but was still able to return to my vocation here in Arrochar and Luss; that would be to have everything and I suppose that folk are seldom so lucky as that. It is Sunday the first of September, 2013 the start of a month for which I am paying the Church of Scotland £500 to be allowed to work as Parish Minister in Arrochar and Luss. Strange? Yes, of course it is -- but as you read my daily diary and get to know me better you will discover that many things are strange: but many are really good and quite exciting as well. I suppose a word of explanation would do well as a start. I am a sixty-seven year old Church of Scotland parish minister (so I am well past my sell-by date). I have been working at Arrochar and Luss (two lovely little parishes, one on Loch Long and one on Loch Lomond, both in Argyll) for more than fourteen years. I expected to be working for longer (but that really is another story). A year ago my sister Olive and her husband Robert (usually known in the family as Digger) decided with my mother that they would seek a home in which they could live together and the ideal place for this communal living was deemed to be the Scottish Borders, not least because my brother Scott and his wife Sue had recently moved there and Mum fancied the idea of having all her family around her. Rachel (my wife) and I were down at my brother's home, in part in preparation for their son Nicholas' wedding (to Amy). I had been told of this house which both Sue and my sister had seen and really quite liked. 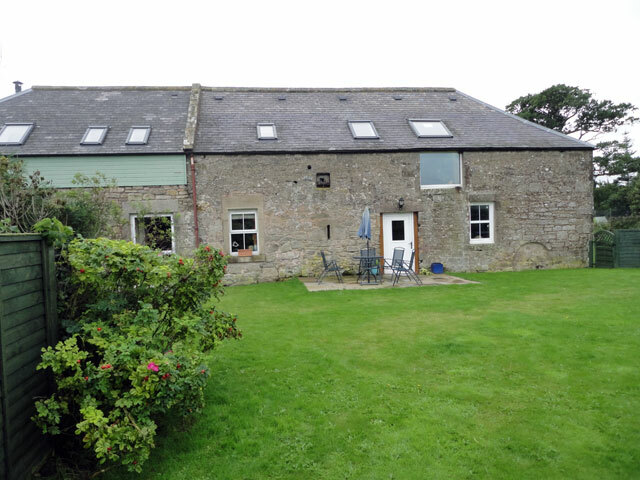 'It's a farm steading,' I was told, 'or at least it is a farmhouse abutted by a former granary which has been converted into a luxury holiday home and the rest of the courtyard is surrounded by barns -- it would be just ideal for you.' It was with an open mind that I allowed my brother to take me along to have a look over the fence at this property. And that's what we did. 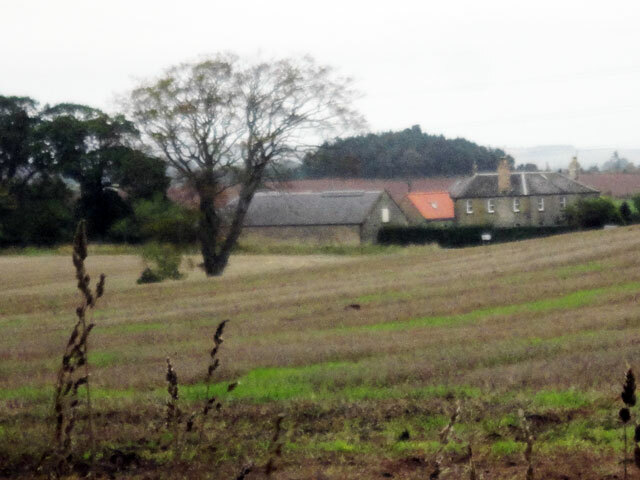 But while we were looking over at the farmhouse, Lothian (the owner) was looking back at us. 'Would you like to come and have a proper look,' he said. And so we did. However, as we talked it became apparent that Lothian and his wife Maureen were just about to take the house off the market. It hadn't sold and they disliked the uncertainty of not knowing if the house was to be sold. I wondered if they might be prepared to work with us on a long term deal to buy the farmhouse? We certainly weren't going to be in a position to buy his lovely property for a while but if Rachel and I went in with my sister and my mother and we all managed to sell our houses, it just might be possible. Lothian suggested that it was certainly something that they would consider. And so the adventure began. My sister put her home on the market and we put our West Wemyss home on the market. This was a bit of a wrench because we had got our home just right for our retirement and my study was a dream study with bookcases lining every wall. But there was clearly no way that my sister and my mother could buy the house on their own and the idea of us all living together in a commune with my brother just ten minutes away was really rather exciting. There were many moments during the year when I was convinced that our plans would come to nothing and there were moments when I thought that Lothian and Maureen would give up on us but we nursed it along and things began to happen. First my sister's home in Kirkcaldy sold and this was closely followed by the sale of our West Wemyss home. Mum's house hadn't sold but we managed to put together a financial package to make it all work. It involved me drawing down some of my lump sum from my pension, generated by my savings over the last twenty-five years. I had thought that there wouldn't be any problem in this, after all I was now well past sixty-five, but I discovered that although the government had relaxed its rules to encourage pension trustees to be flexible in allowing folk access to their pension funds the Church of Scotland had decided not to take advantage of this flexibility. If I wanted my lump sum I had no option but to retire. And so that's what I have done. There is no way that I could stand in the way of this wonderful family opportunity. My retirement is at the end of September and the Church agreed to advance me my lump sum for twenty-seven days and charged me £500 for the privilege! So that's how I come to be paying £500 to work for this month. But it will be worth it. And in just three days we shall get the keys of this new property and my mother, my sister and her husband will move in. And, of course, we shall be there along with our two dogs -- Mix a nine-year-old rescue dog (you'll learn more about him as time goes by) and Rowan -- a sixteen week old Border Collie belonging to Rachel. 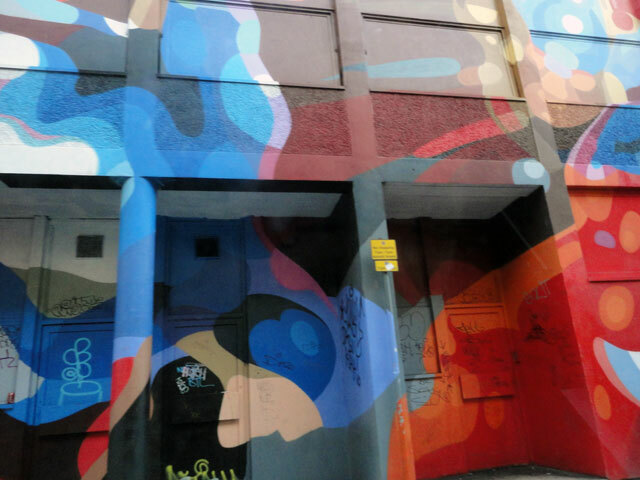 Oh, and the picture at the head of this entry, it's the entrance to Mount Pleasant. It didn't seem quite right to show you the property itself until it is ours. So watch this space.